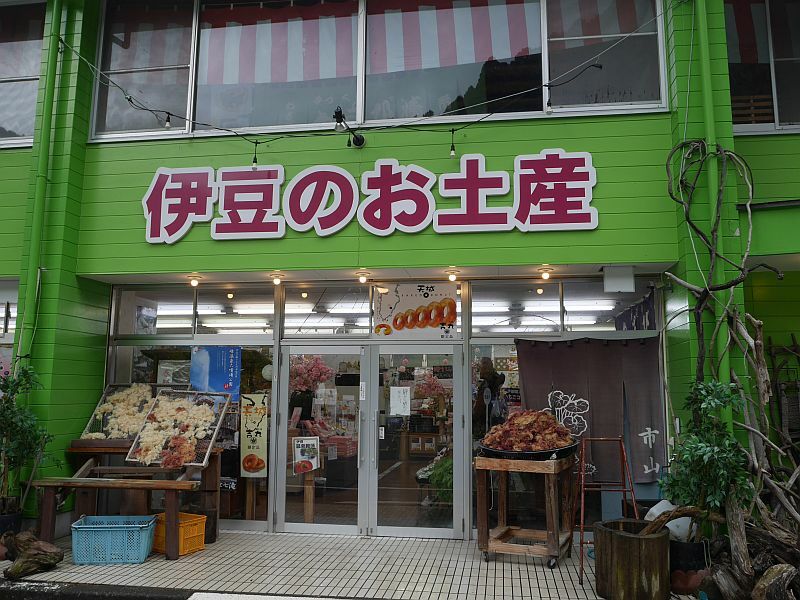 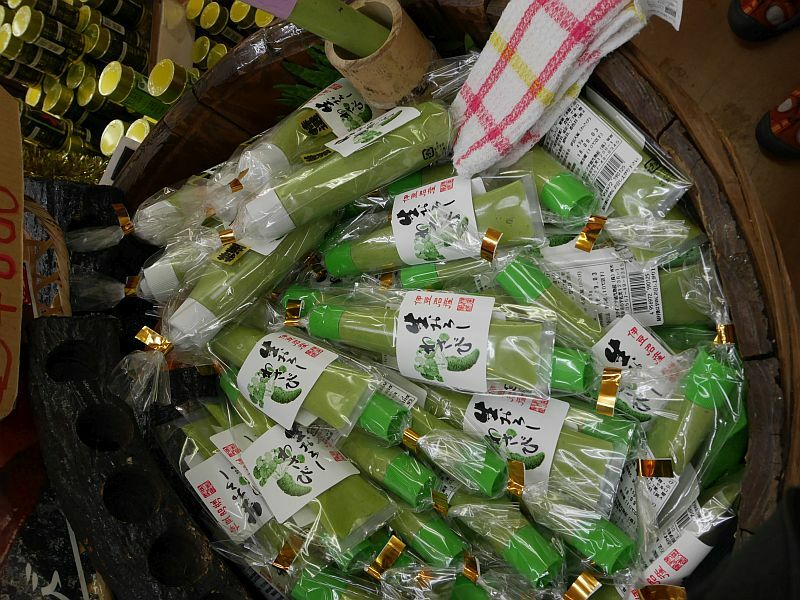 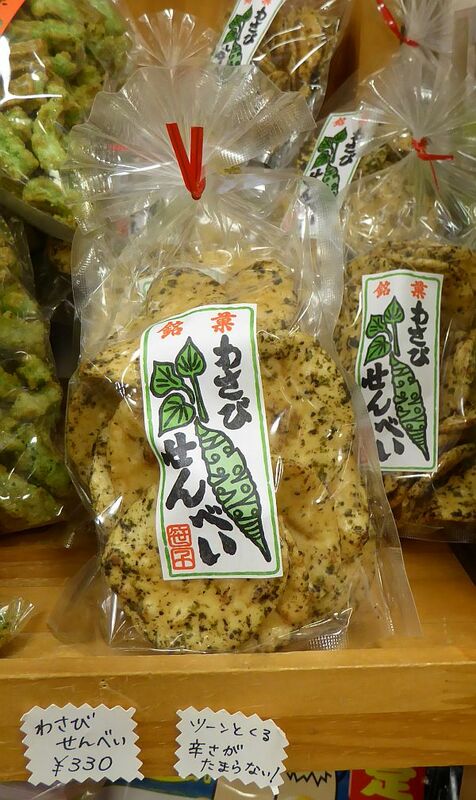 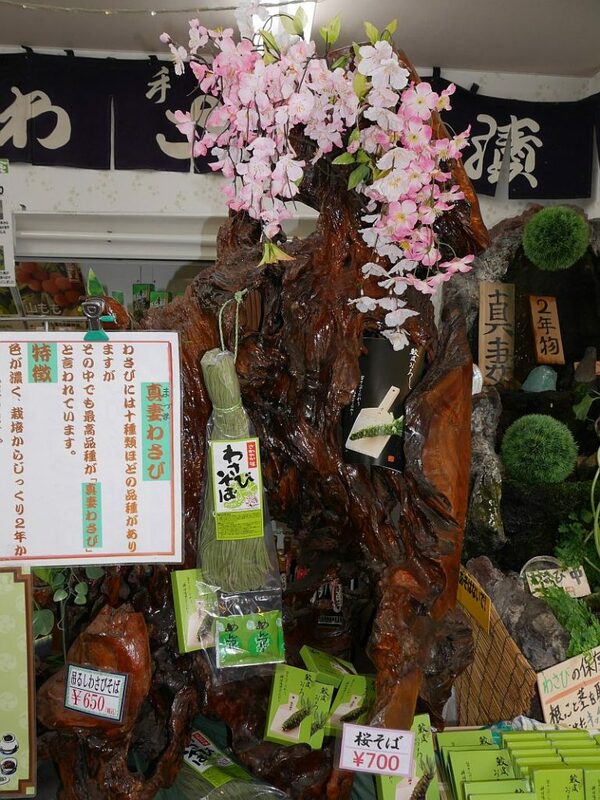 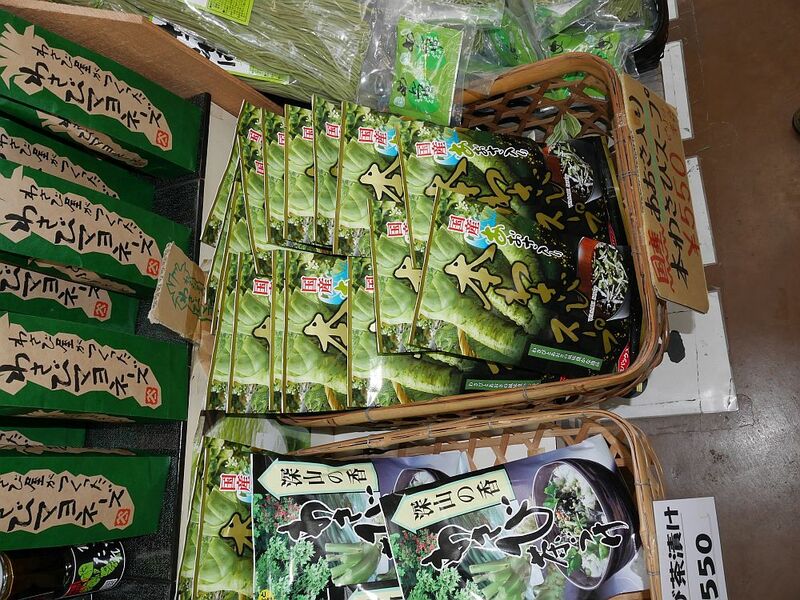 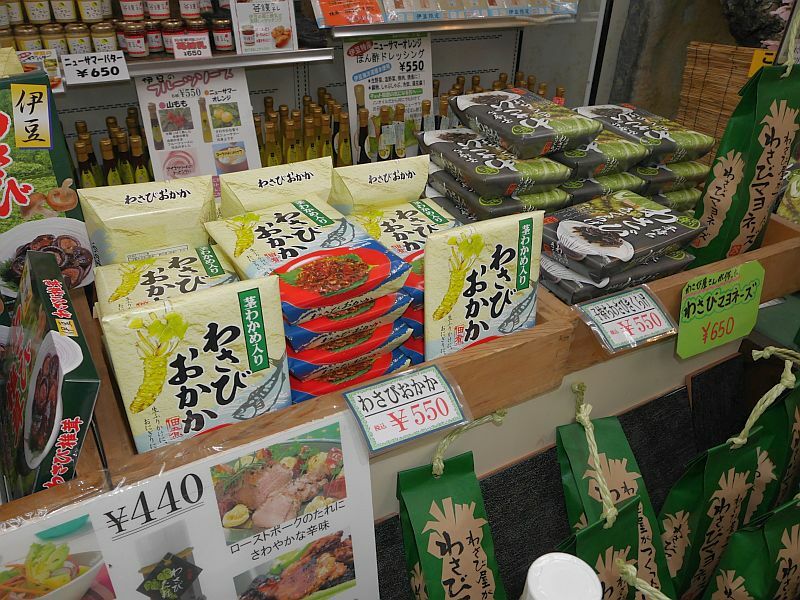 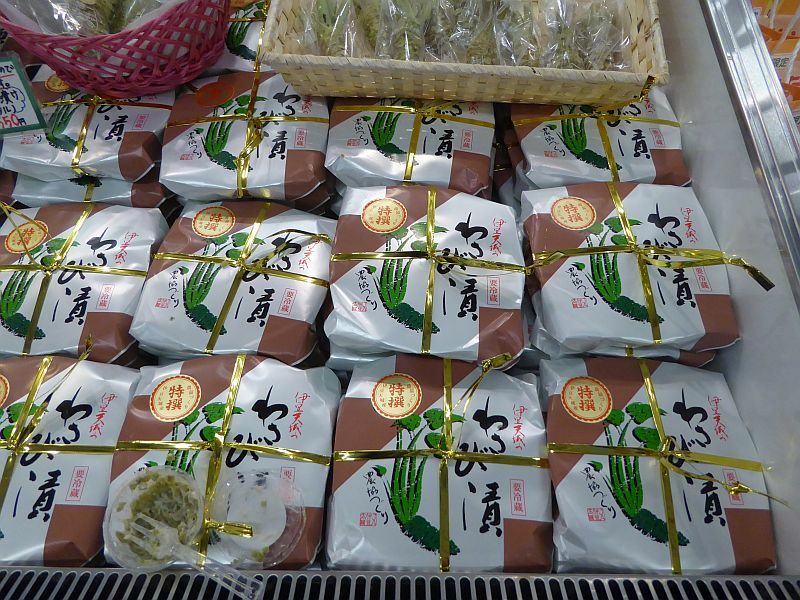 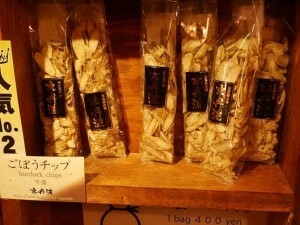 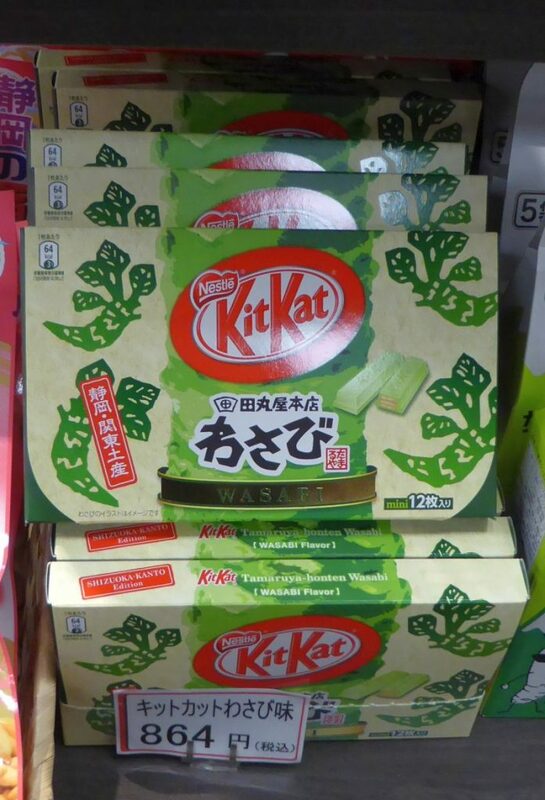 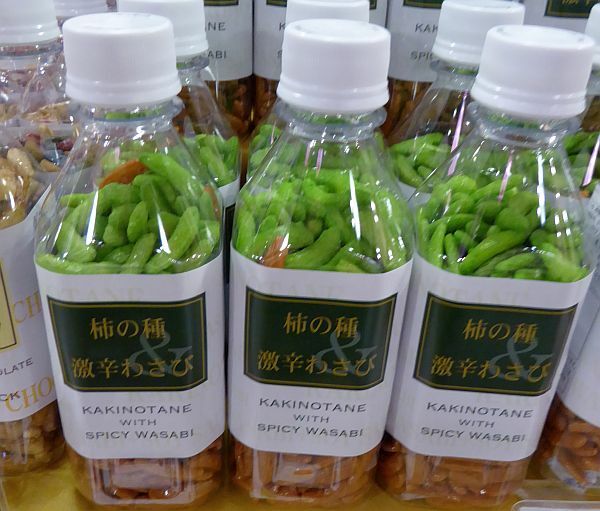 Nearby was a shop selling a myriad of wasabi products! 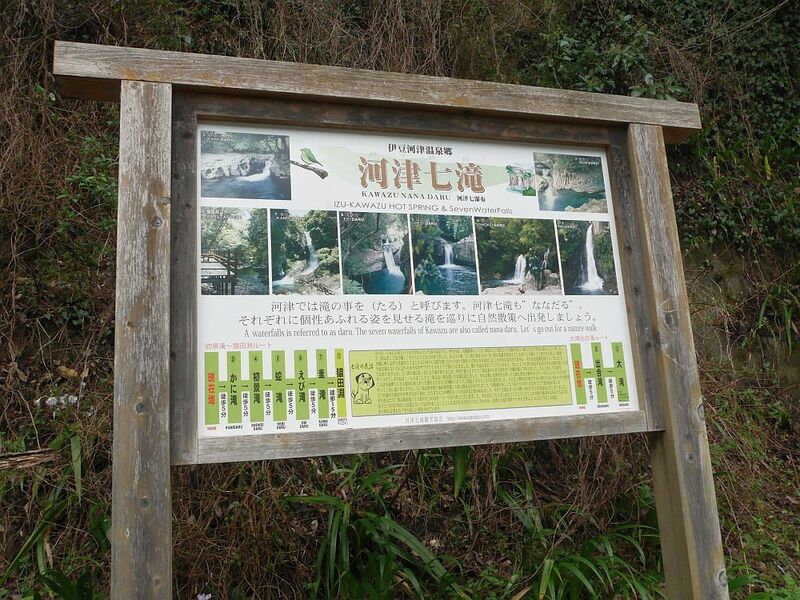 Let me know if you can translate any of the signs in the album! 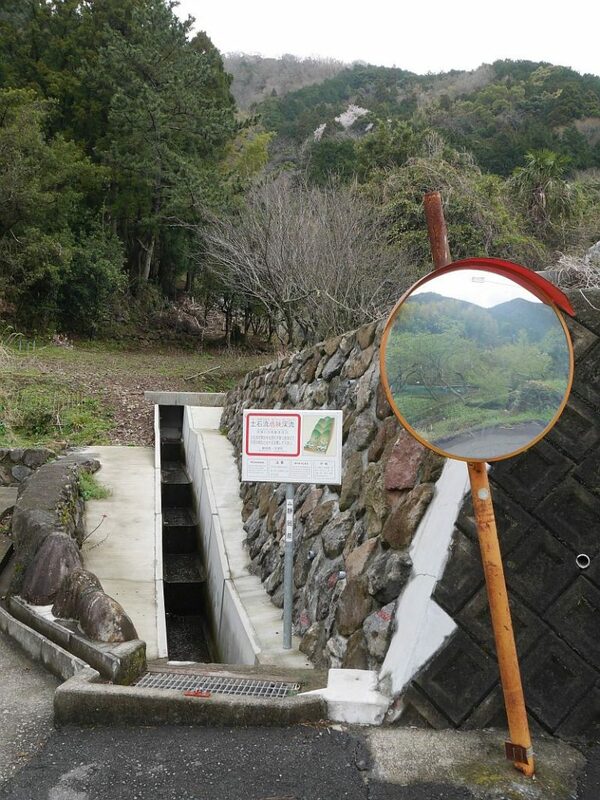 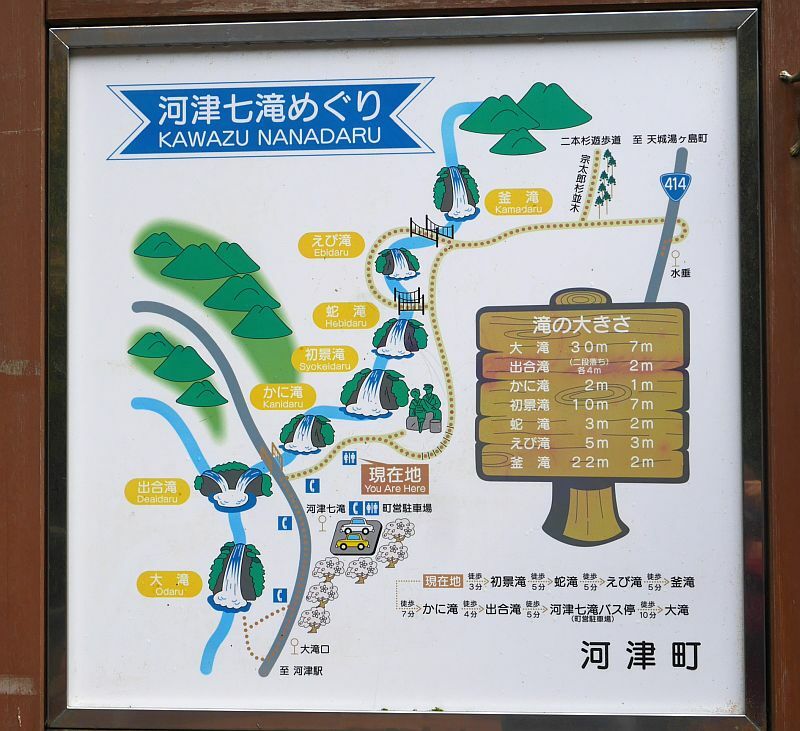 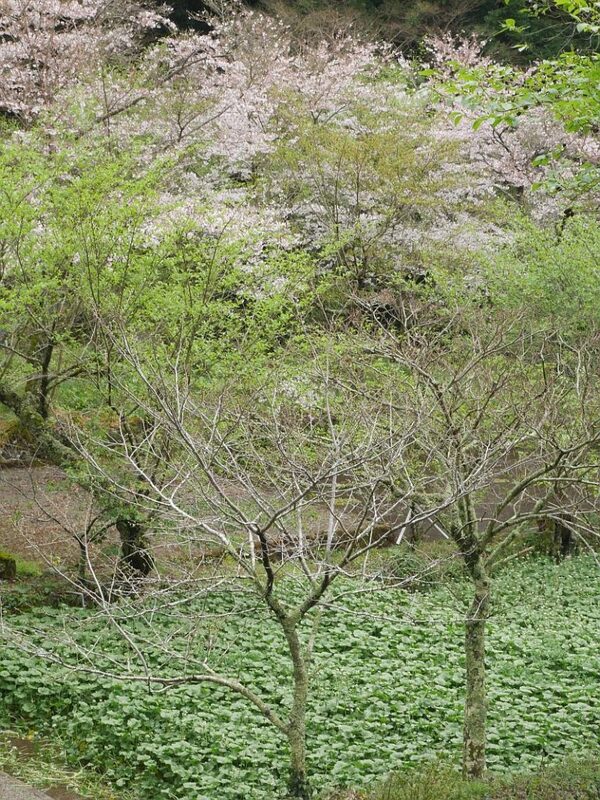 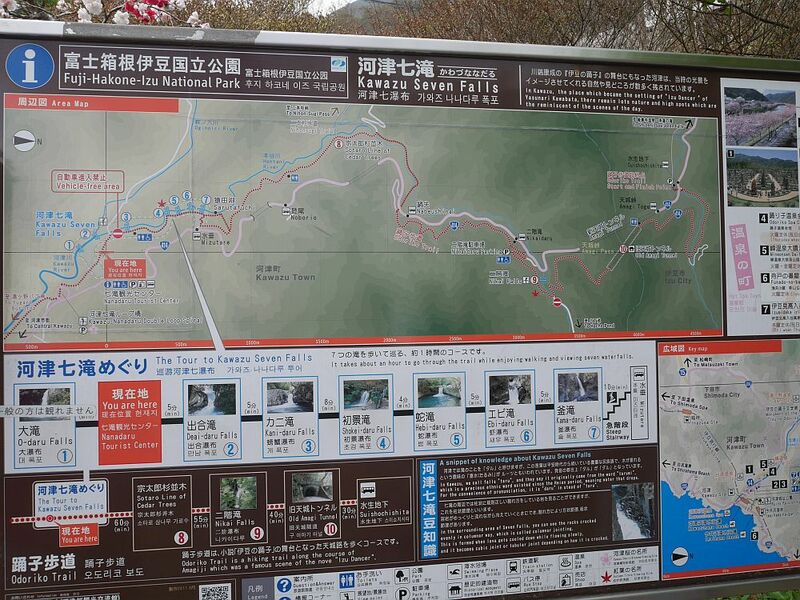 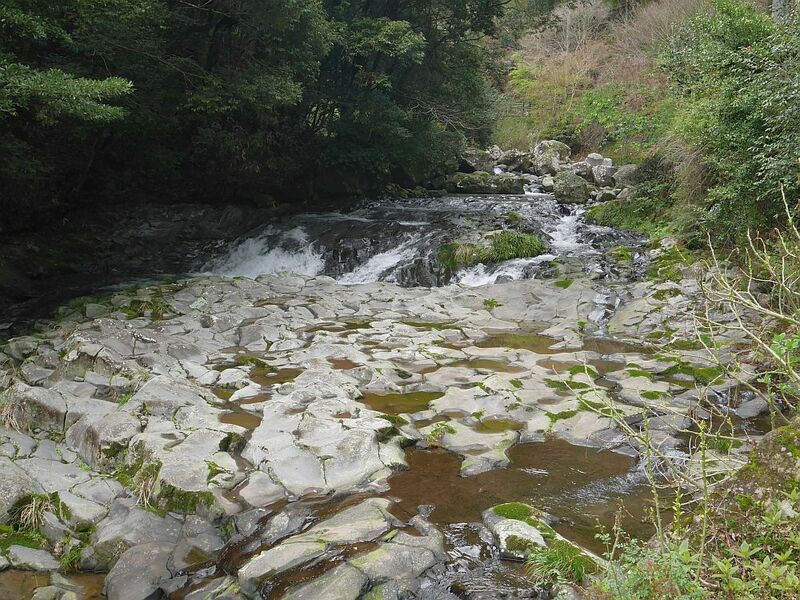 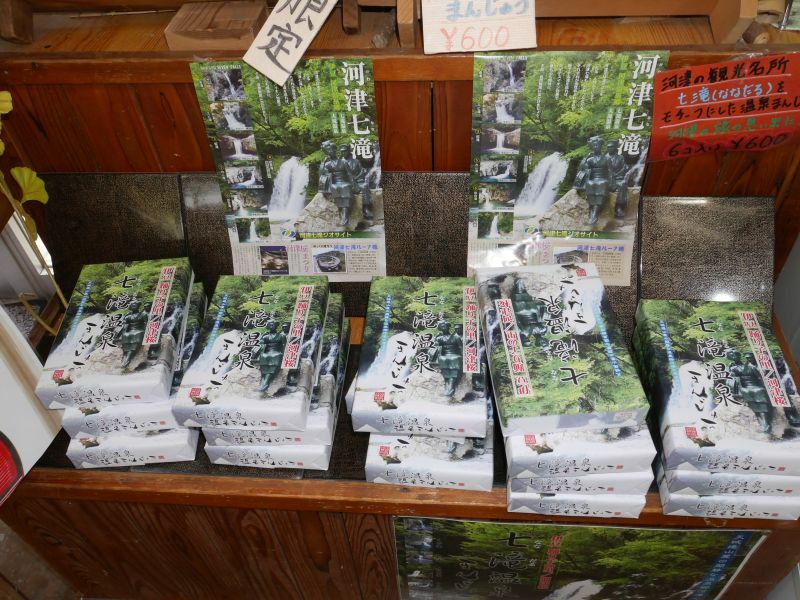 At the bottom are a few pictures from a popular nearby walk, the Kawazu Seven Falls. 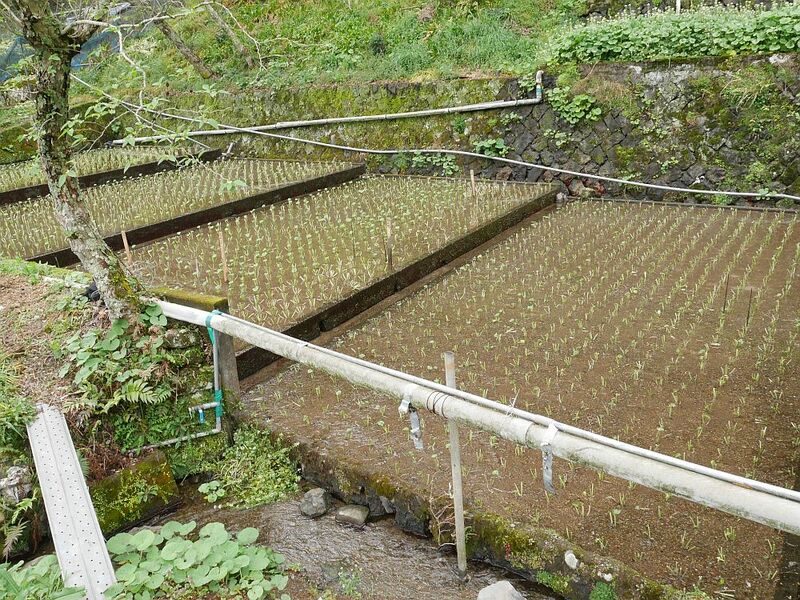 On 3rd April 2016 I was on an amazing study tour in Japan to witness first hand the cultivation of perennial vegetables. 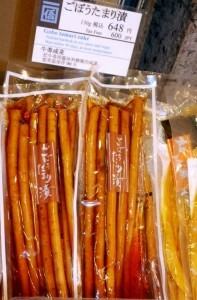 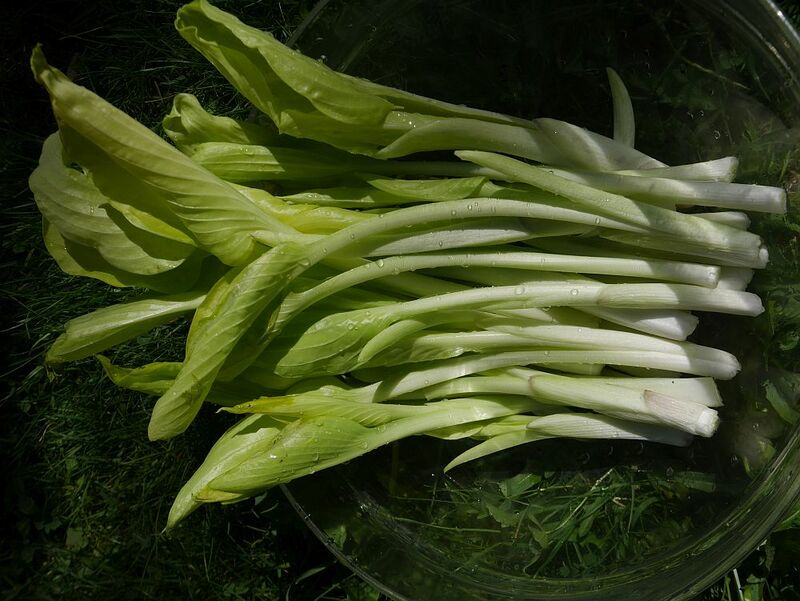 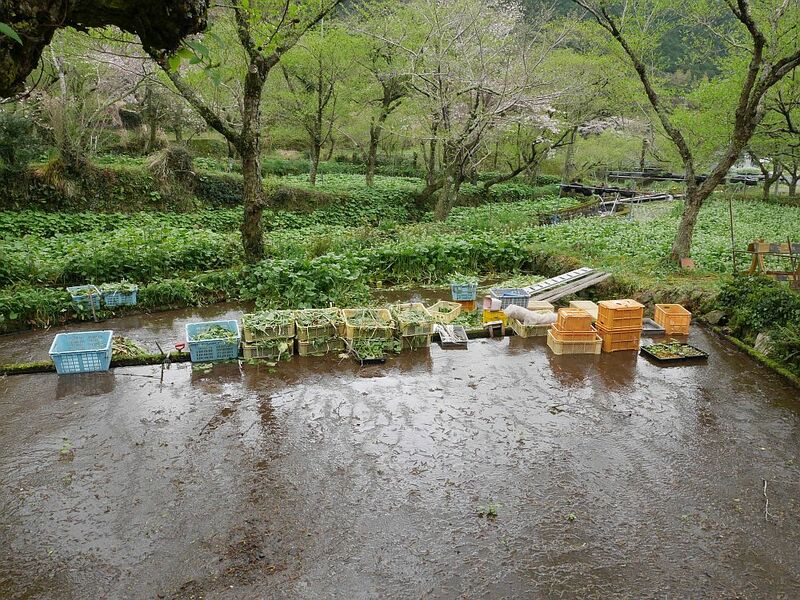 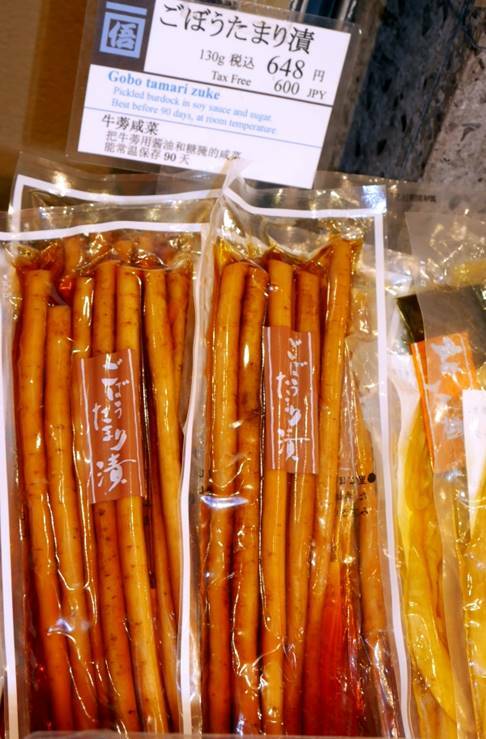 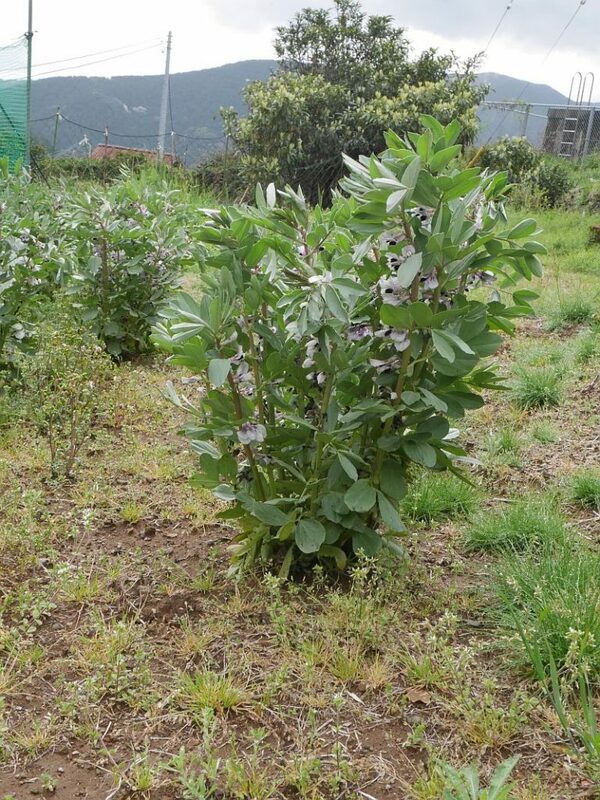 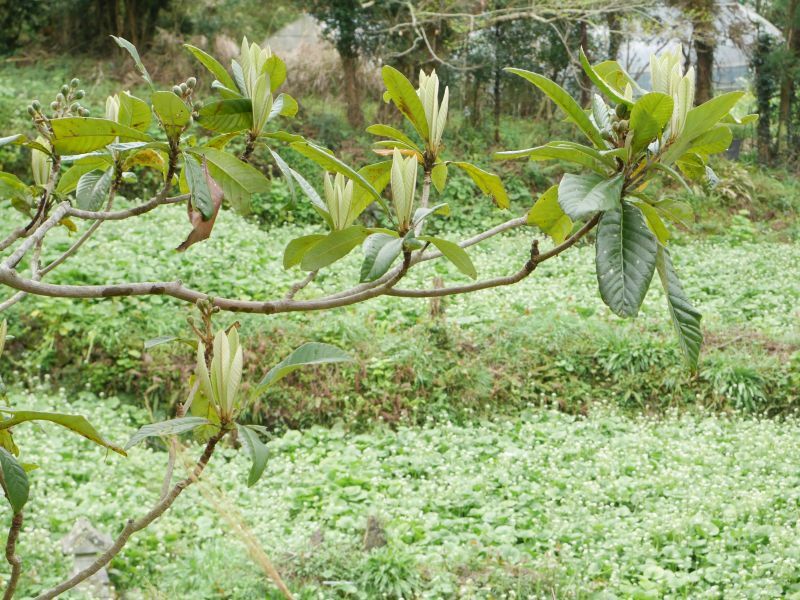 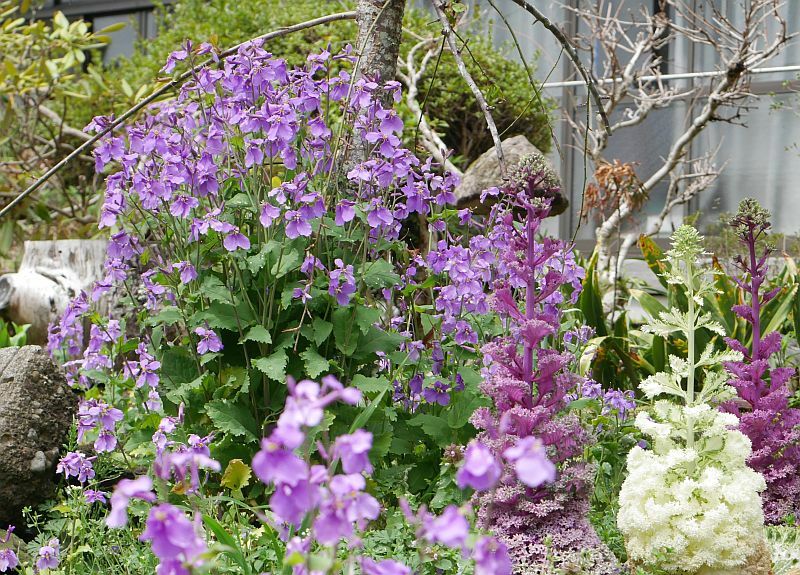 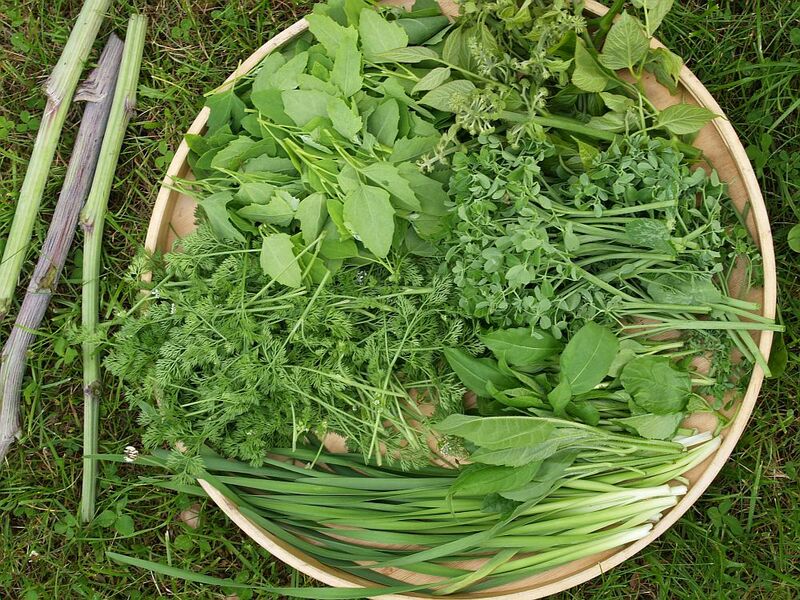 These are wild native species which were previously wild foraged in Japan but are now cultivated to meet demands for what is collectively known as sansai (mountain veggies). 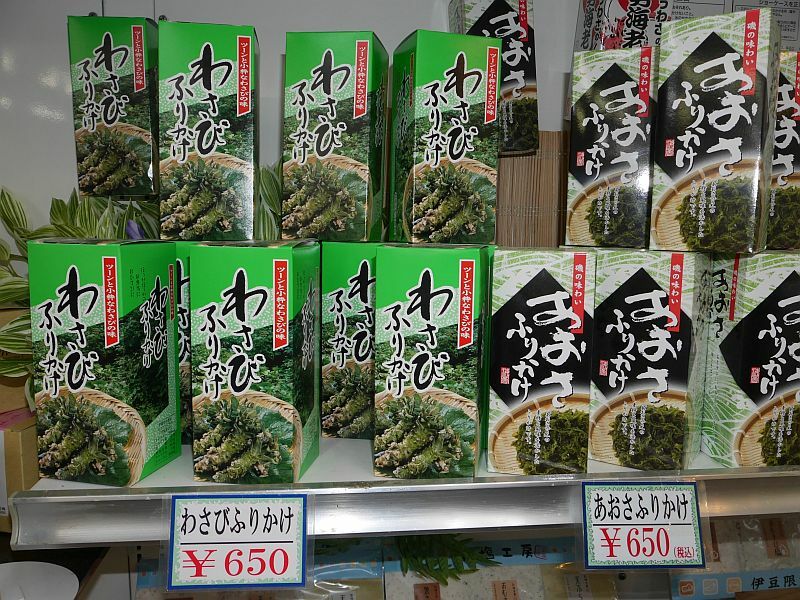 There’s a whole section of supermarkets devoted to sansai. 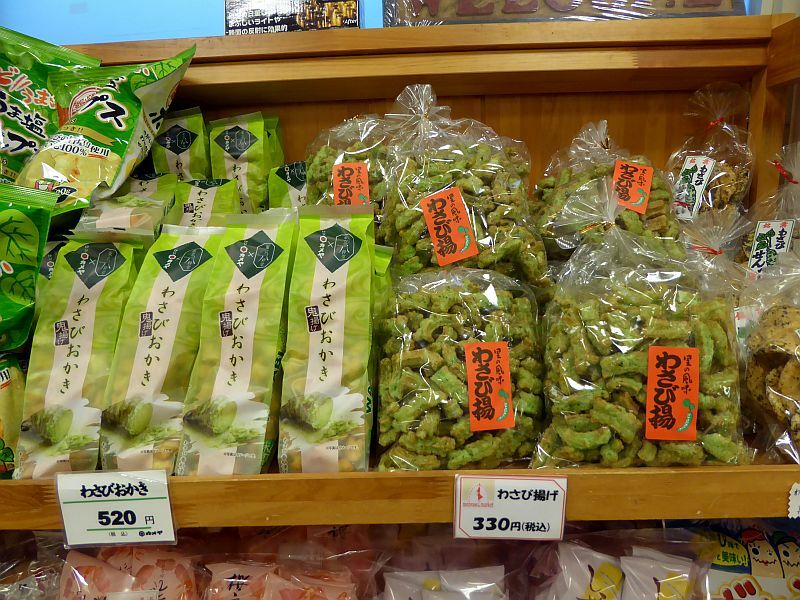 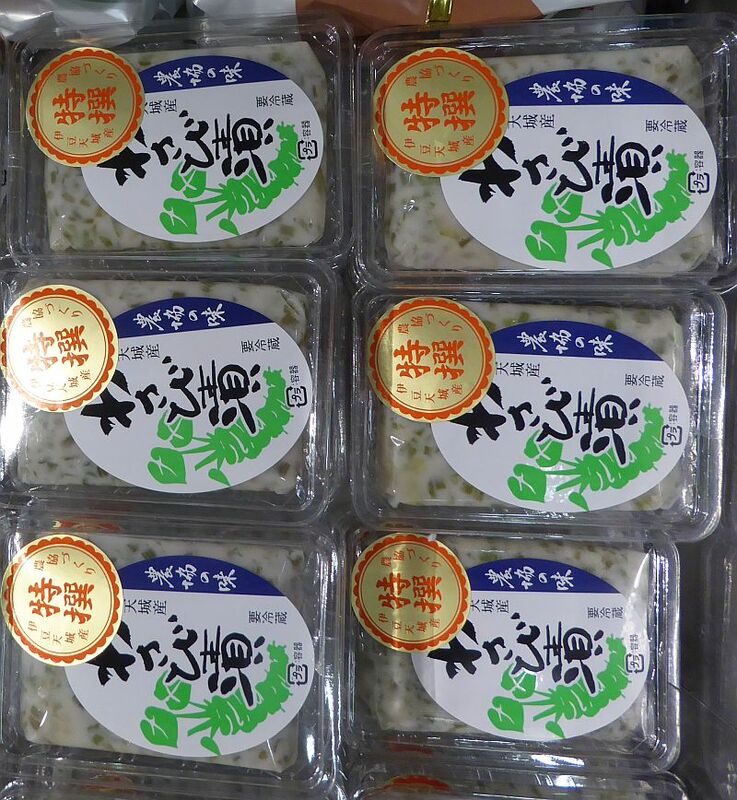 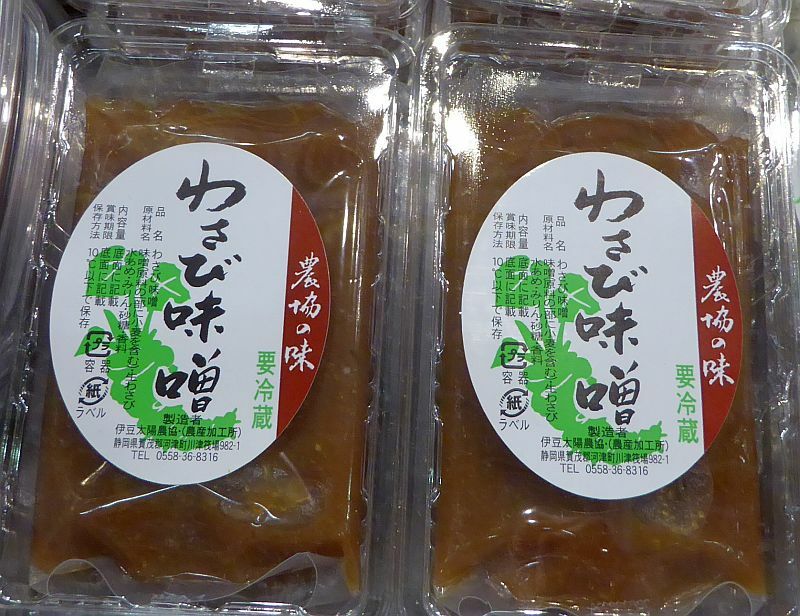 The one we are most familiar with in the west is wasabi, but for most of us it is in name only as it is almost always horseradish, mustard and food colouring which are the ingredients of wasabi sauce offered in sushi bars, rather than genuine wasabi (Wasabia japonica). 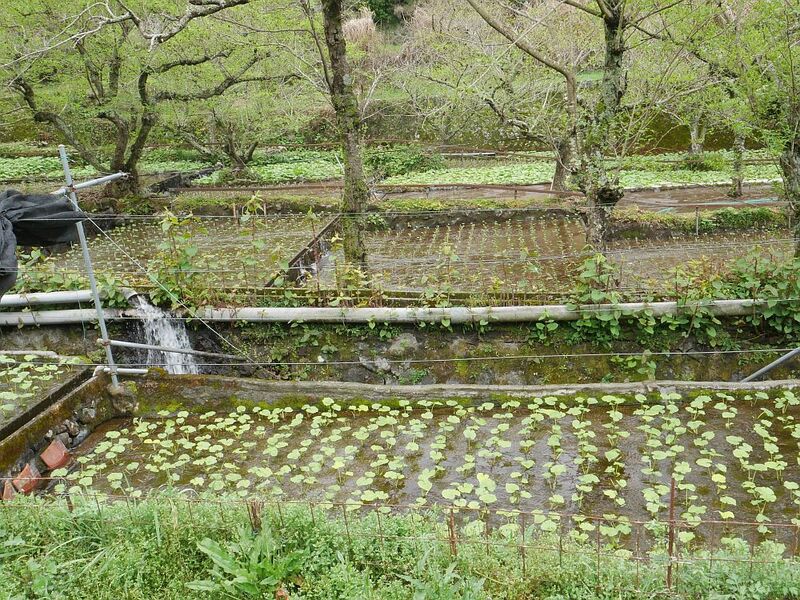 The farm we visited was on the Izu peninsula, a popular tourist area. 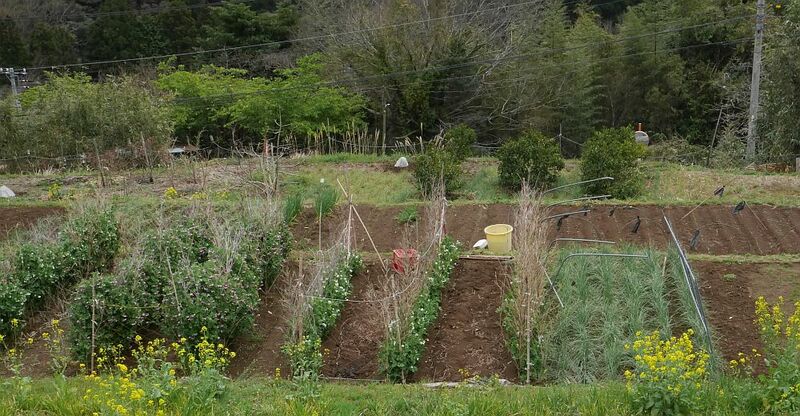 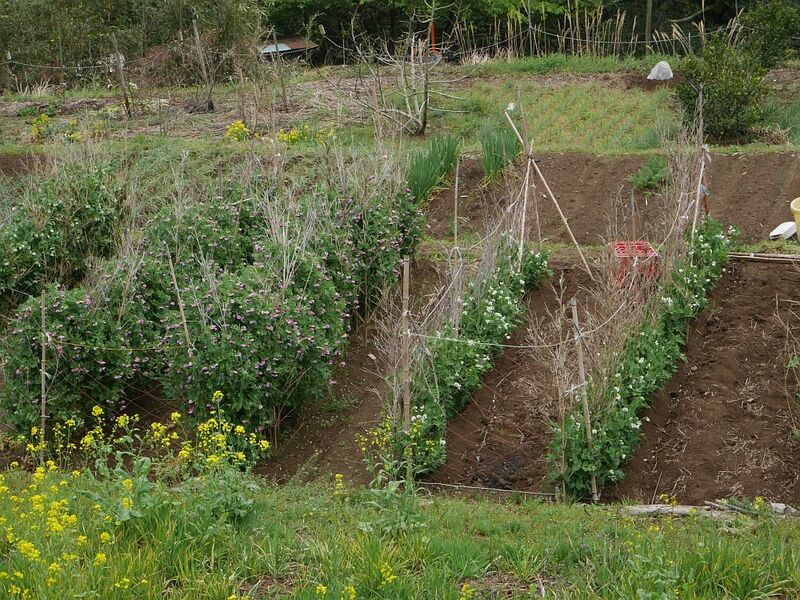 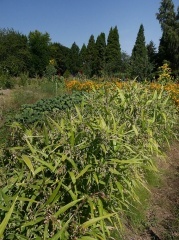 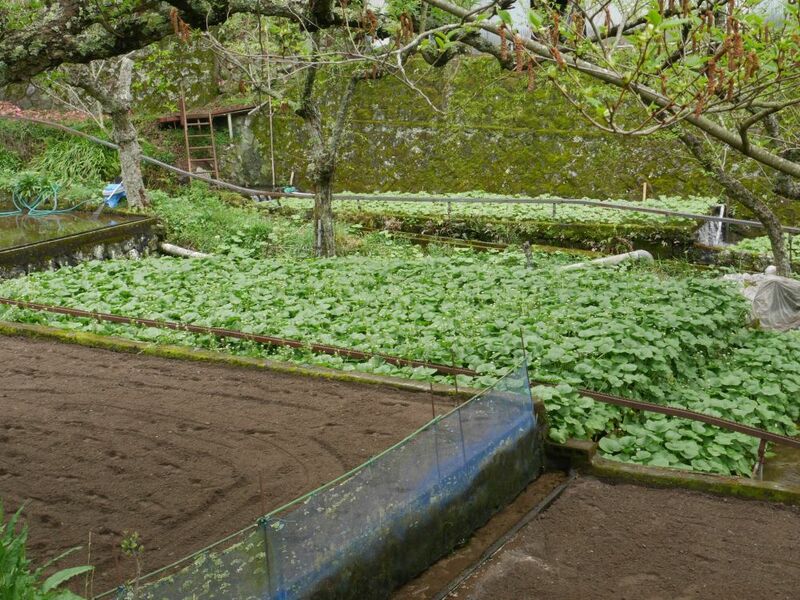 It was one of the most beautiful and naturalistic farms that I’ve witnessed anywhere and could be categorised as a permaculture forest garden with shade-loving wasabi growing in running water diverted from a river into an intricate series of neatly set out beds and intercropped with trees like loquat and other fruit. 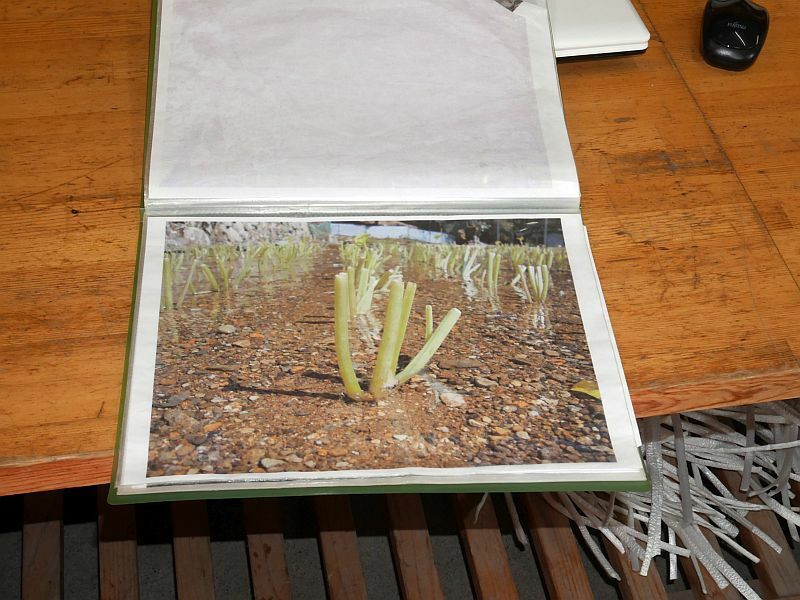 Most of the work seems to be done manually. 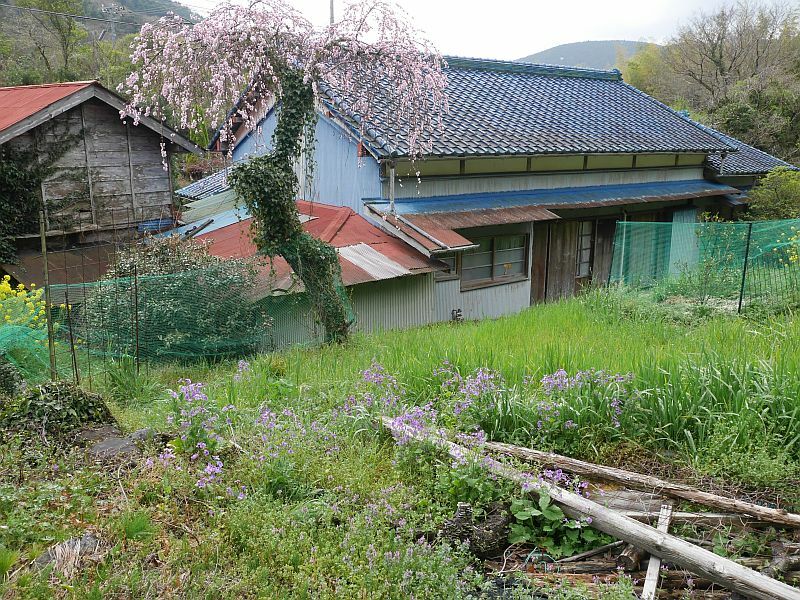 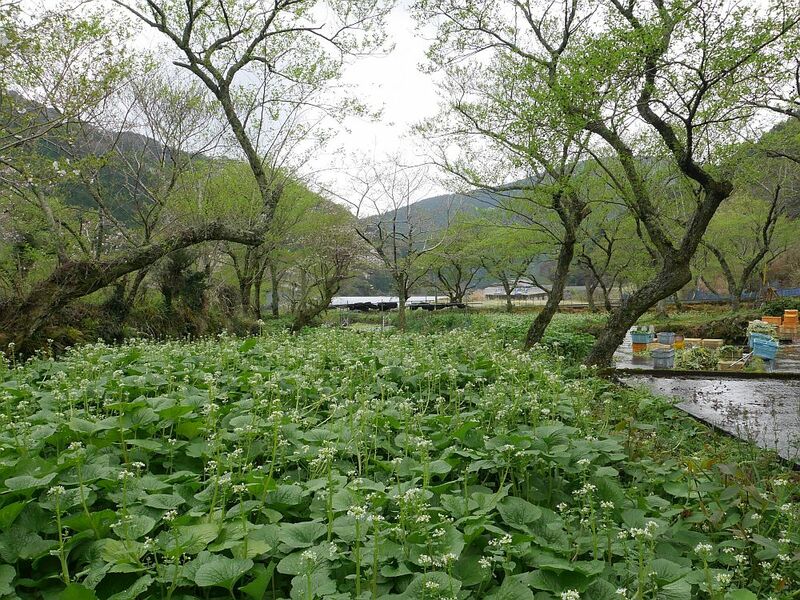 First, a few videos from the farm and below can be found an album of pictures of wasabi and other plants we saw, including at a shrine and associated vegetable garden adjacent to the farm! 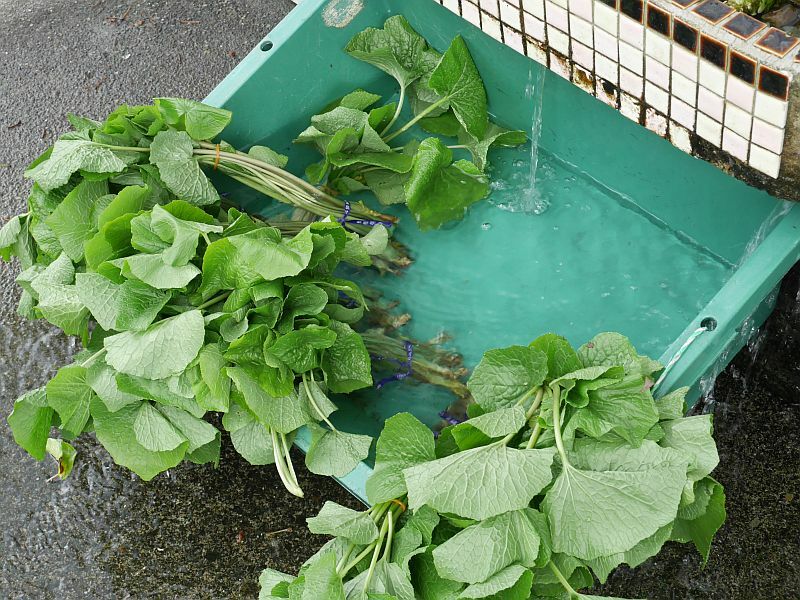 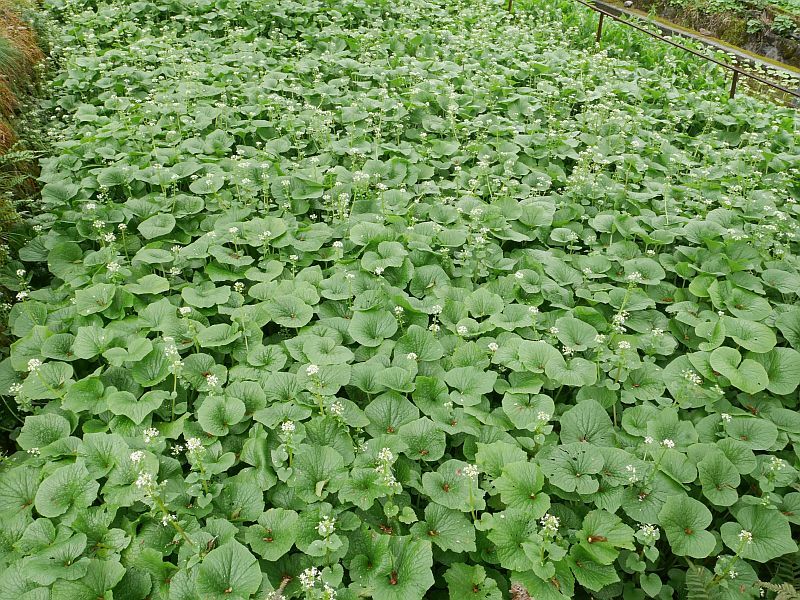 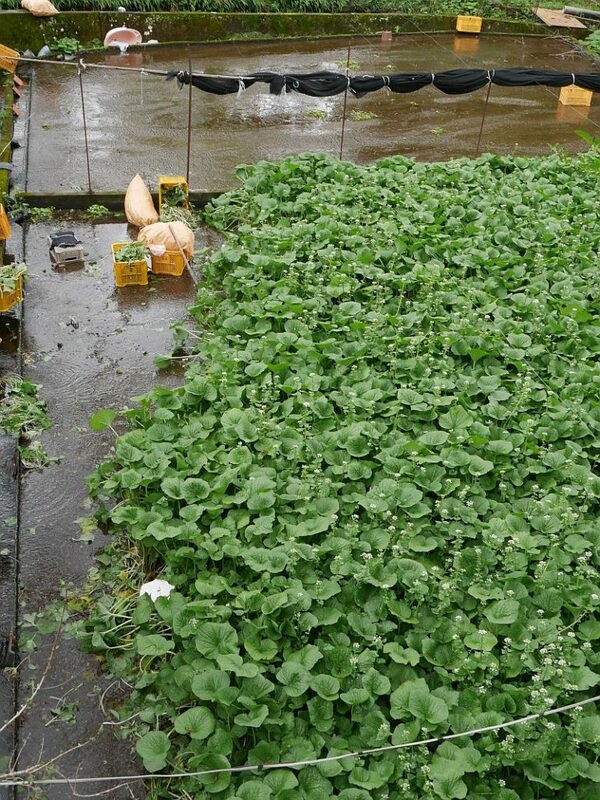 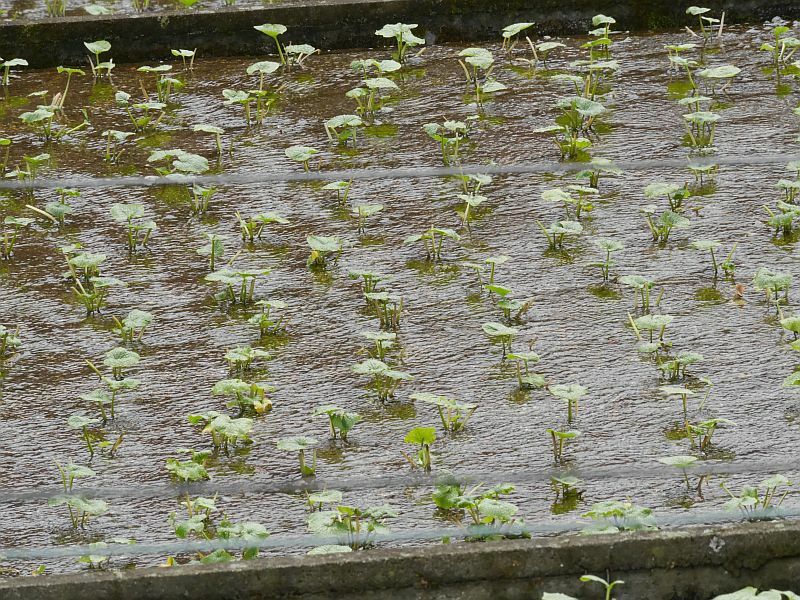 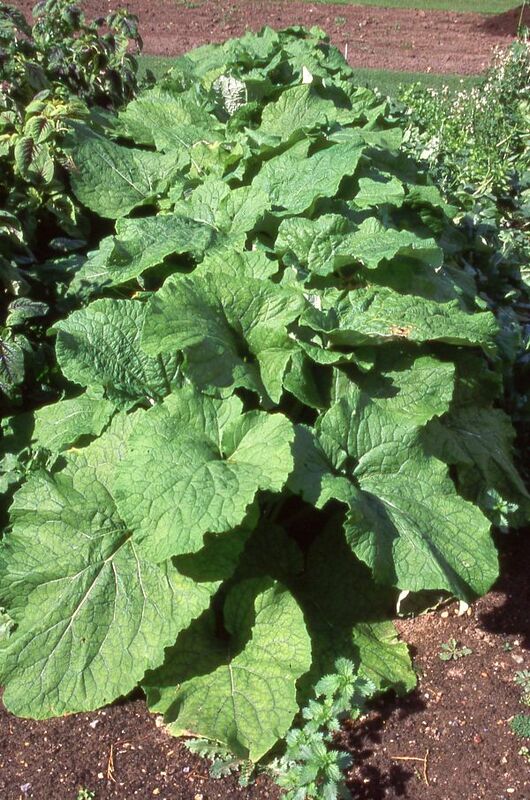 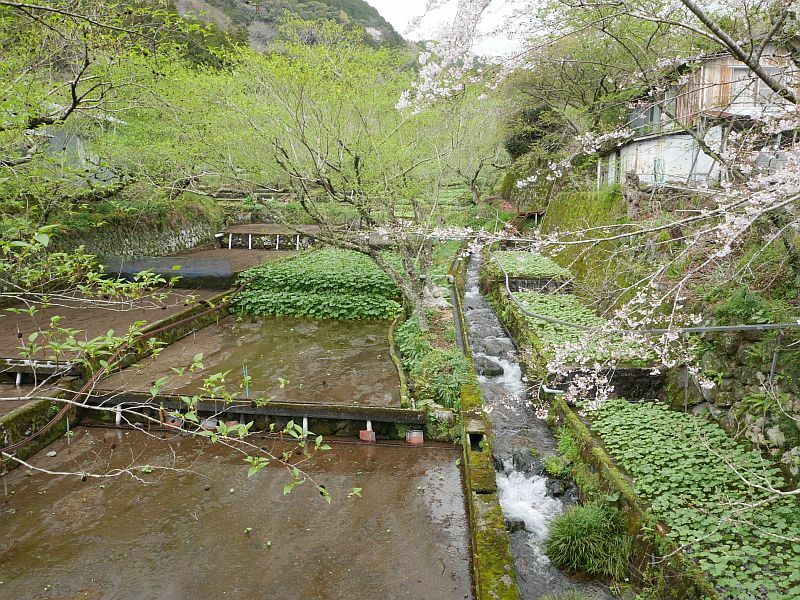 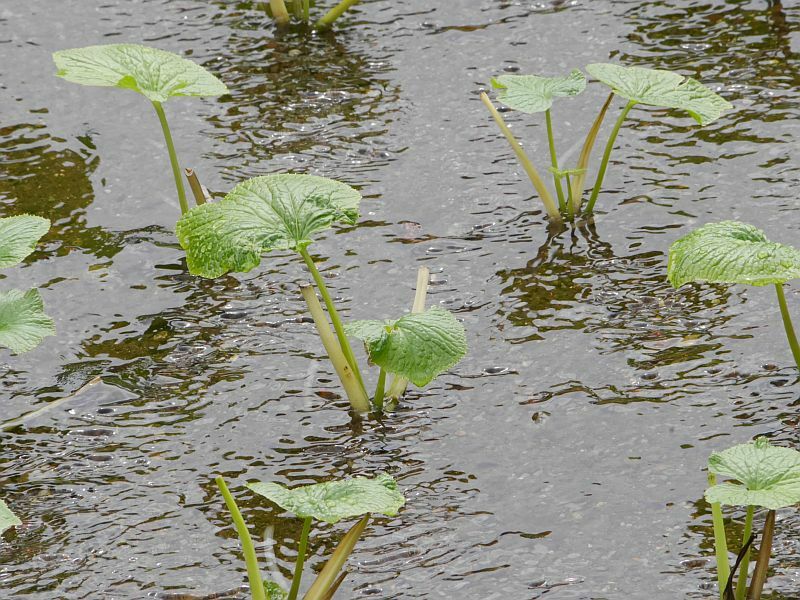 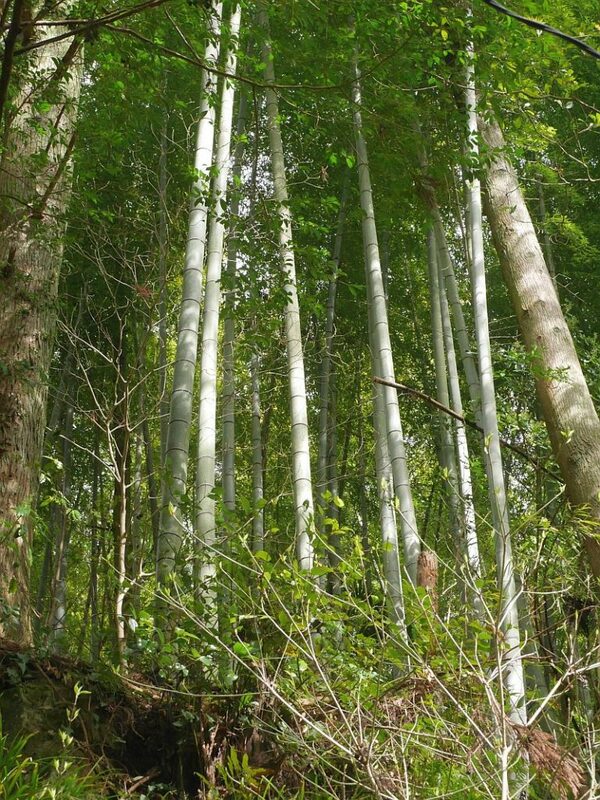 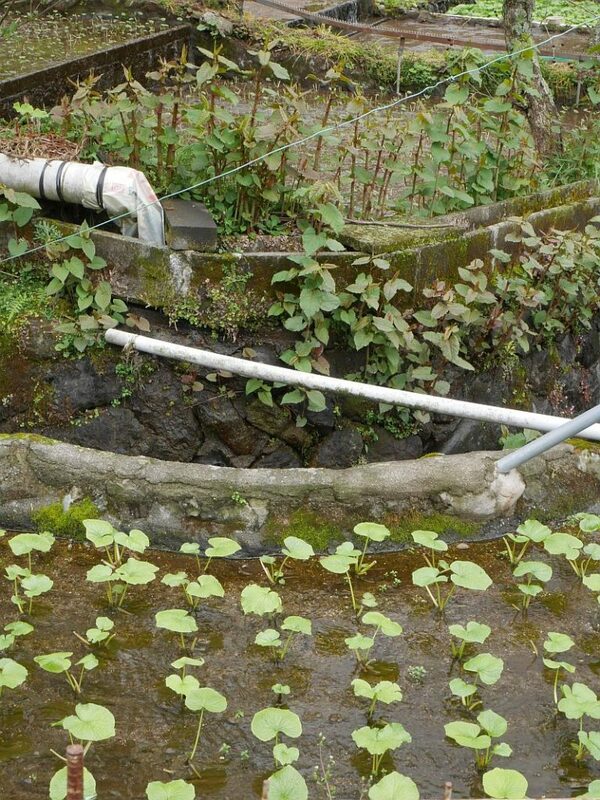 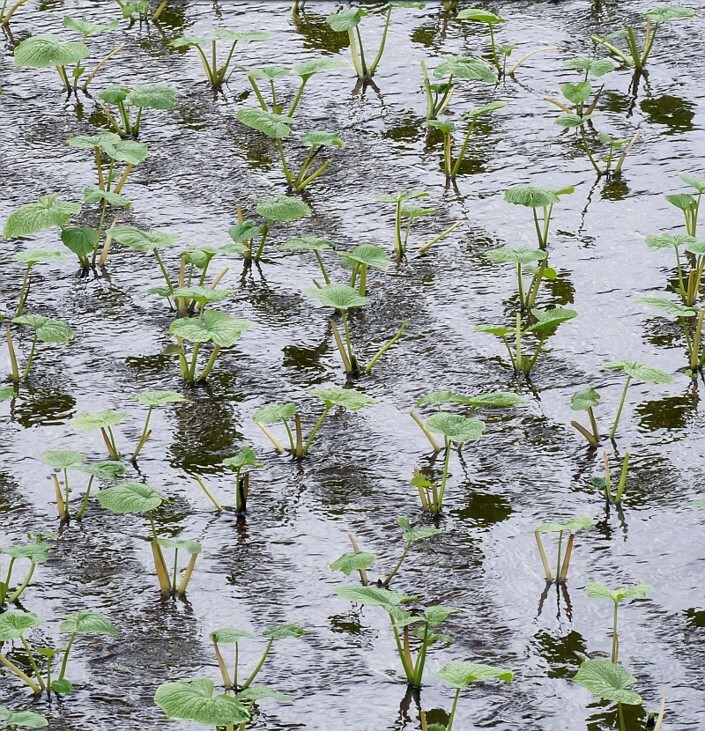 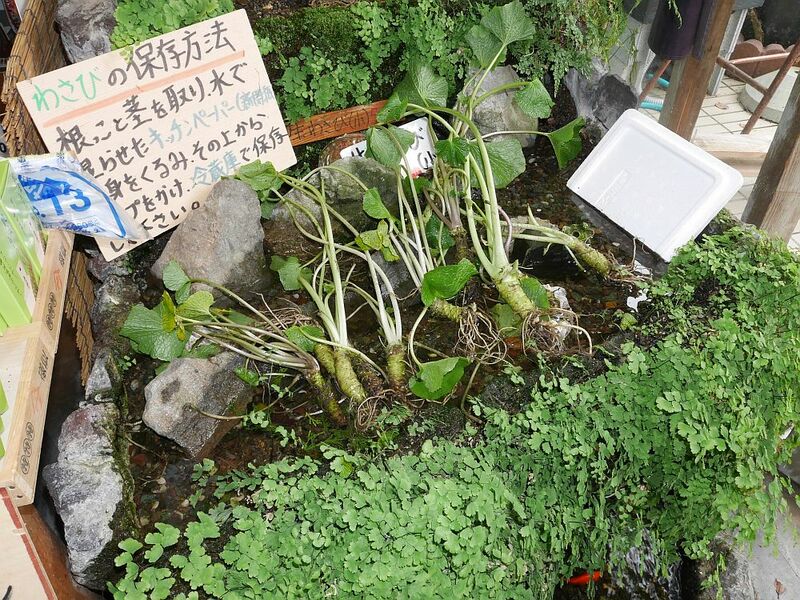 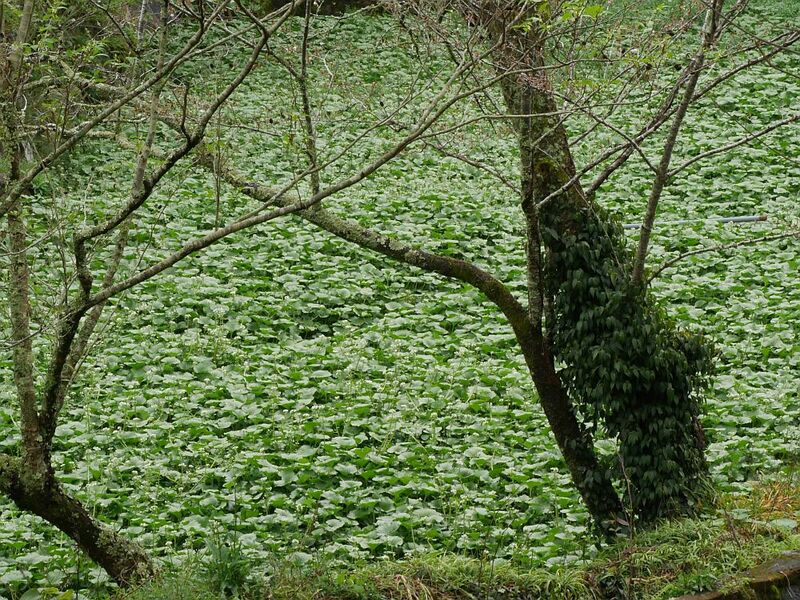 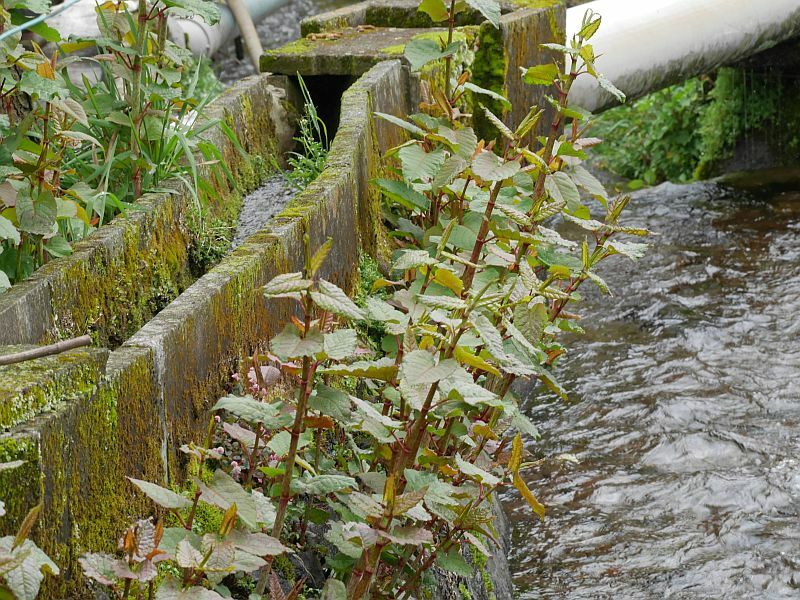 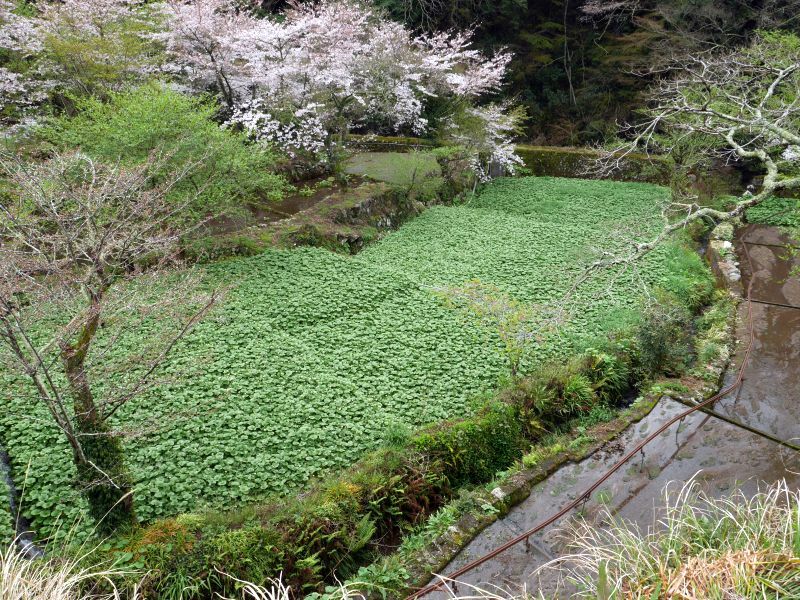 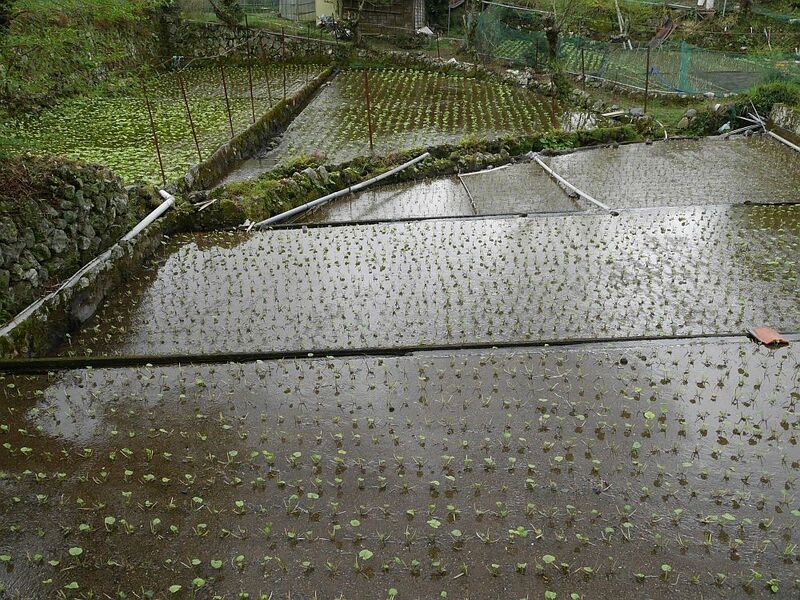 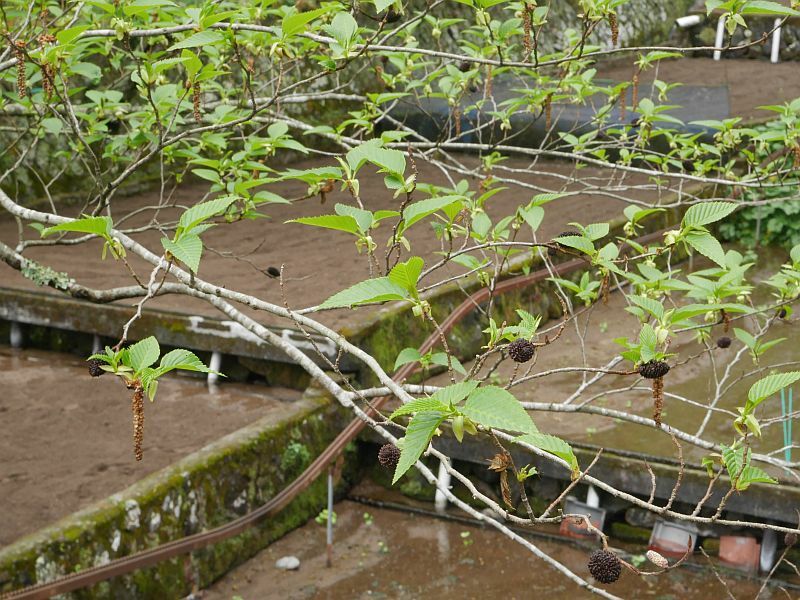 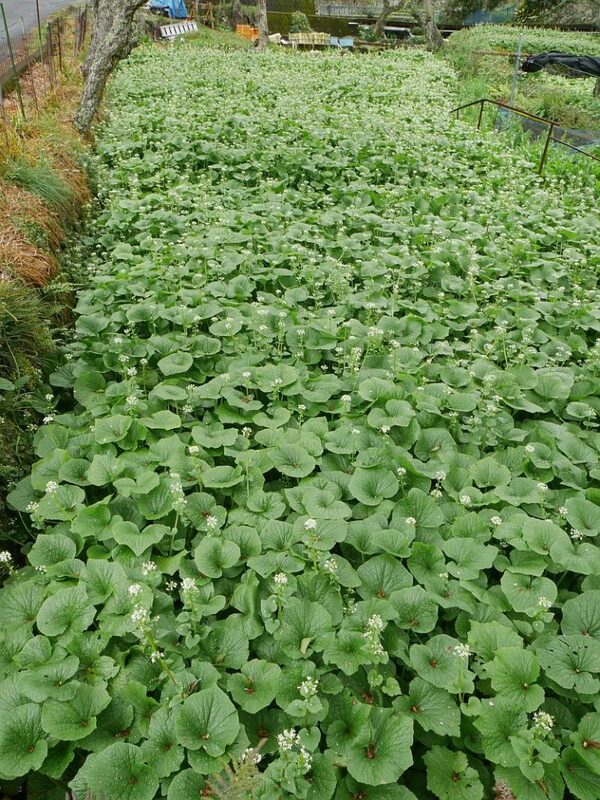 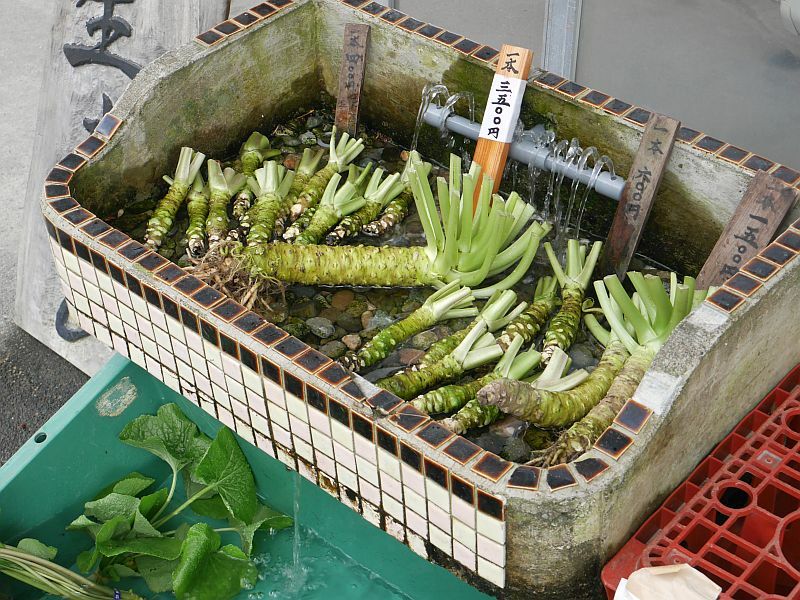 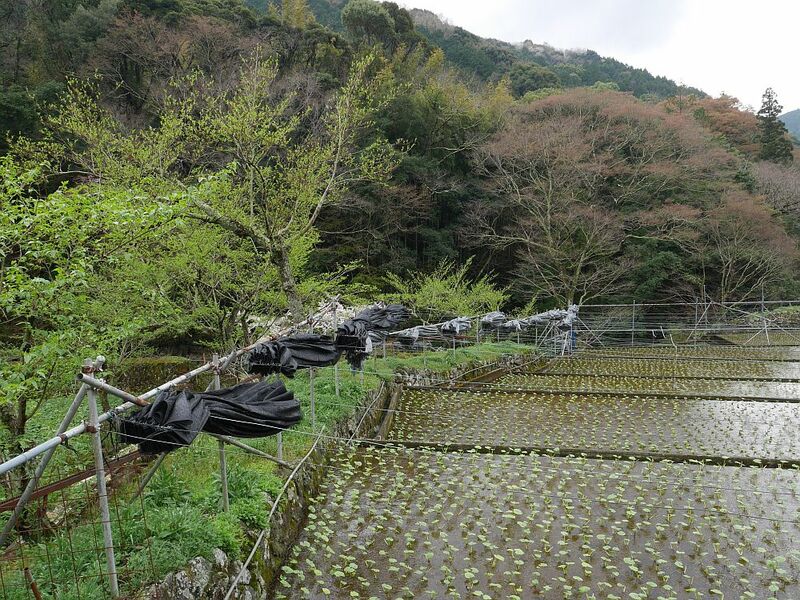 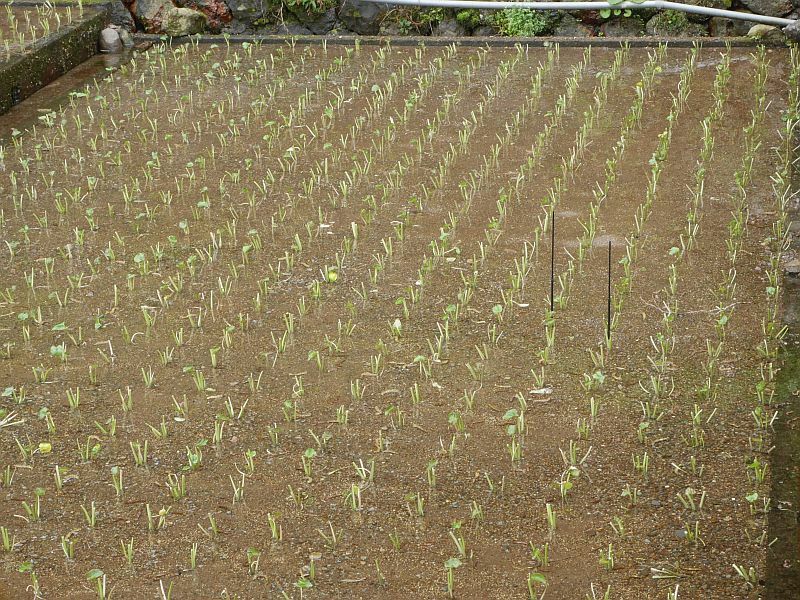 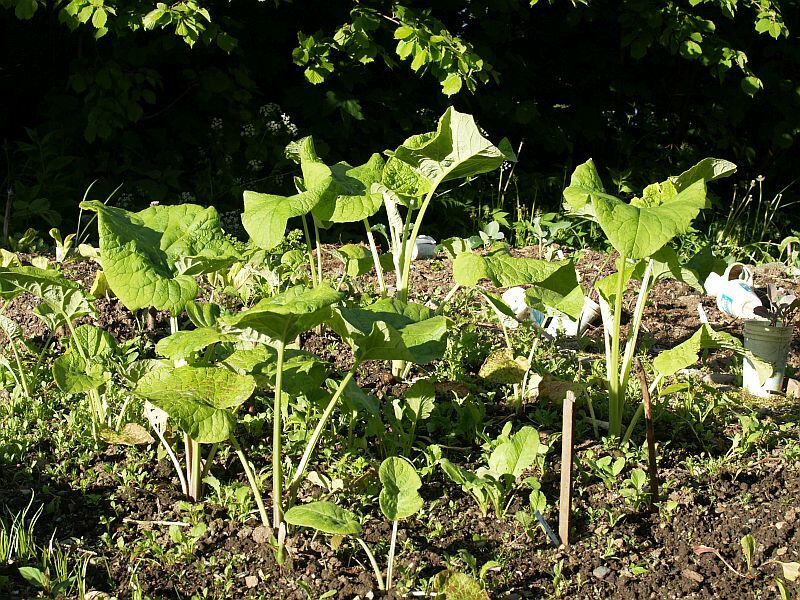 Wasabi has very narrower ecological requirements to produce well, including shade and running cool mountain spring water. 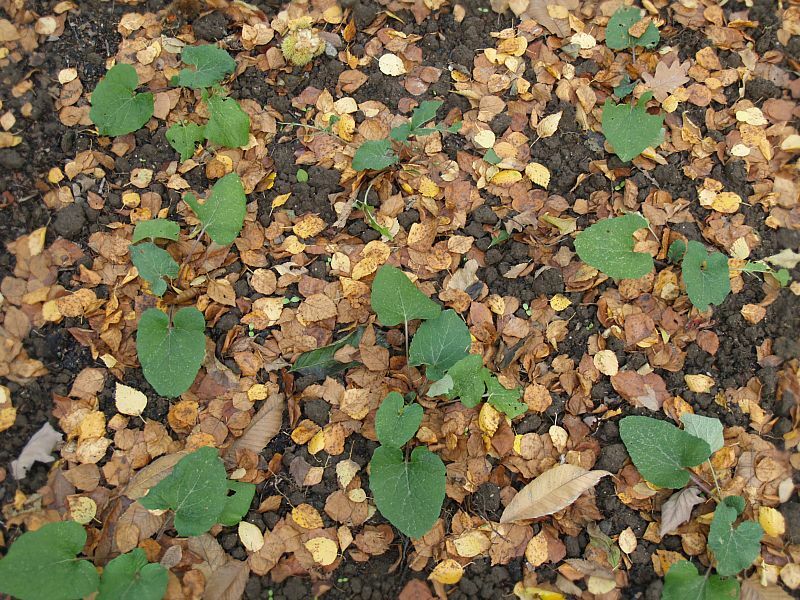 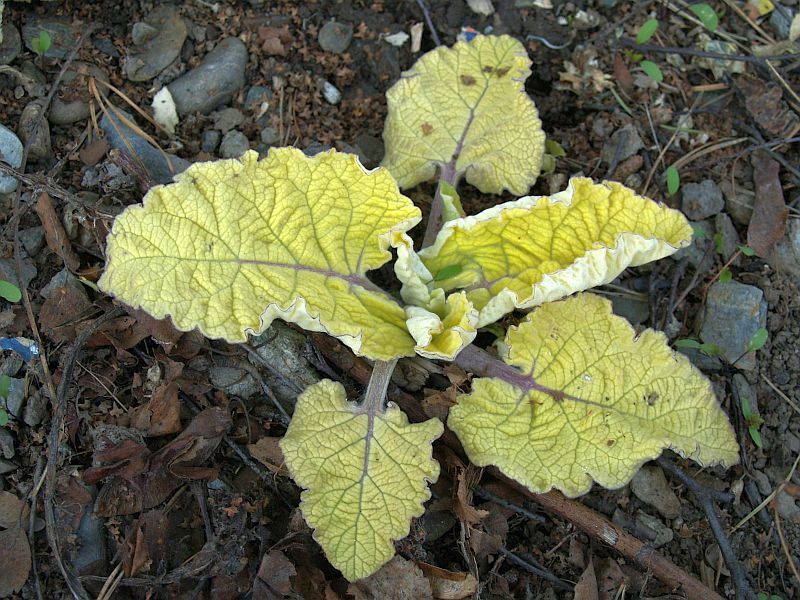 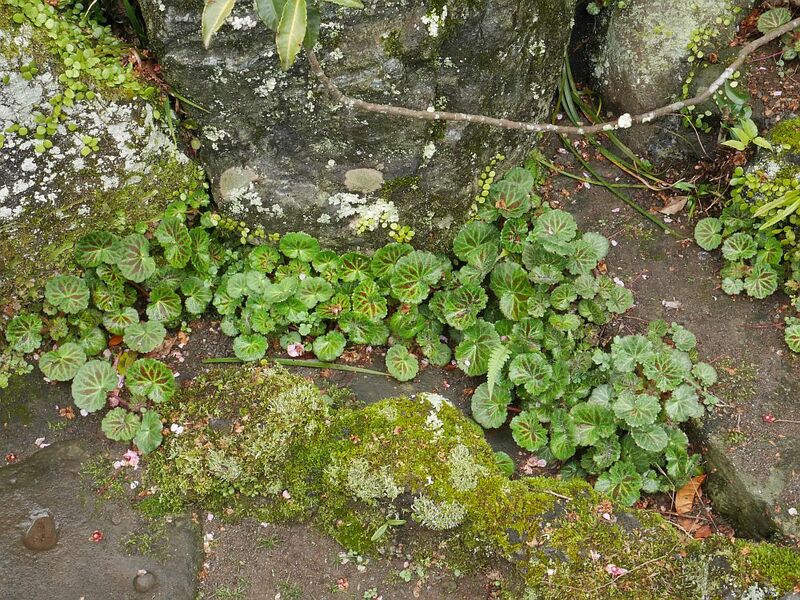 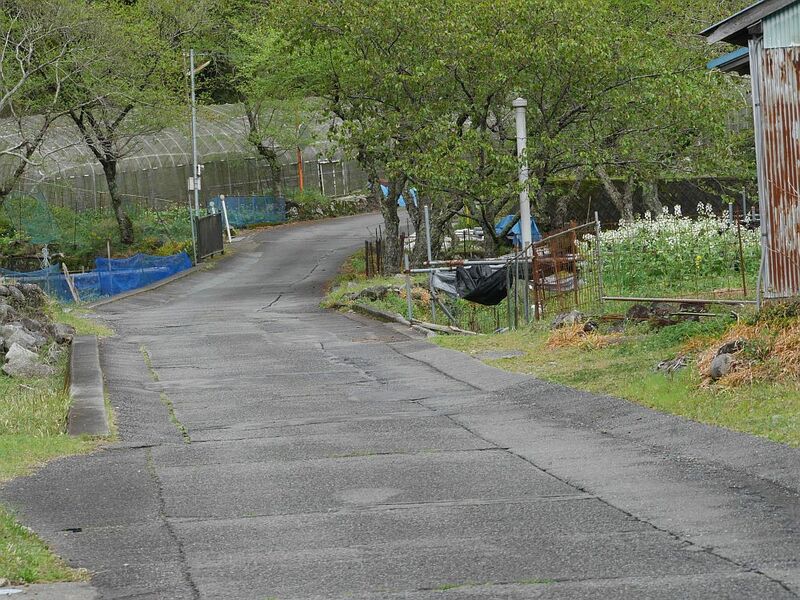 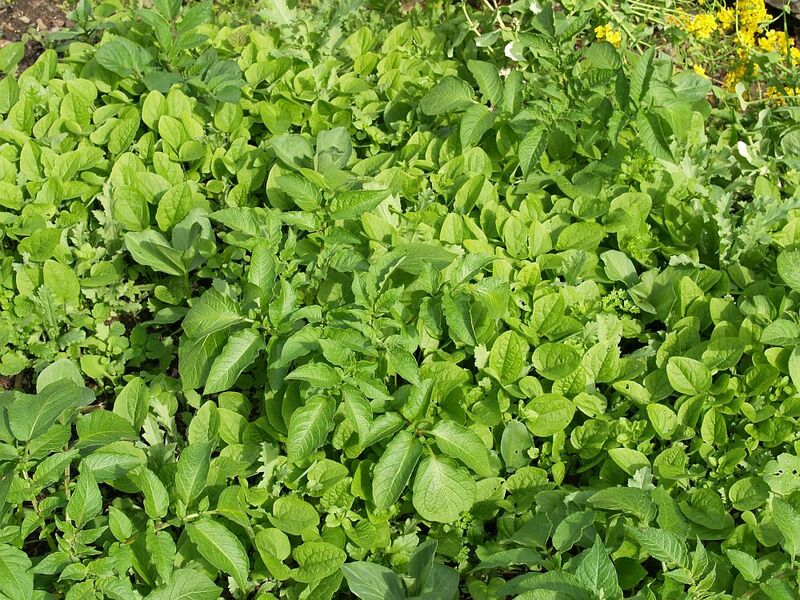 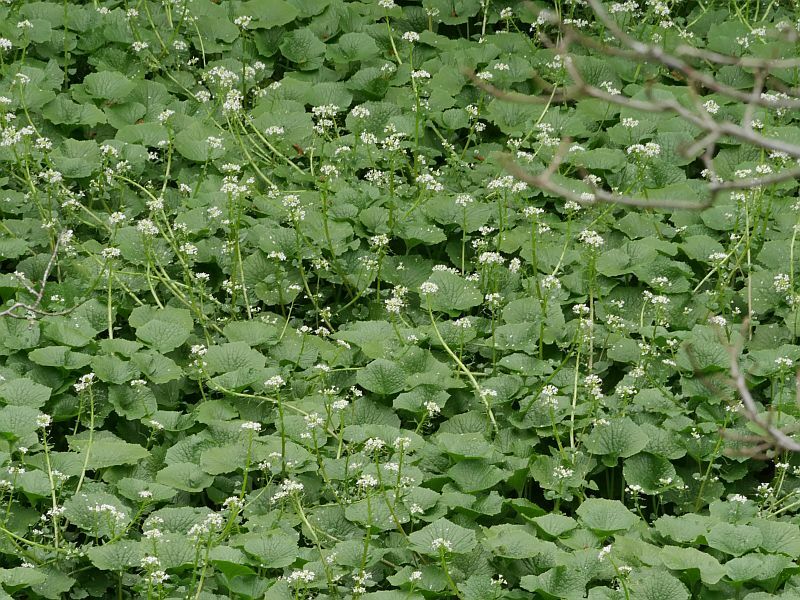 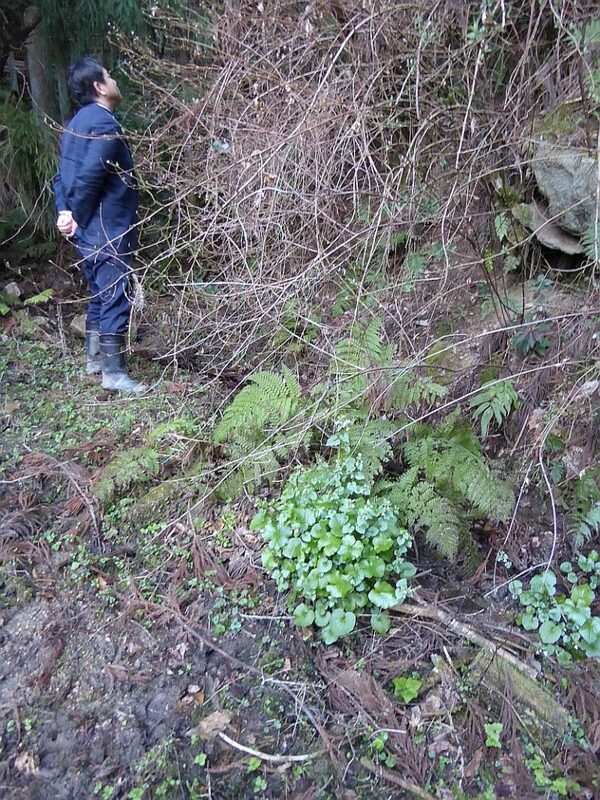 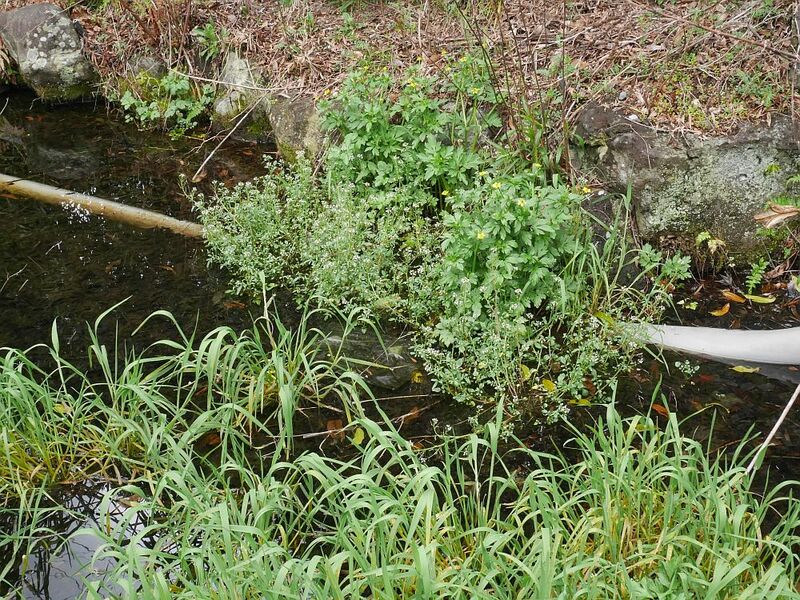 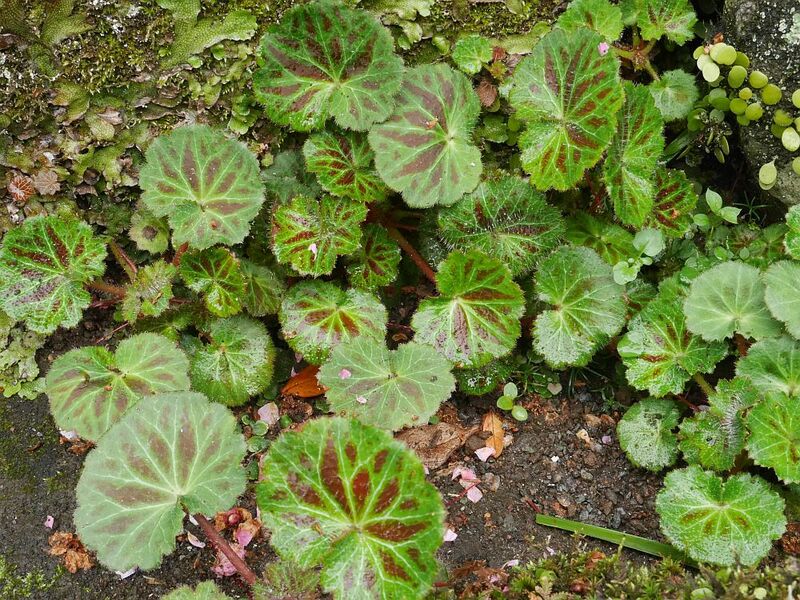 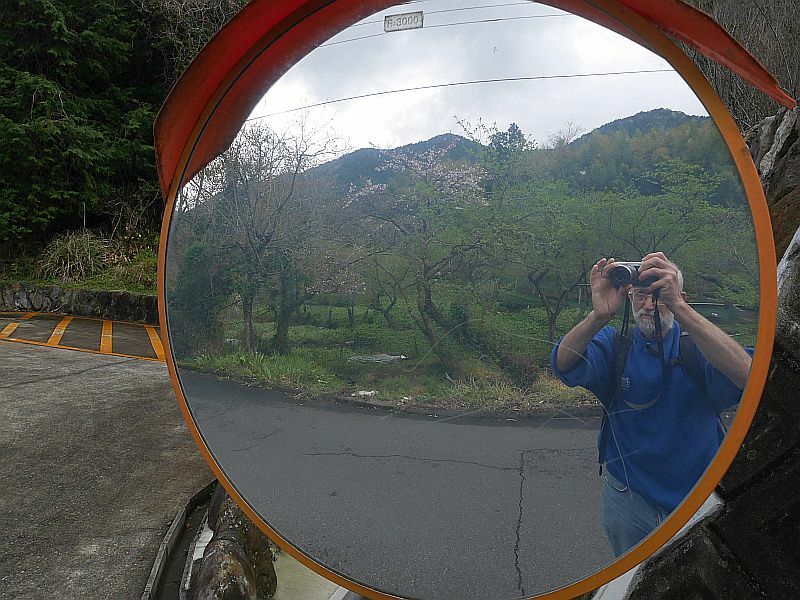 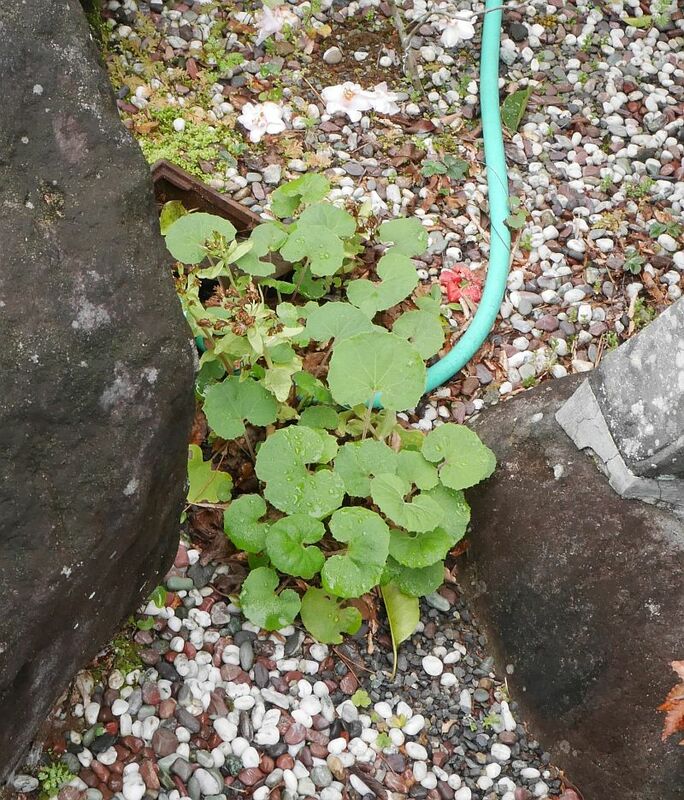 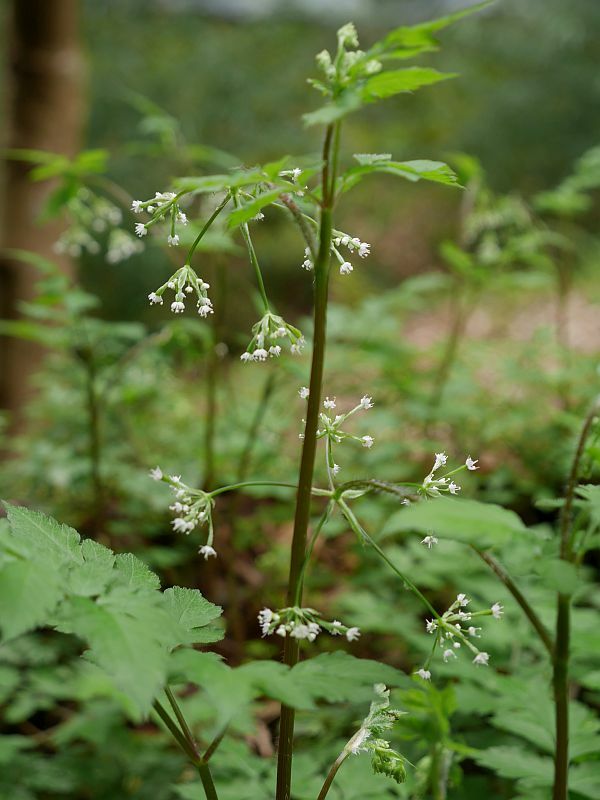 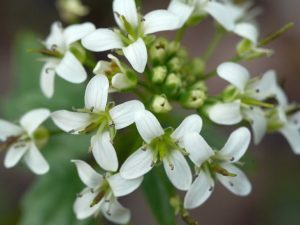 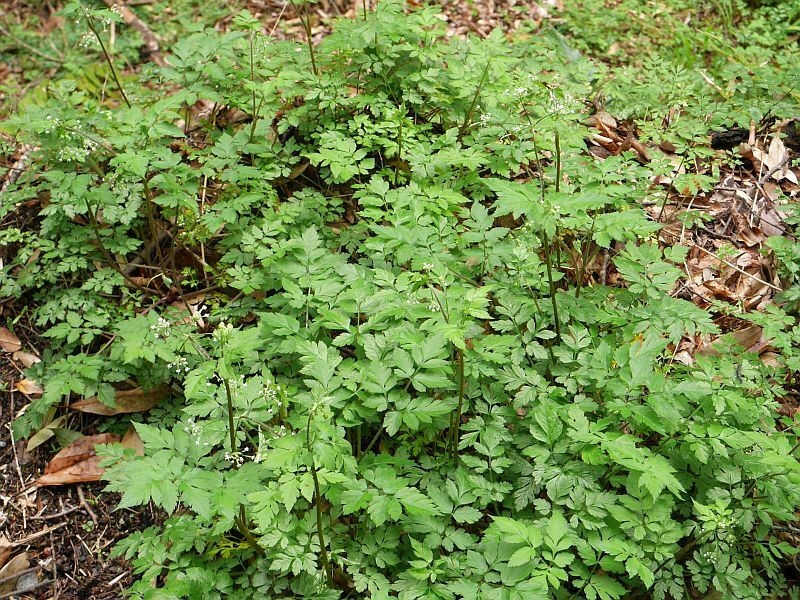 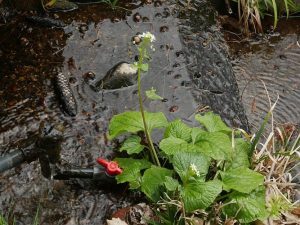 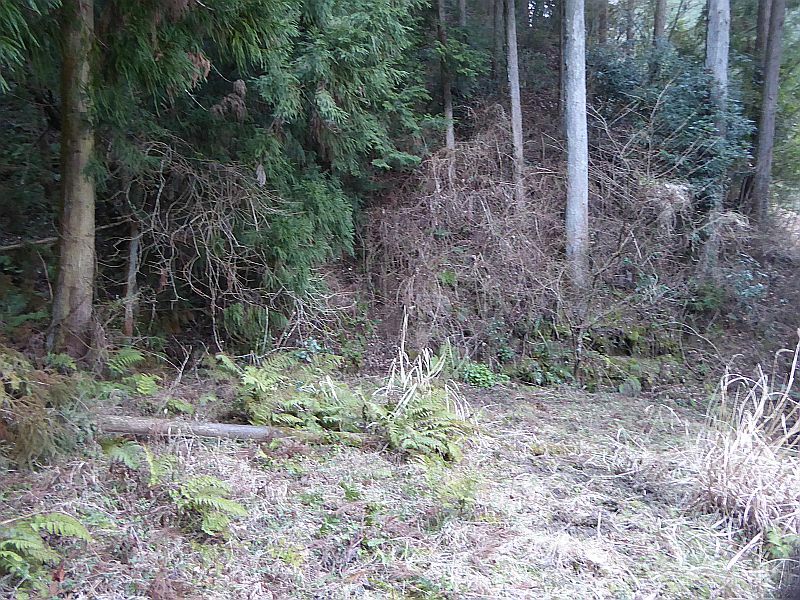 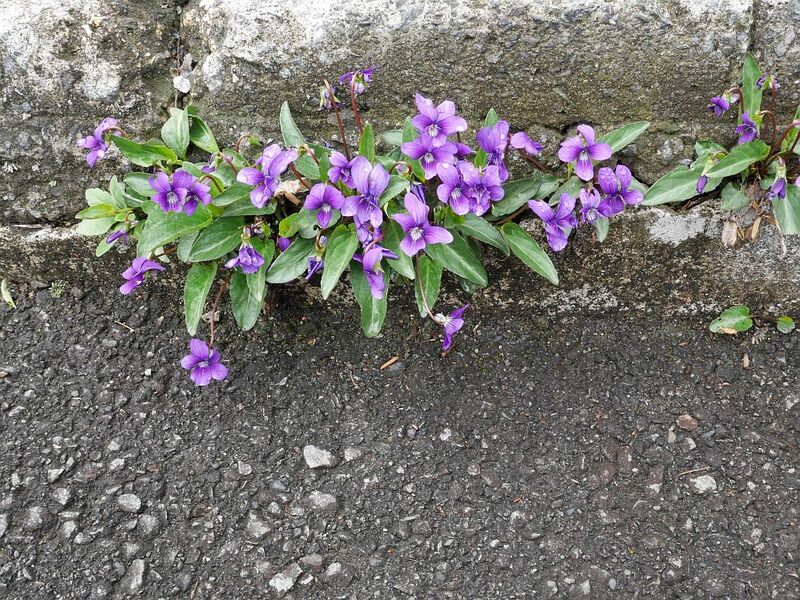 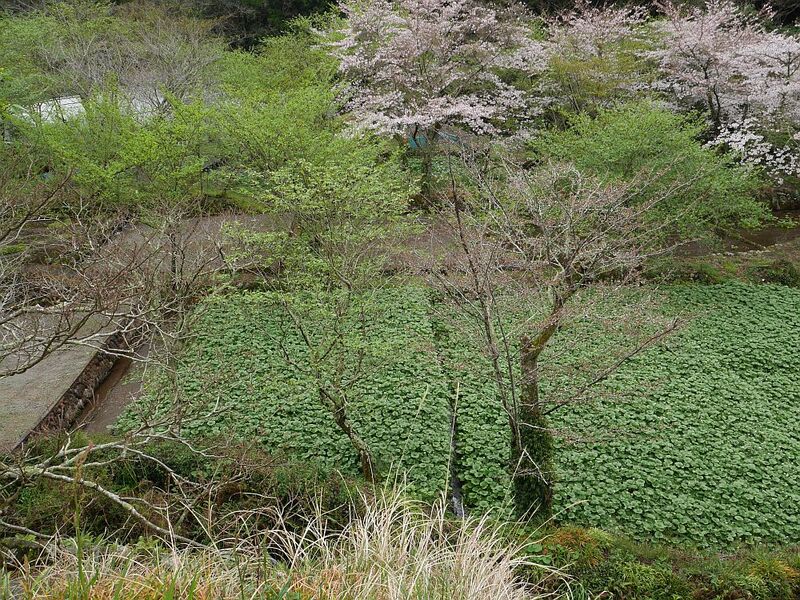 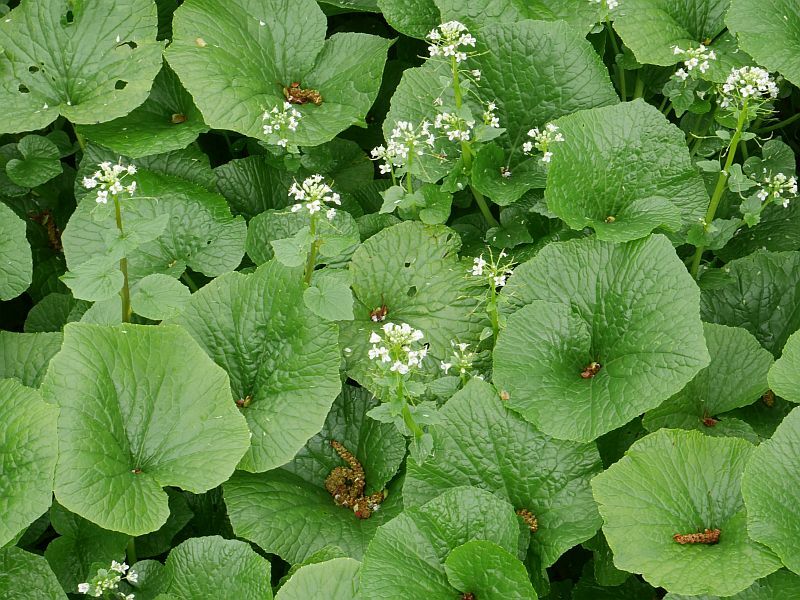 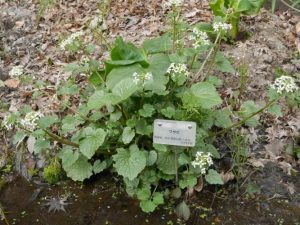 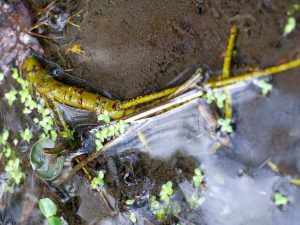 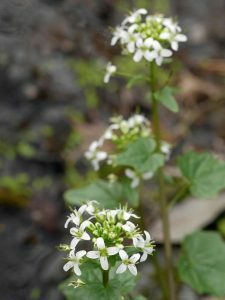 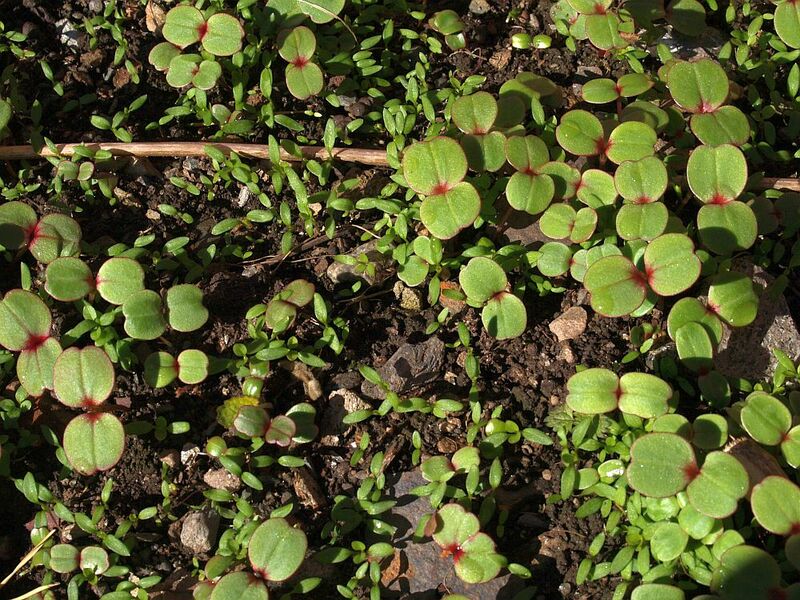 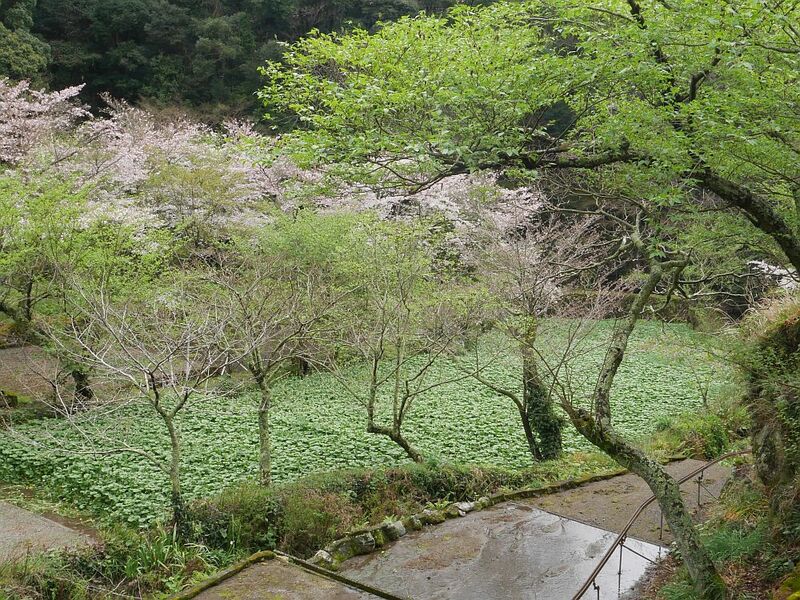 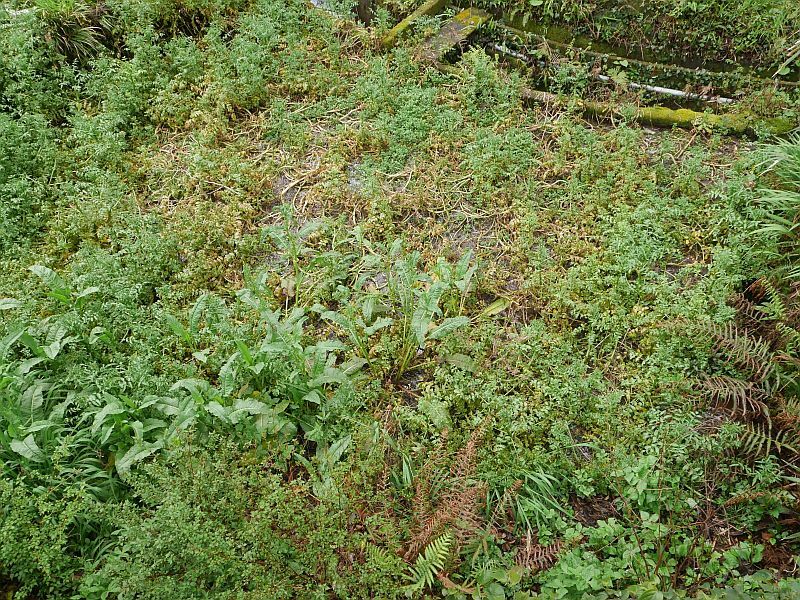 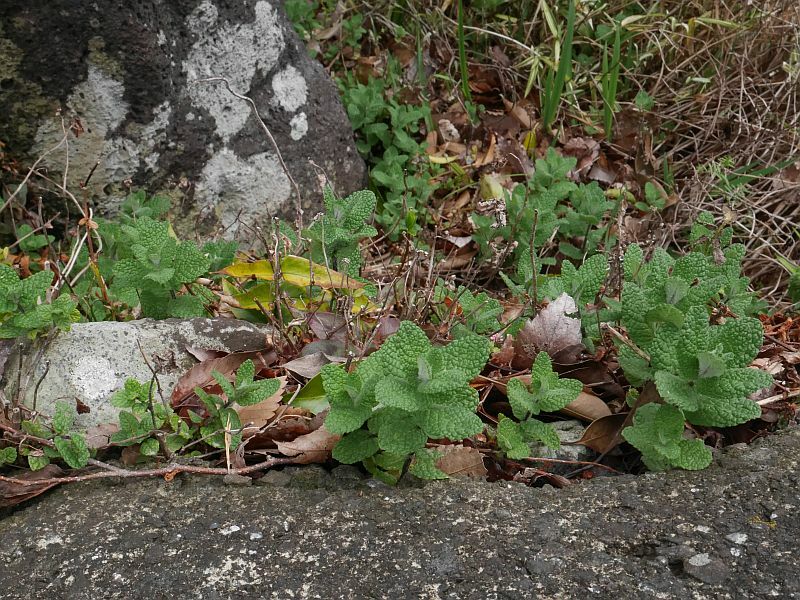 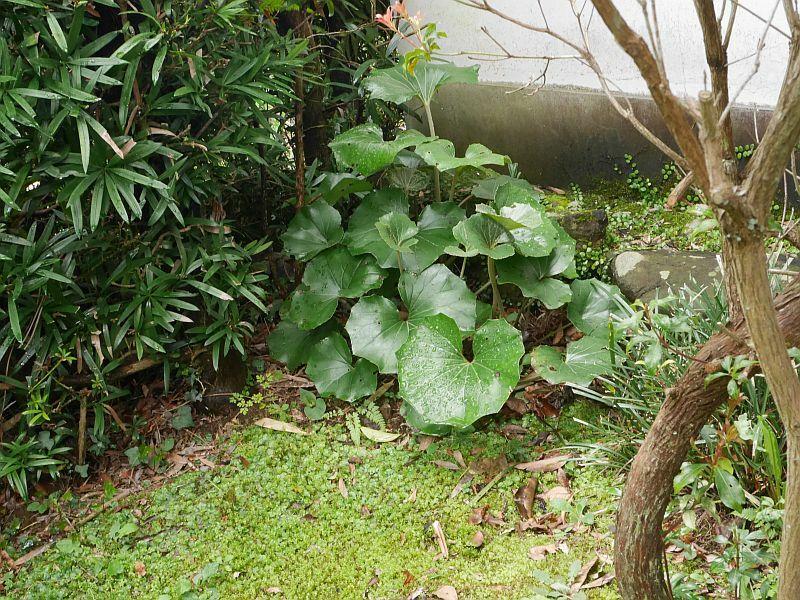 17th March 2019: I’m adding three pictures at the bottom of a group of “wild” wasabi plants growing in quite a dry shady environment in the hills near to Toyota in Japan! 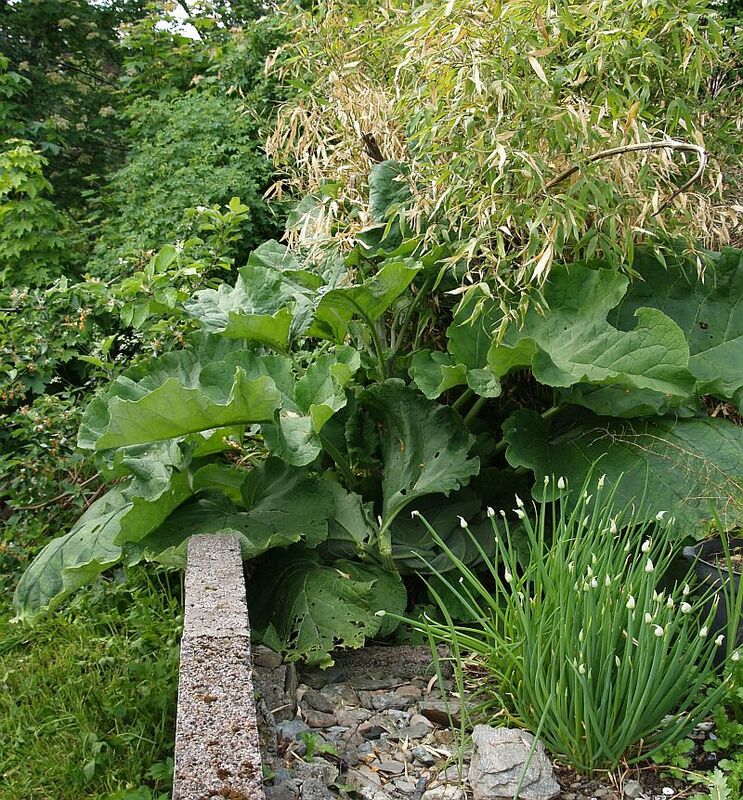 This is an asiatic hybrid lily growing in the garden of the flat I stayed in in Jondal during the Nordic Permaculture Festival! 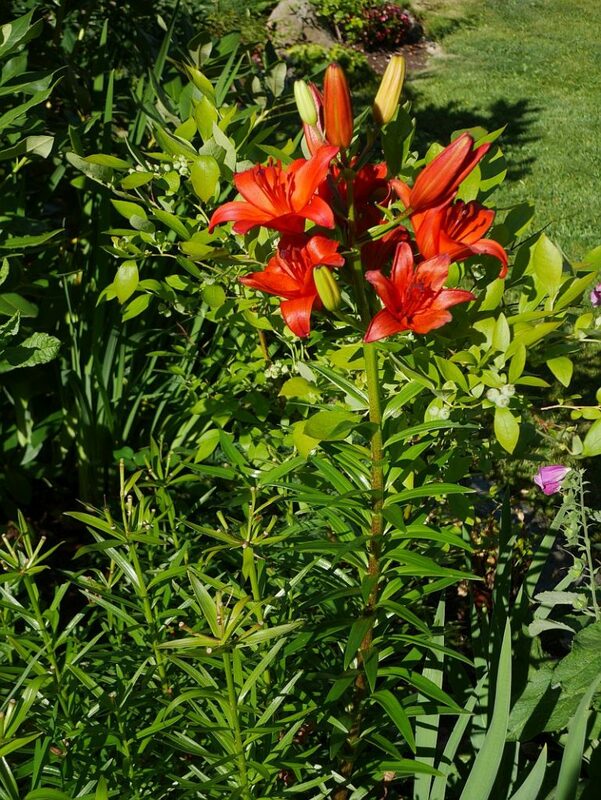 According to wikipedia, asiatic hybrids include “hybrids of many Asiatic species and their interspecific hybrids, including Lilium brownii, Lilium henryi, Lilium leucanthum, Lilium regale, Lilium rosthornii, Lilium sargentiae and Lilium sulphureum. 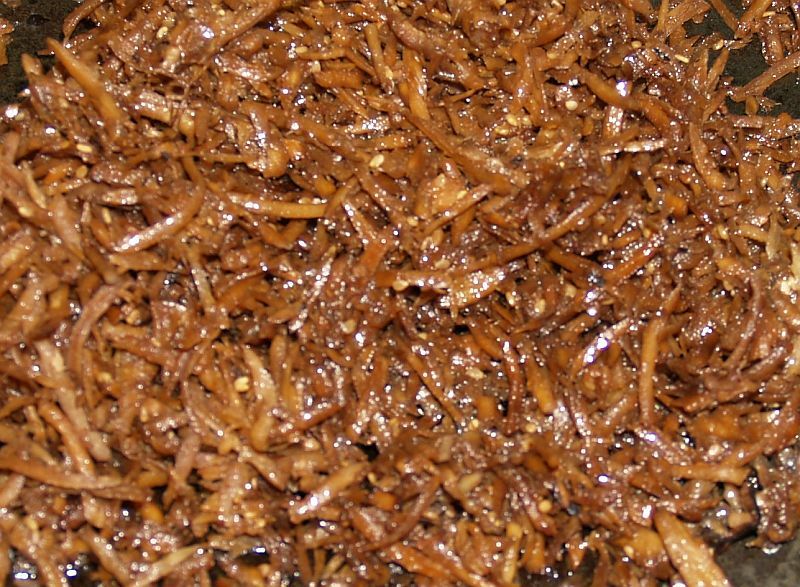 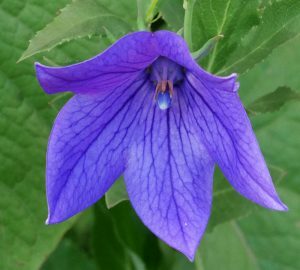 The flowers are trumpet shaped, facing outward or somewhat downward, and tend to be strongly fragrant, often especially night-fragrant.” Of these, both L. brownii and L. henryi are used for food. 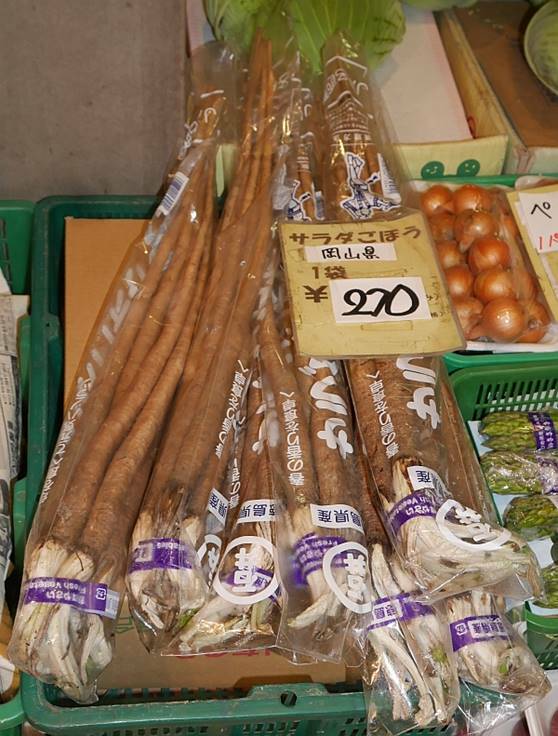 I’ve never tasted hybrid lilies, but maybe I should as two of the asiatics and all the 6 oriental species involved are eaten in Japan…most importantly L. auratum which is cultivated for markets on a field scale, the others mainly foraged I think! 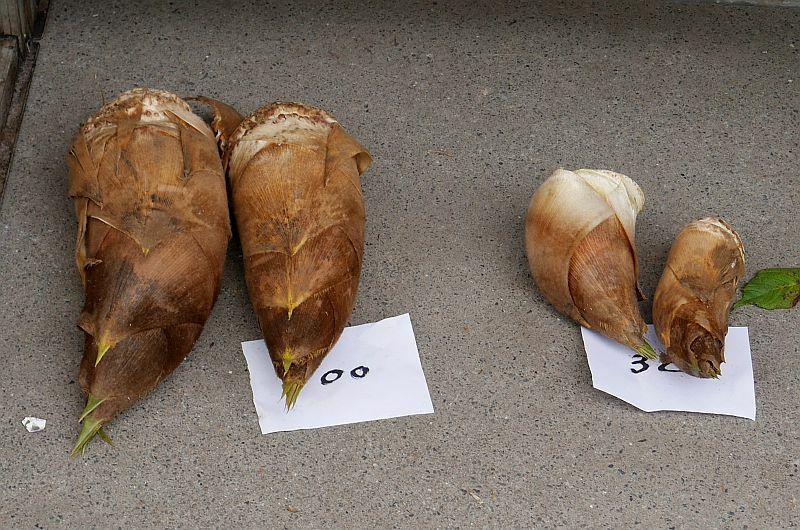 I wonder if anyone has hybridised lilies for food rather than beauty….an interesting project for someone perhaps? 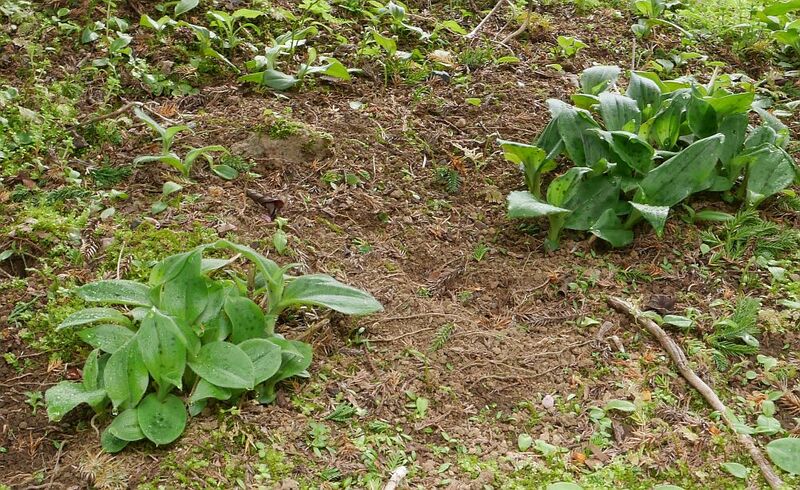 The other day I discovered a long suffering Hosta that I’d covered with a bucket in the spring. 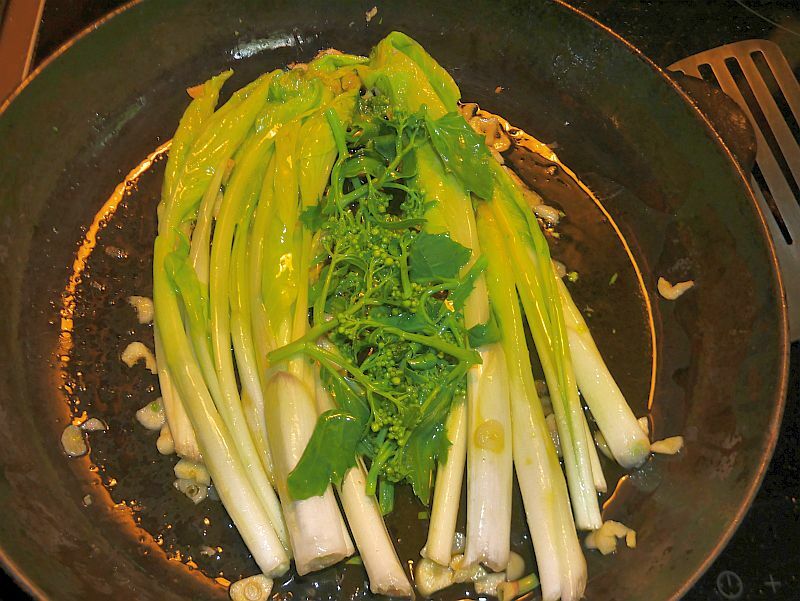 Surprisingly the blanched shoots were in good condition despite the warmth. 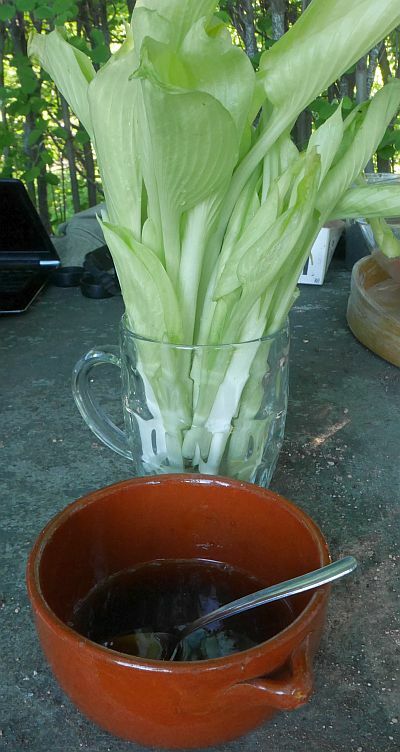 We ate them as a salad with a simple dipping sauce (roasted sesame oil, soy sauce and pepper! 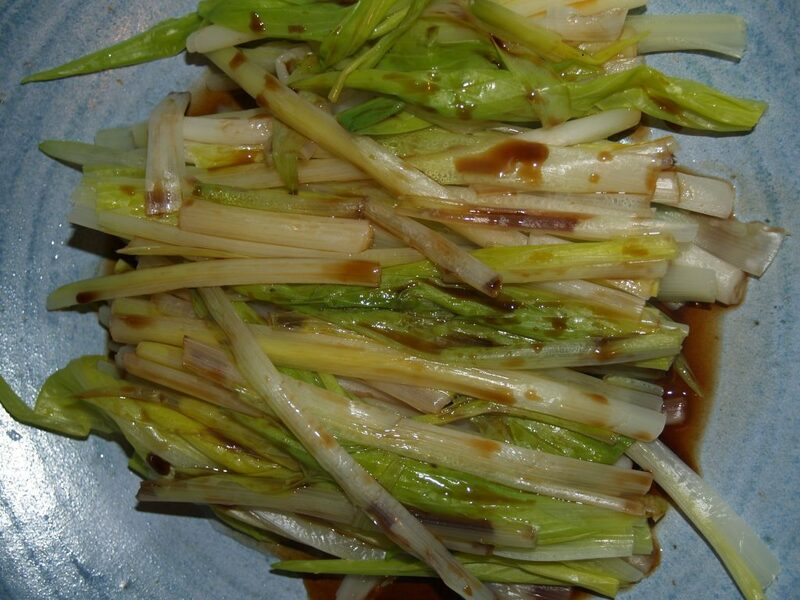 And it was delicious, mild tasting, crispy and refreshing, the texture and shape of the leaf reminding my friend of artichoke! 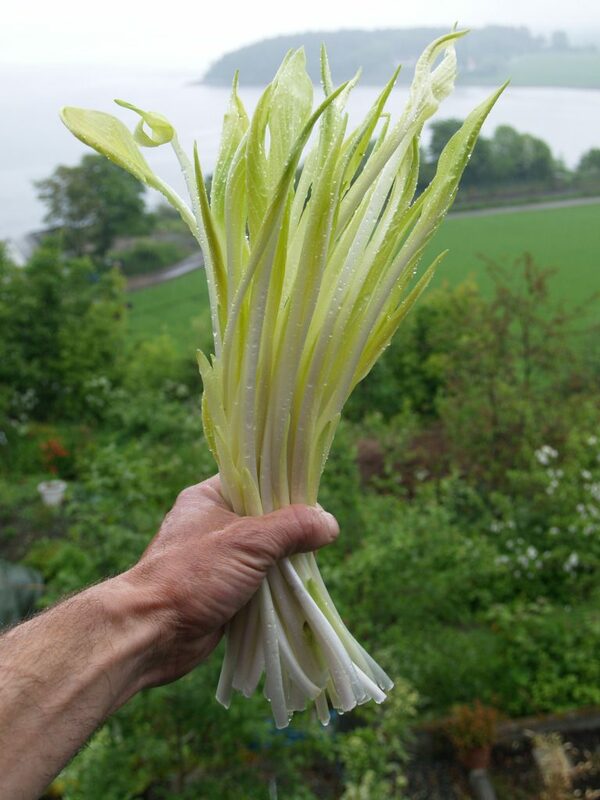 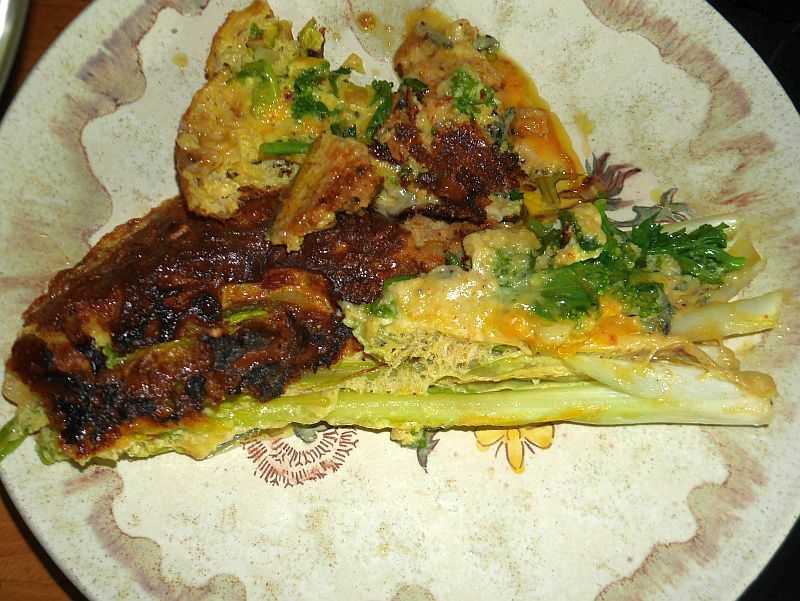 The day afterwards, I ate the rest lightly fried with garlic and chili in an omelette with sea kale broccolis! 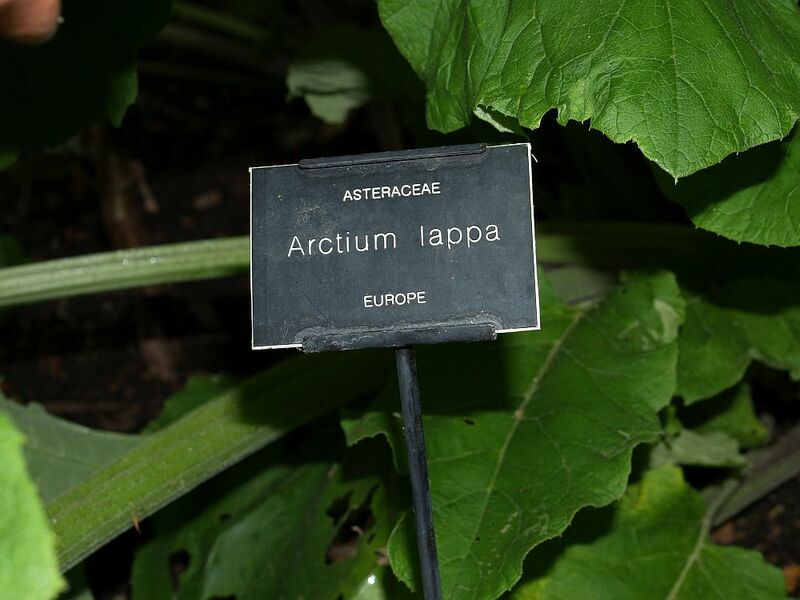 I’m sure you can use any Hosta for this. 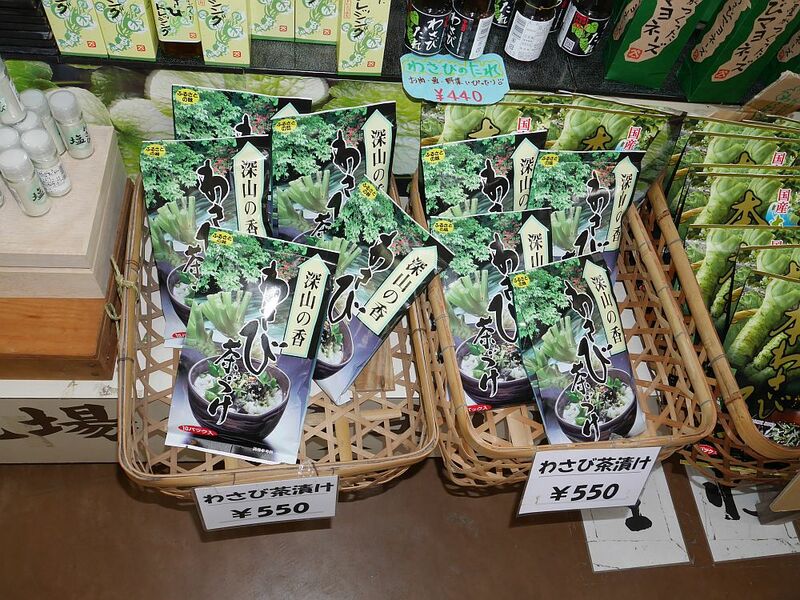 In Japan, Hosta montana is the main species cultivated for the markets. 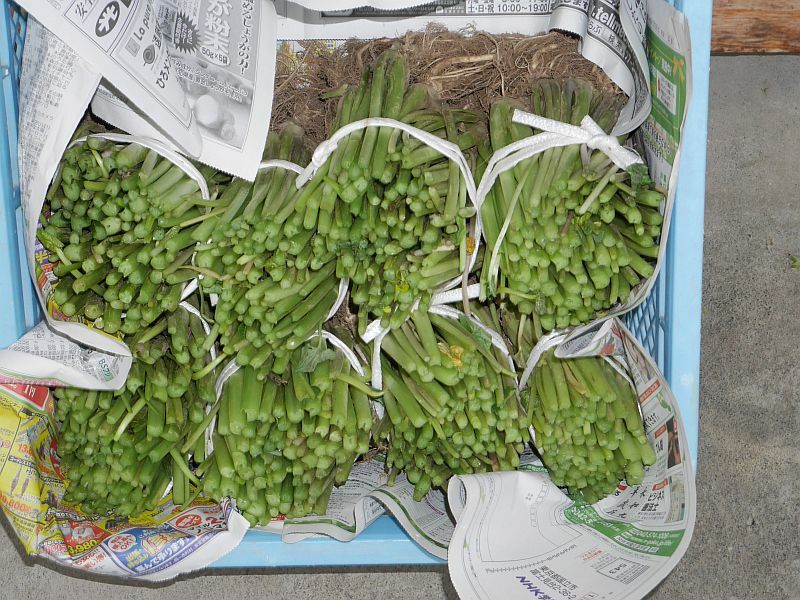 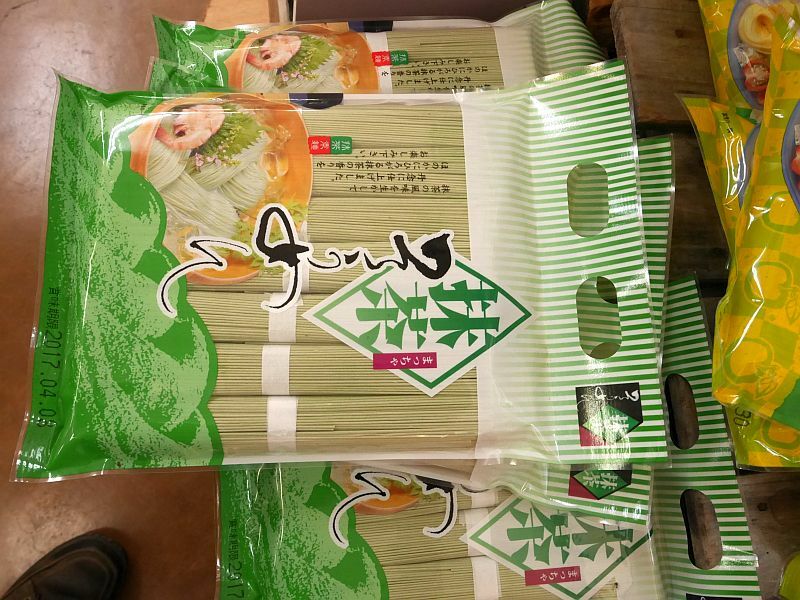 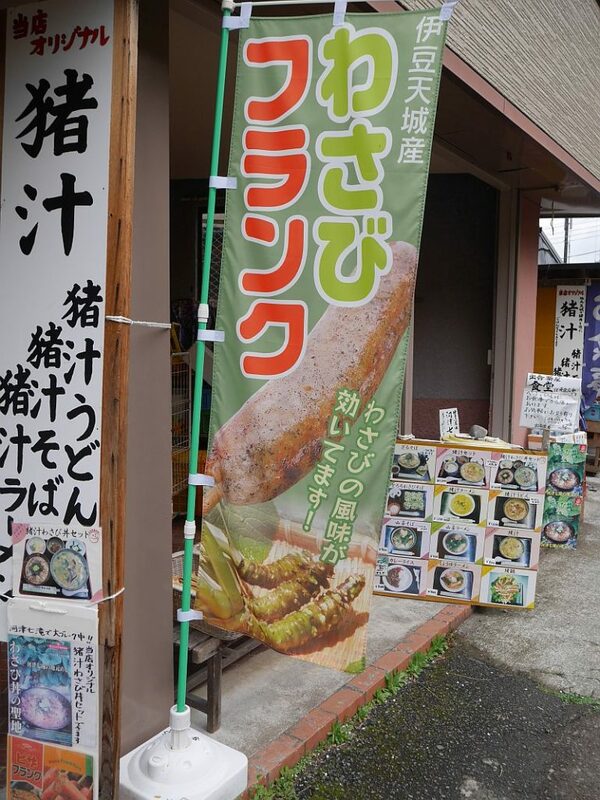 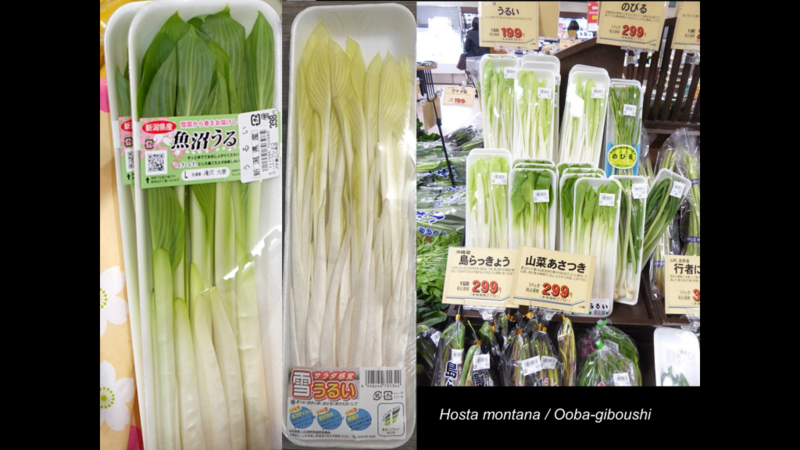 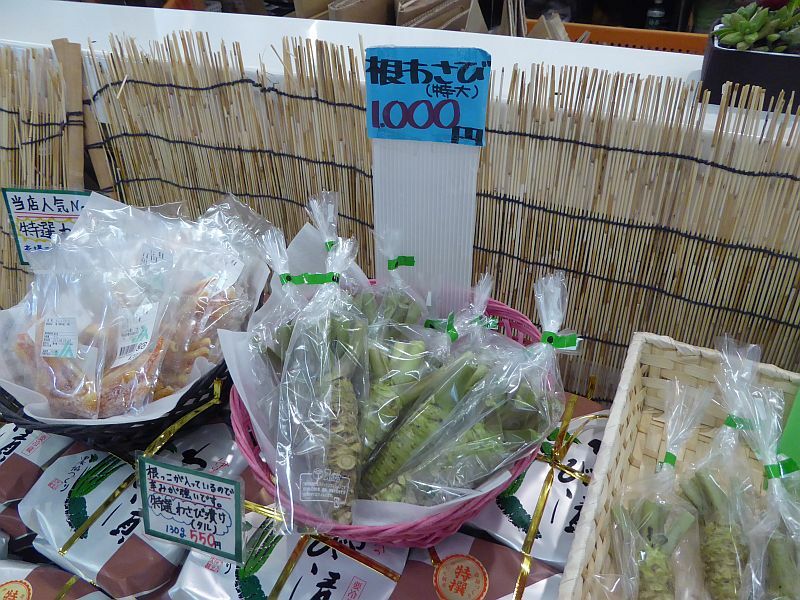 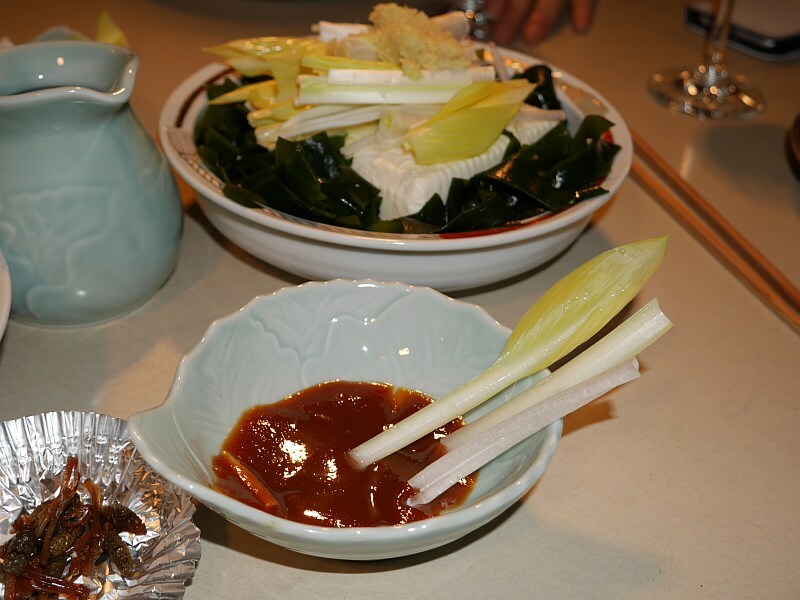 We found blanched Hosta shoots or urui in all the supermarkets in late march / early april during my study trip to Japan. 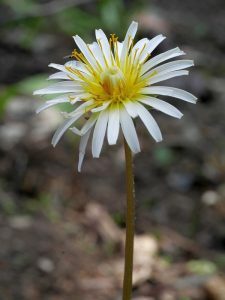 However, H. montana is not an accepted species name by the Plant List (plantlist.org) and is often given as a variety, H. sieboldiana var montana or var gigantea. 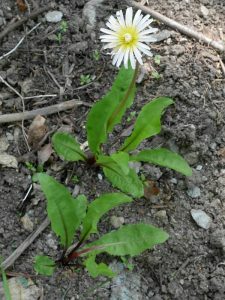 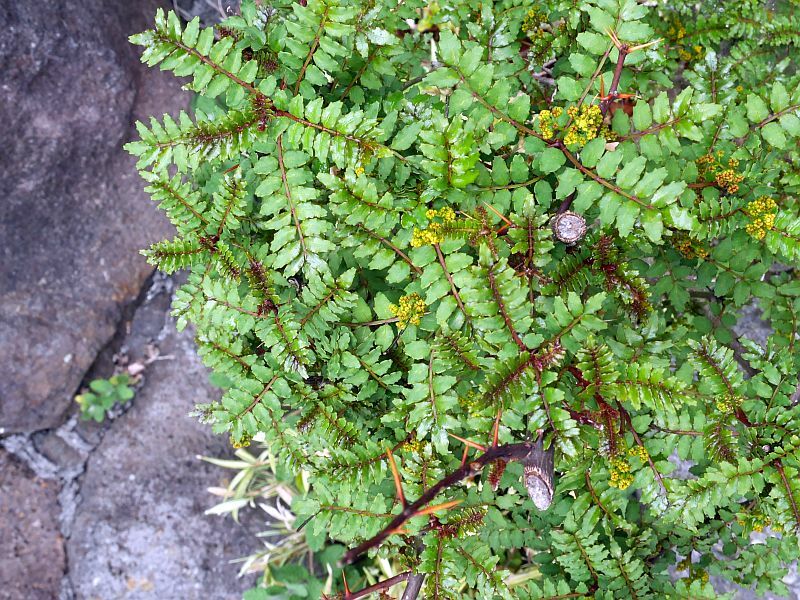 However, on the taxonomy account at http://www.hostalibrary.org/species/pdf/species_part1.pdf, it is stated that H. montana is so obviously different from H. sieboldiana that even the average gardener can tell them apart! 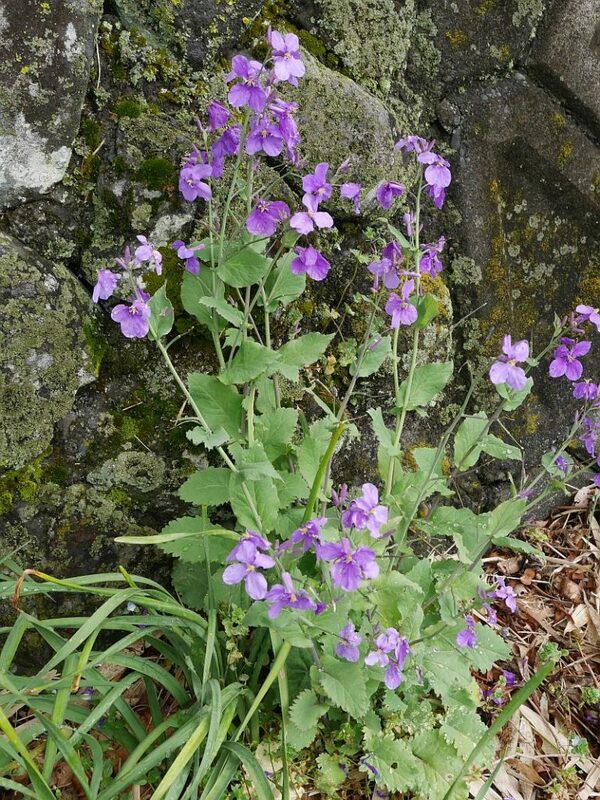 For this reason, I used H. montana in my book as it is still commonly used in horticulture. 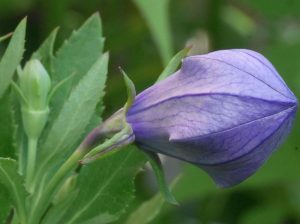 For a list of cultivar names known as H. montana, see http://myhostas.be/db/hostas/montana. 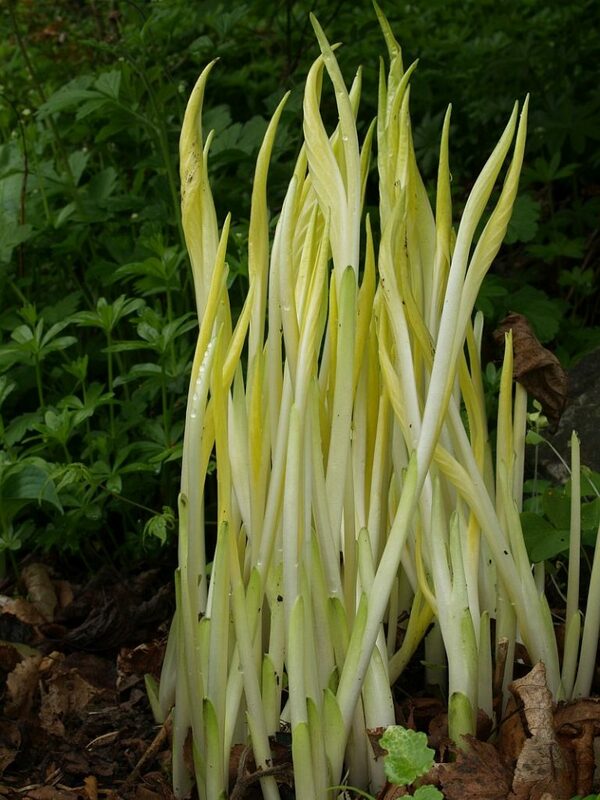 Hosta undulata is also noted on the Japanese Hosta wiki page as being used. 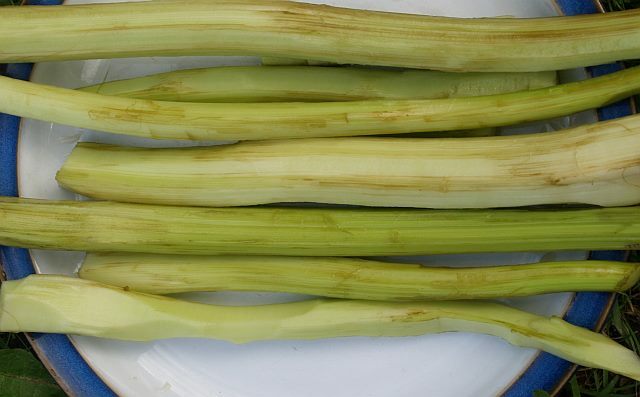 This is no longer accepted as a species and is considered to be a group of cultivars H. “Undulata” (see http://myhostas.be/db/hostas/undulata for a list of cultivars associated with Undulata). 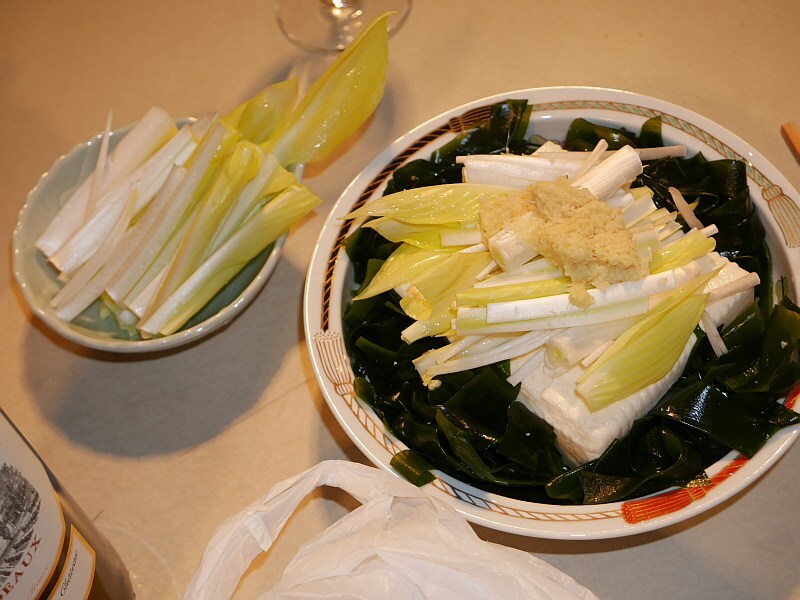 On the Japanese Hosta wiki (translated with Google translate), the main producing area for urui is given as Yamagata prefecture (north of Tokyo on the other side of Honshu), which ship light green young shoots which are used for salads , pickles , stir-fry , with miso sauce , vinegar miso , miso soup , mixed rice , sushi rolls etc. 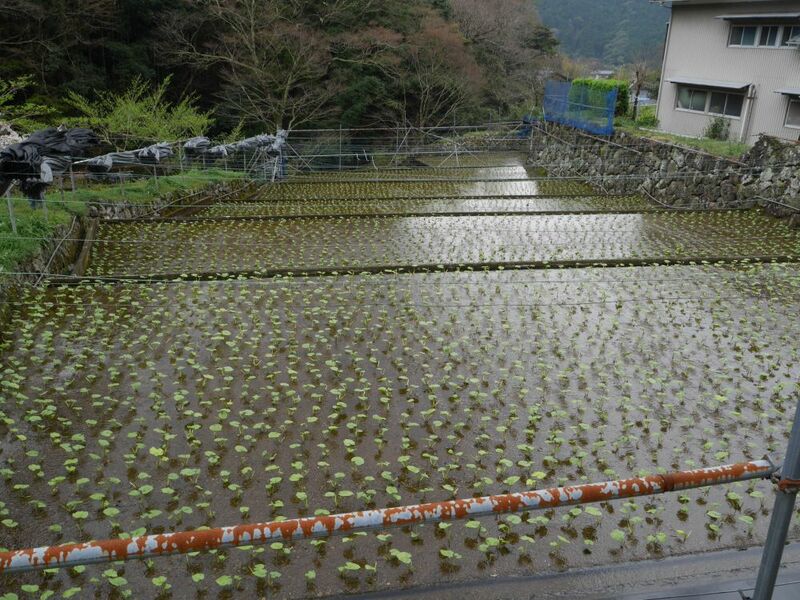 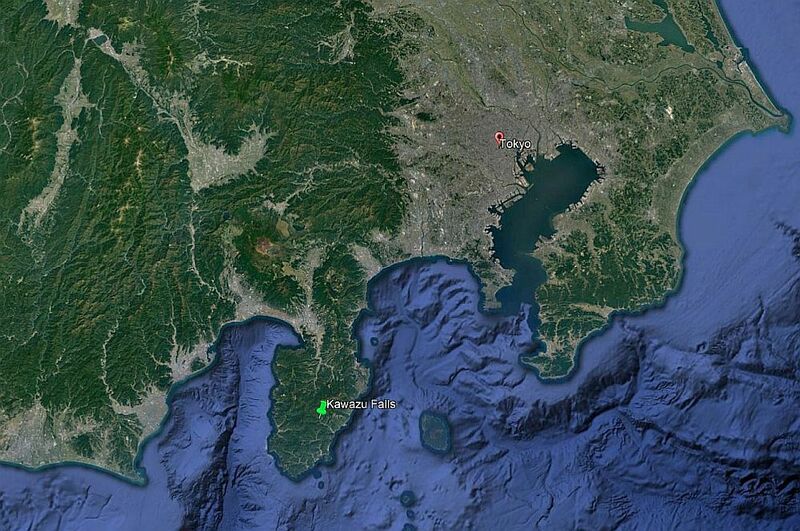 This explains why we didn’t see the production of Hosta during our farm trips south of Tokyo. The Japanese name is 雪うるい (yuki urui) which means snow leaf or icicles (google the Japanese name to see many pictures). 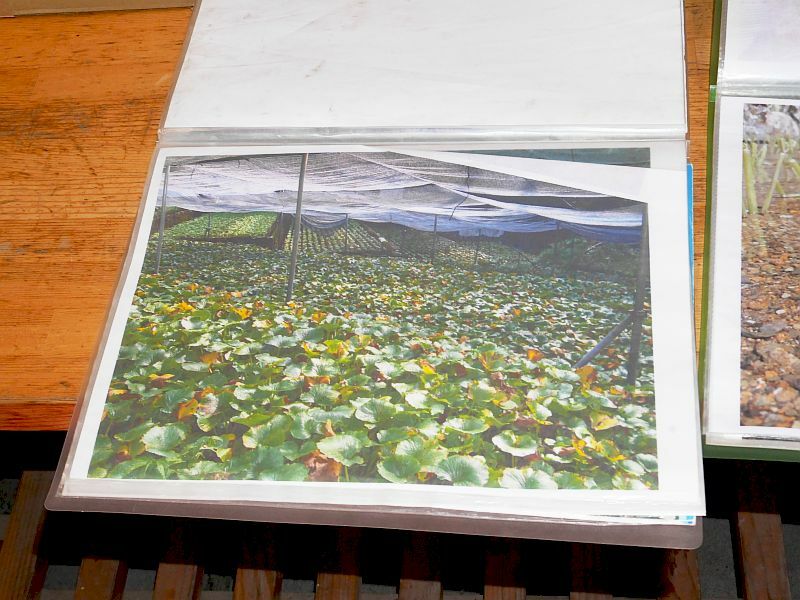 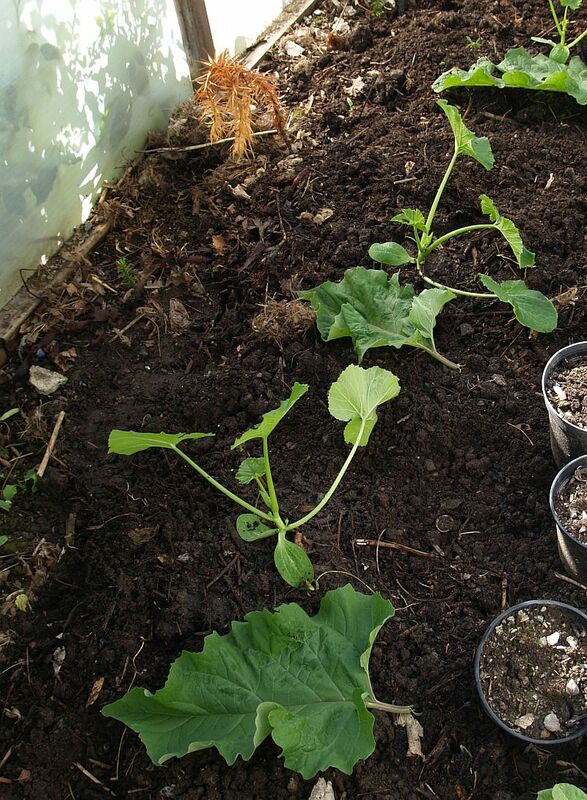 They are produced in darkened greenhouses for an extended season or the rows are mounded outdoors. 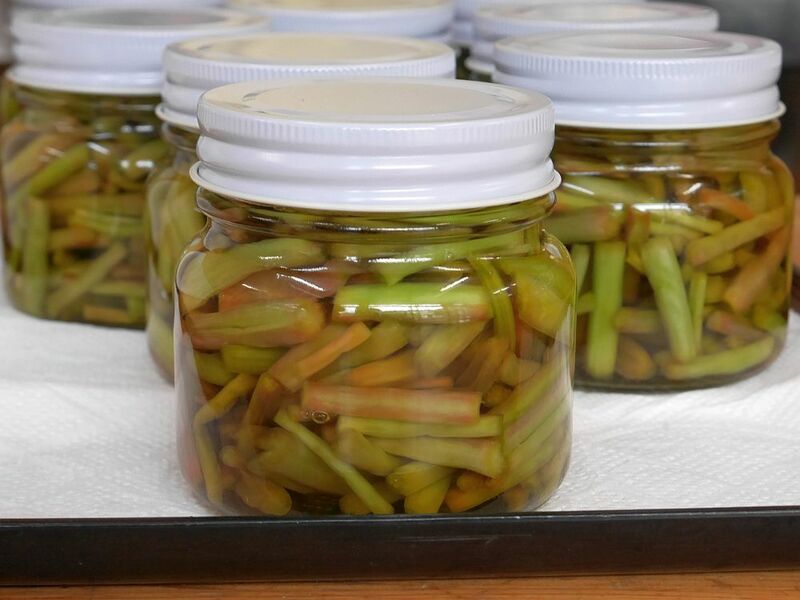 The production techniques seem to be different judging by the colour of the urui sold in supermarkets. 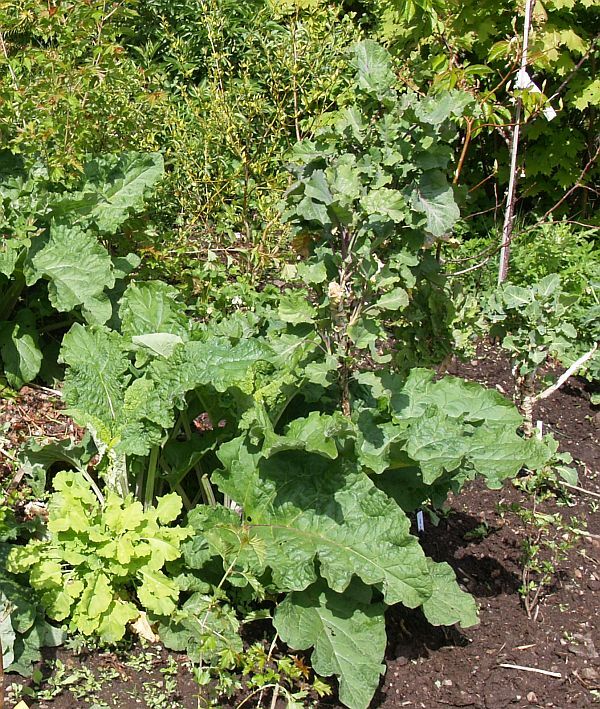 One of my favourite multi-purpose vegetables and one of my first unusual vegetables that I grew in my garden in the 80s was burdock or borre, more specifically various Japanese cultivars of Arctium lappa, hardly used in Europe and North America apart from a few foragers, even though it’s a common wild plant and hardy. 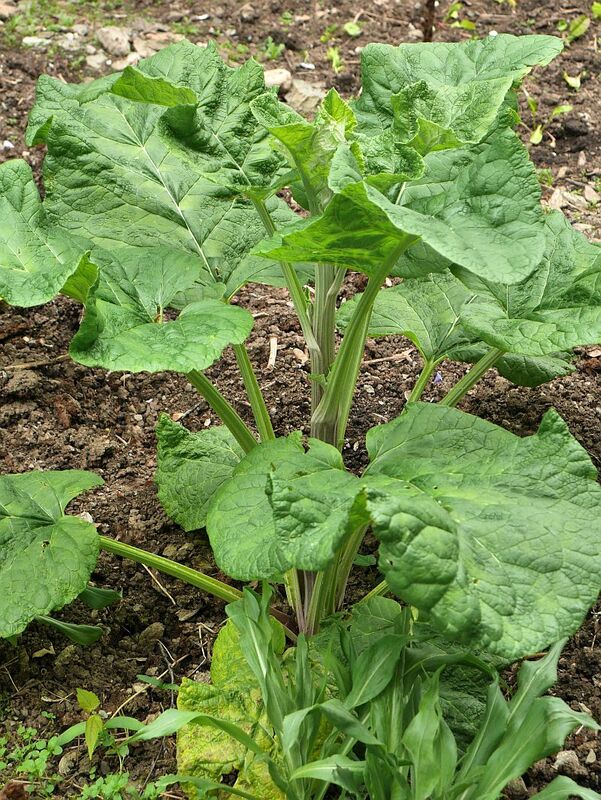 Although it is best known as a root vegetable, there are varieties bred for their leaf petioles and the flower stems are really delicious! 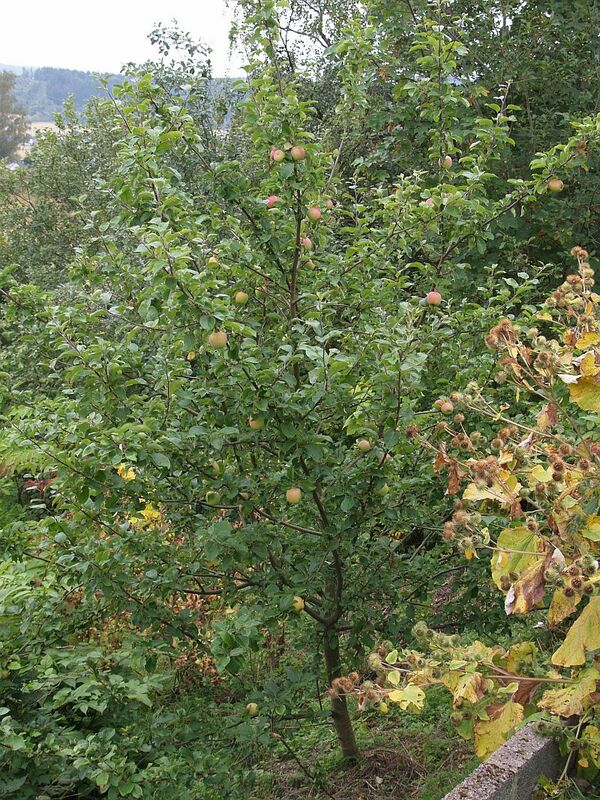 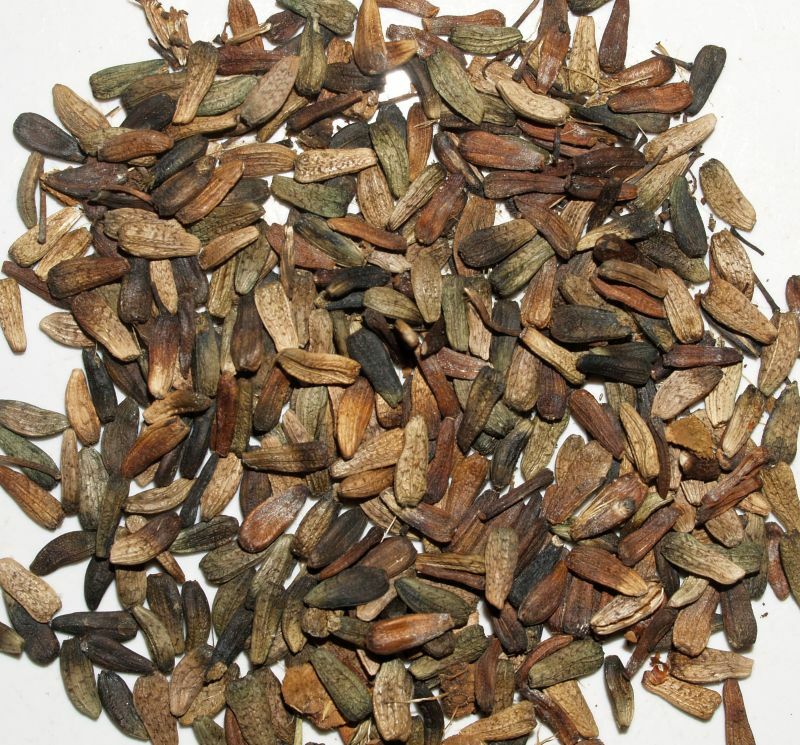 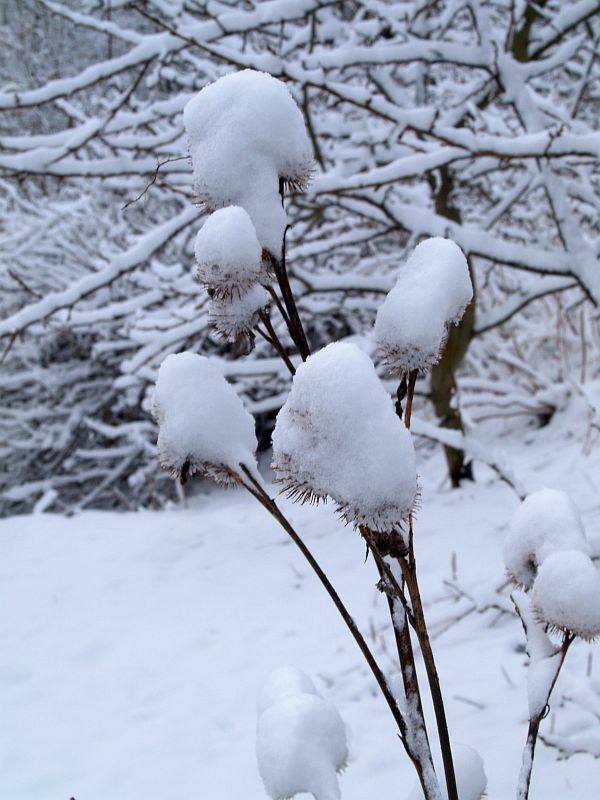 If you add to this that the seeds are foraged by various birds like goldfinches and greenfinches in winter in addition to being impressive photogenic plants which tolerated shady conditions, no permaculture garden should be without them! 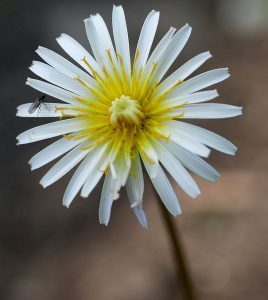 In the album below are pictures I’ve taken over the years, in my garden, in botanical gardens and in the wild. 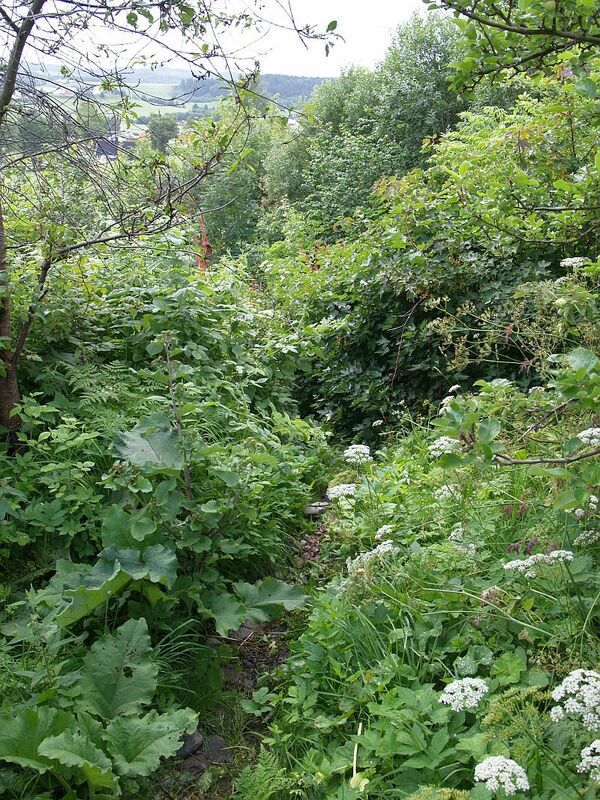 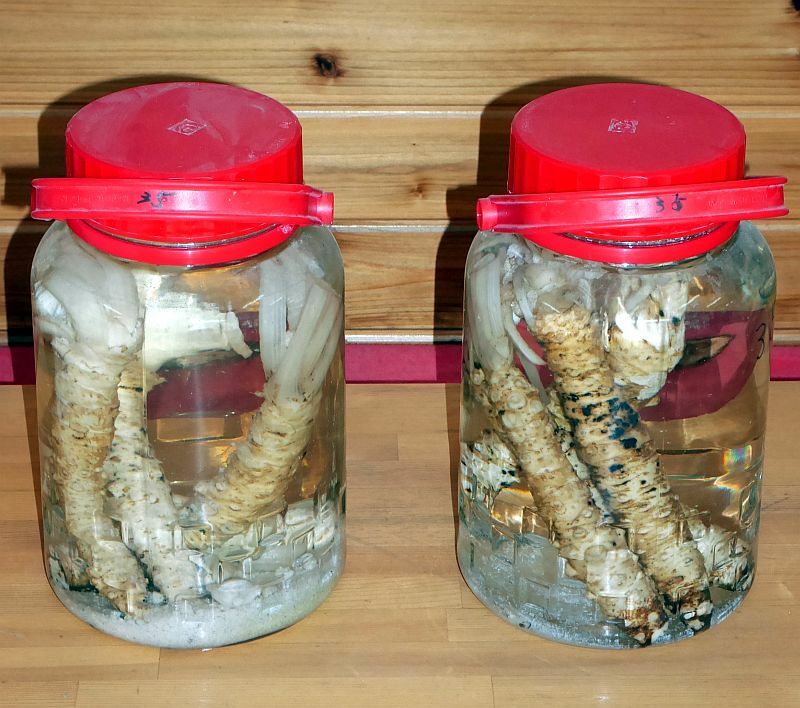 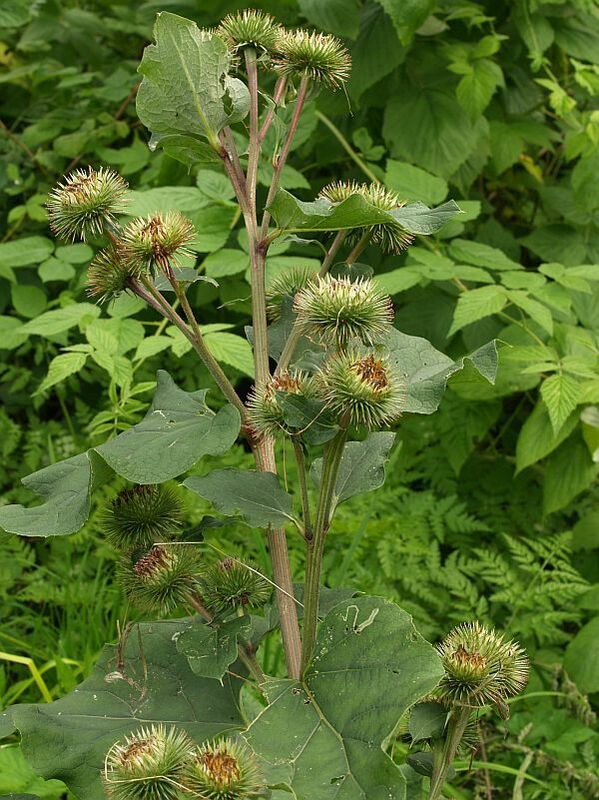 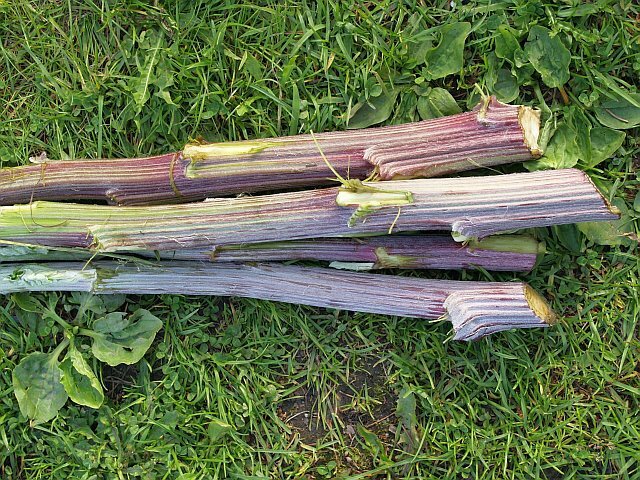 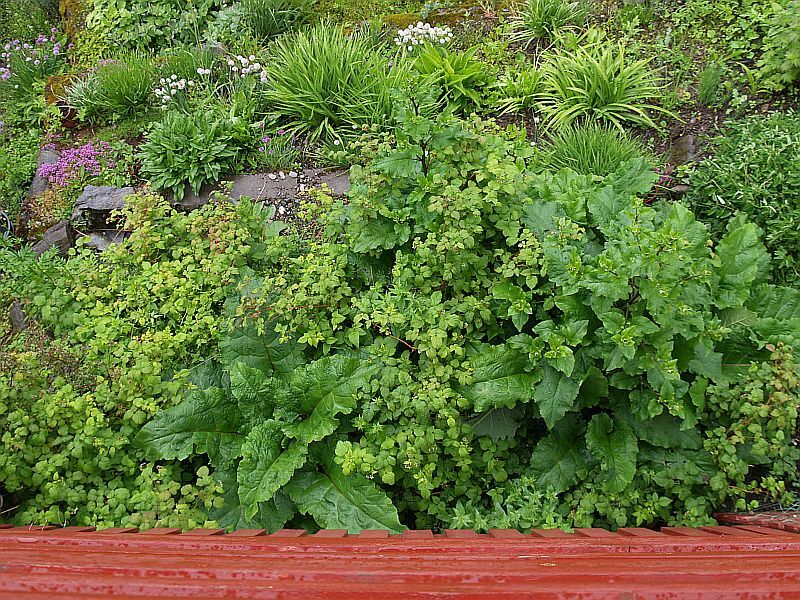 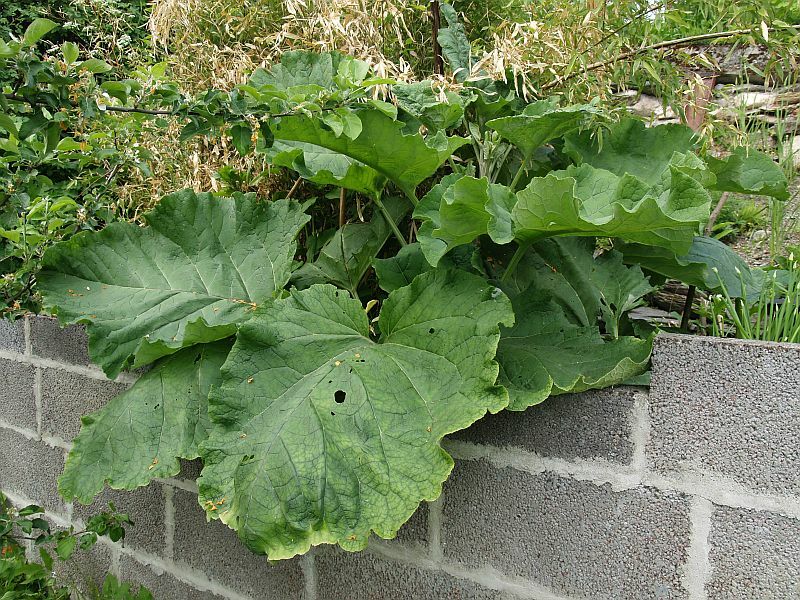 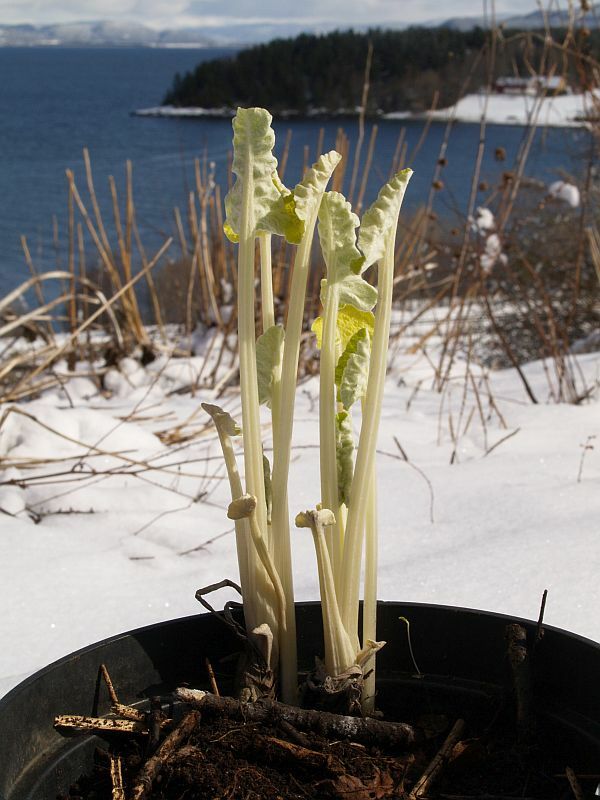 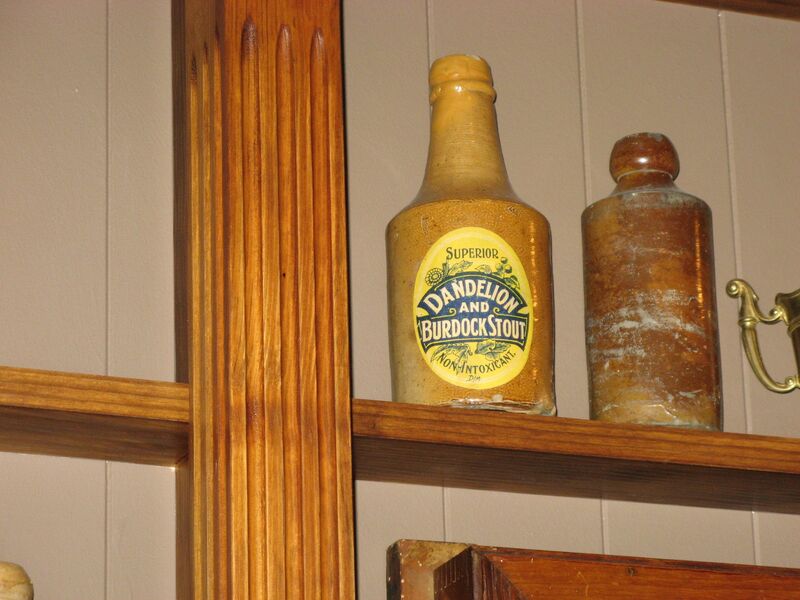 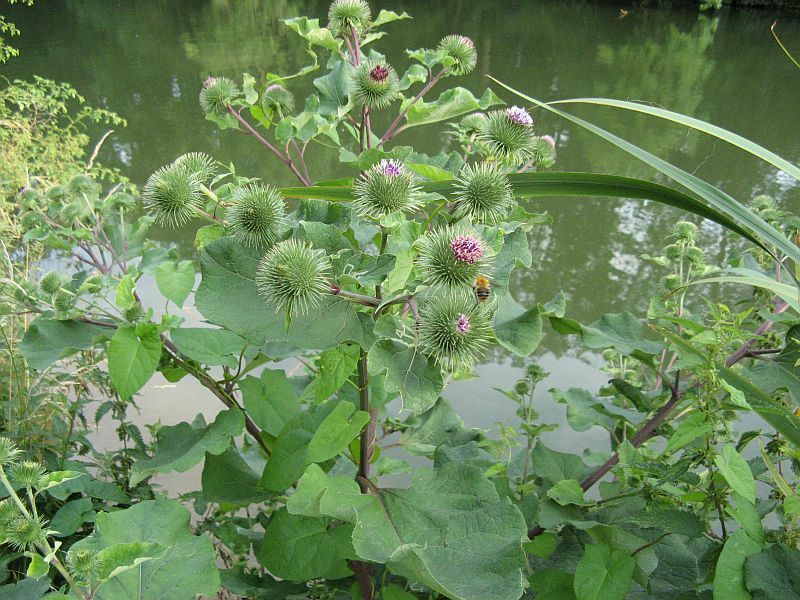 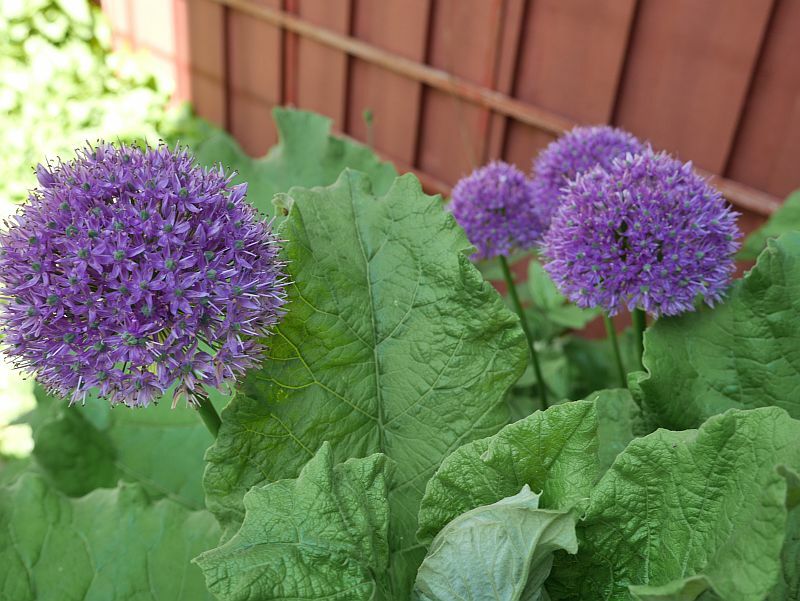 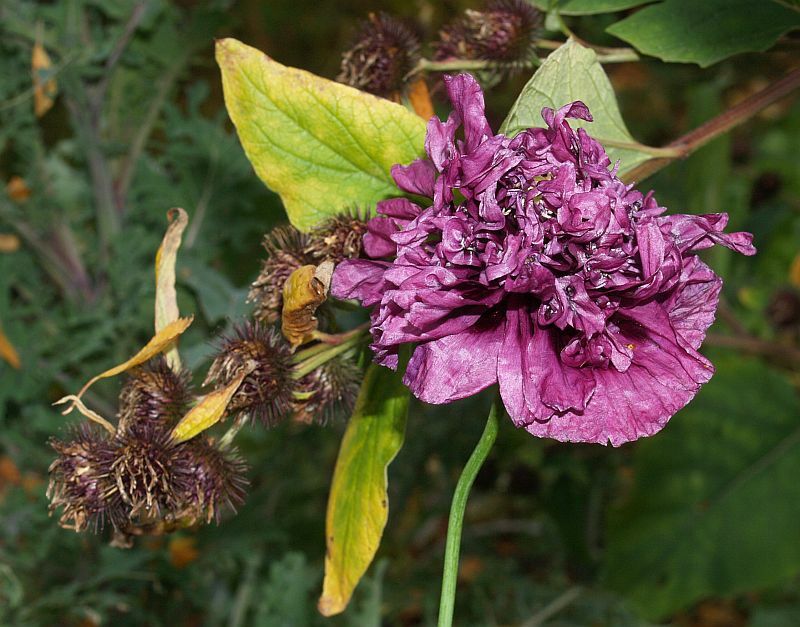 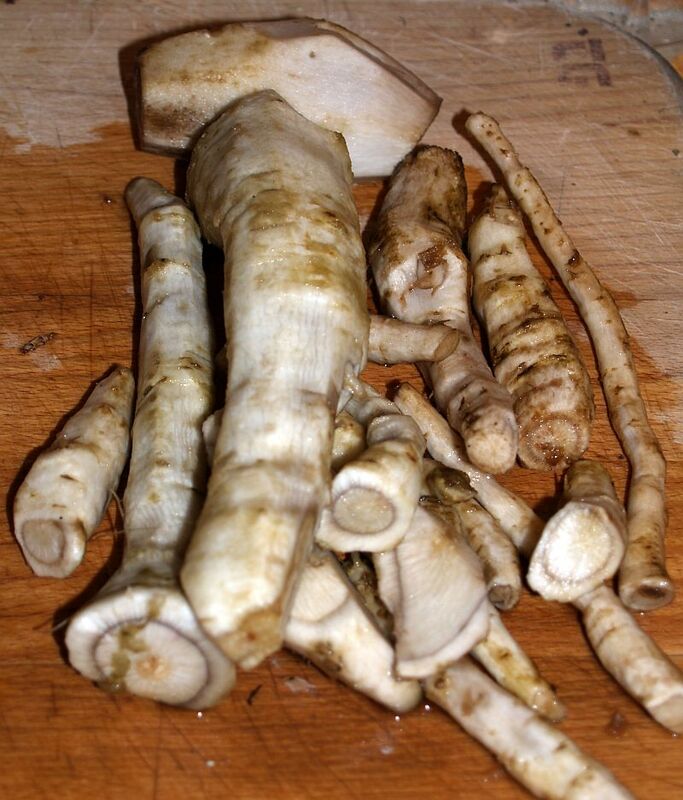 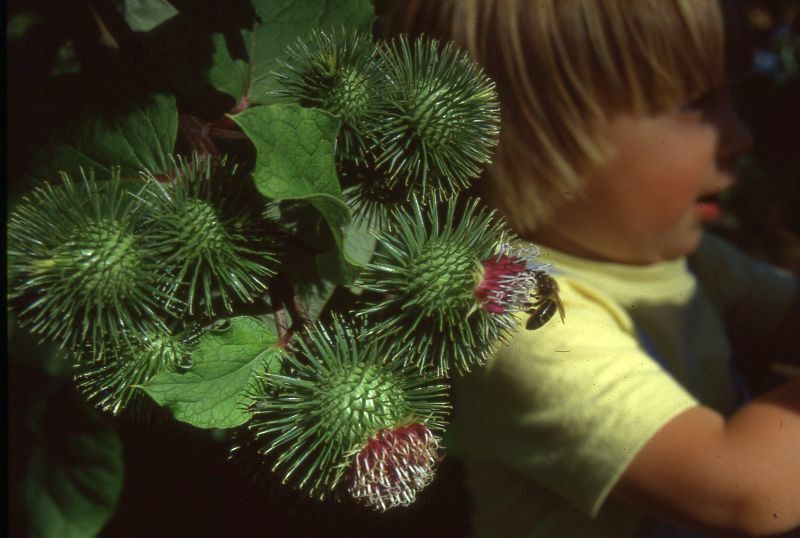 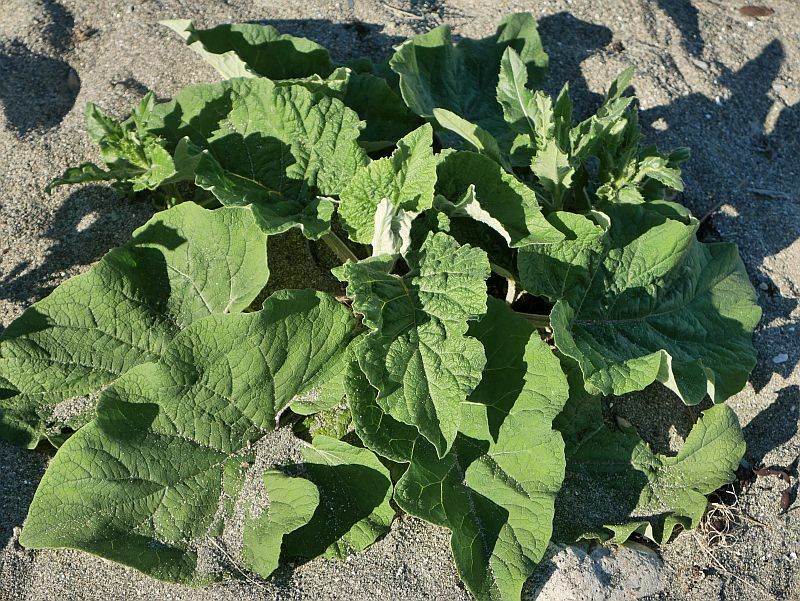 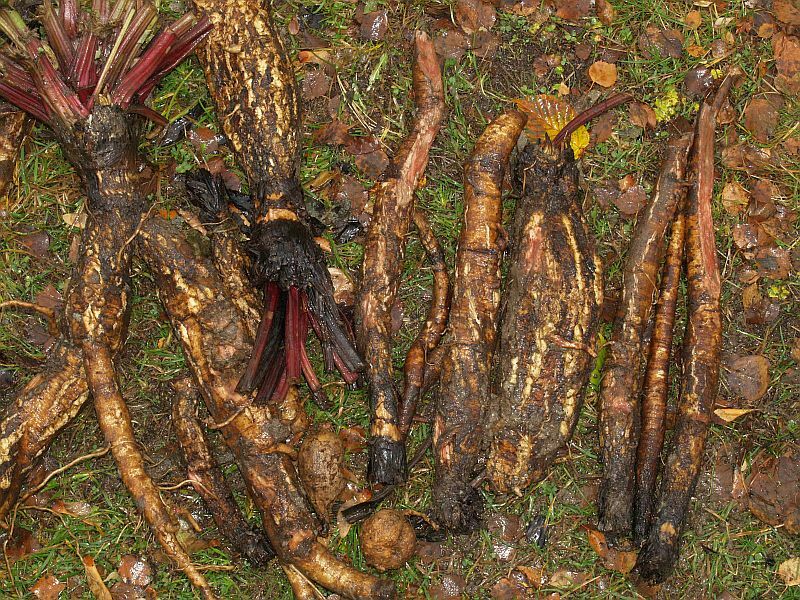 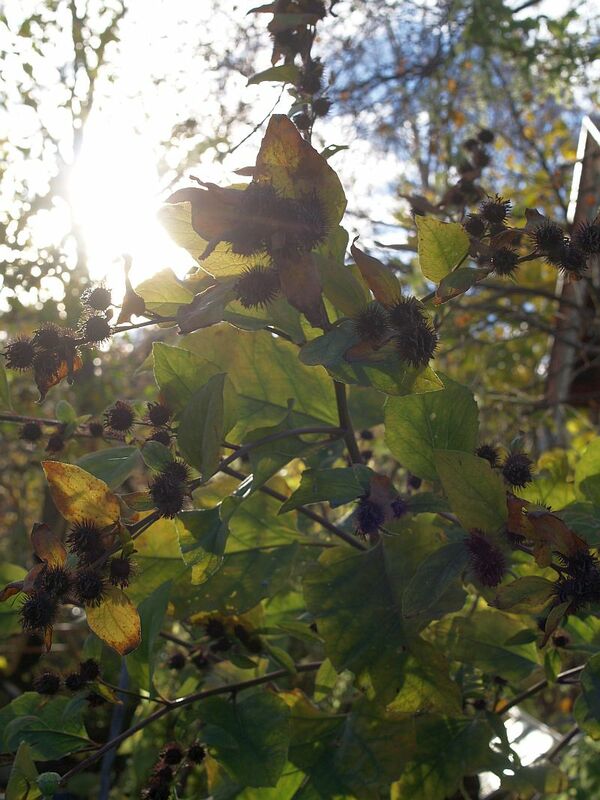 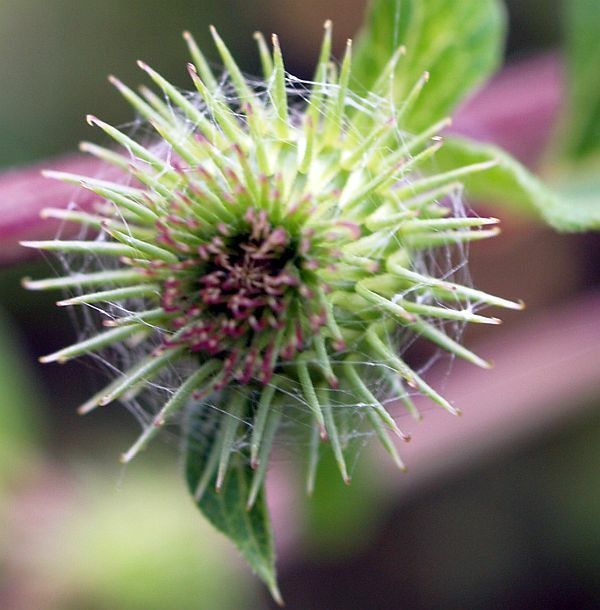 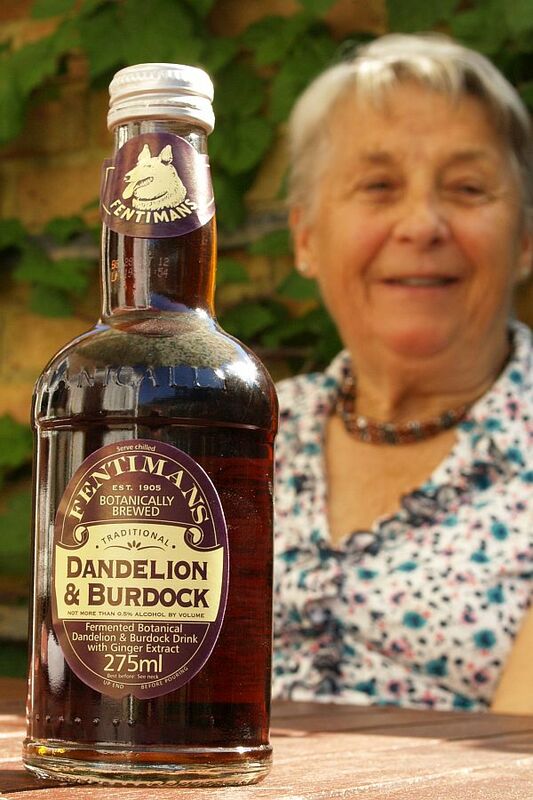 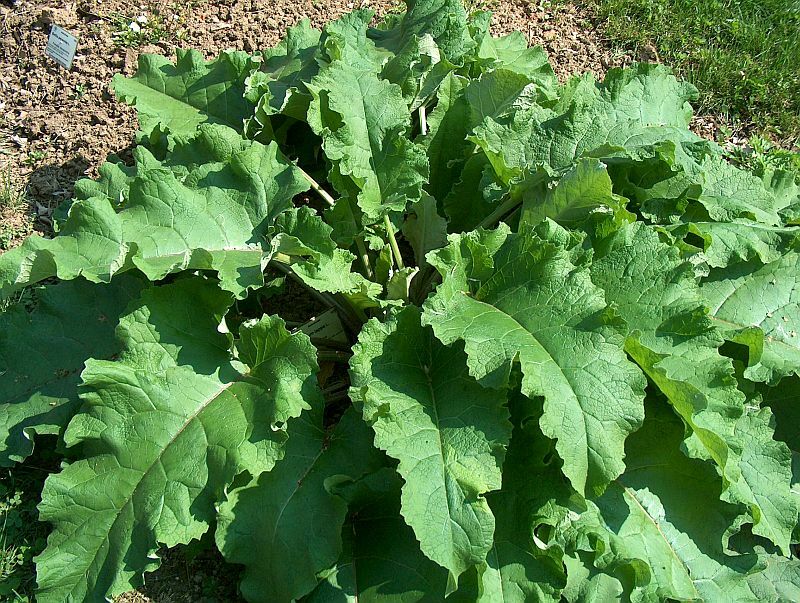 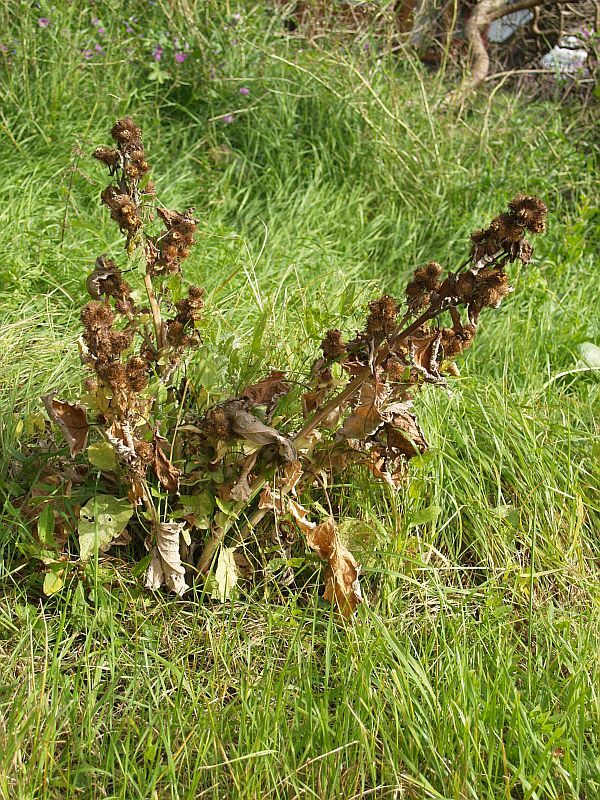 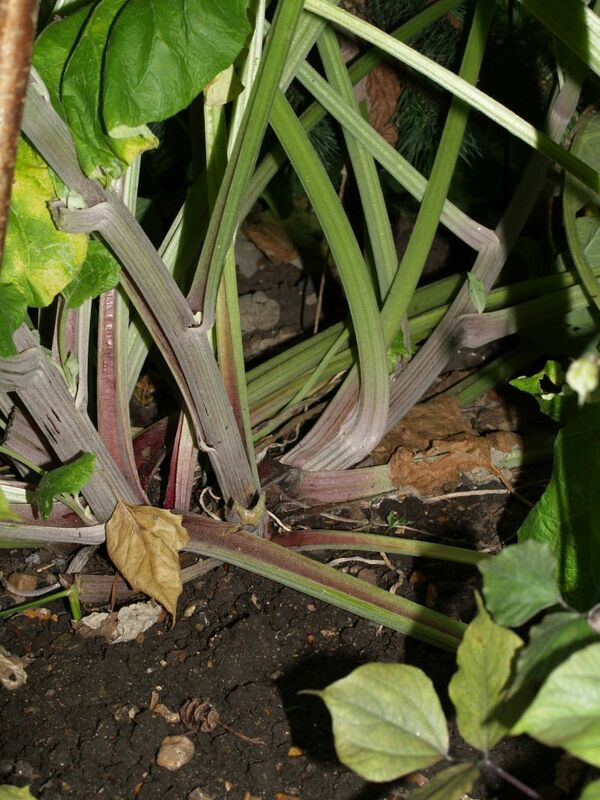 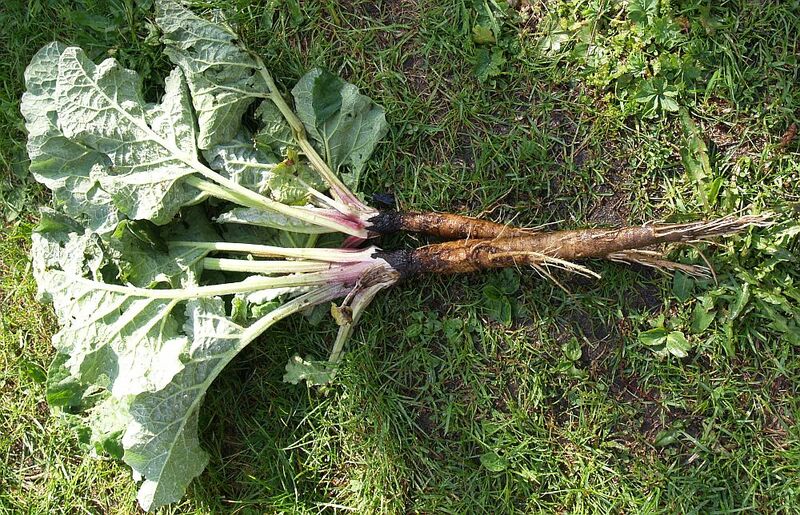 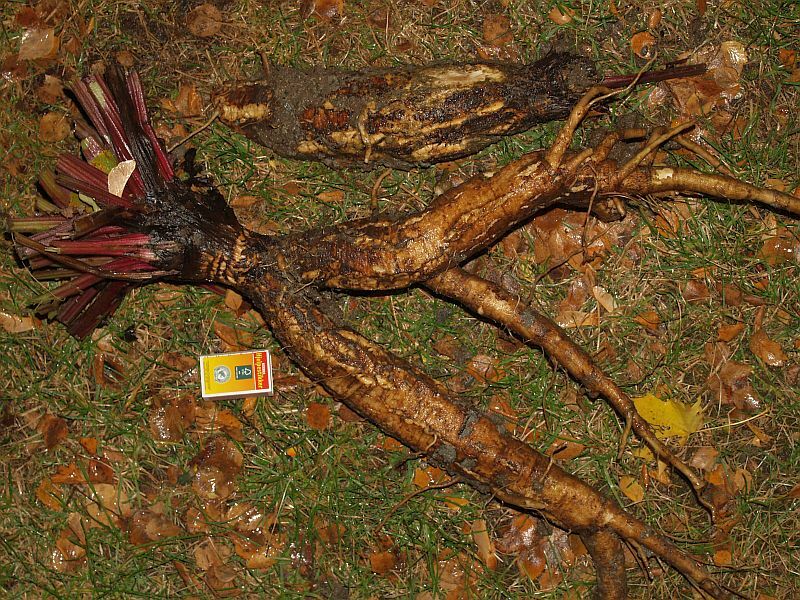 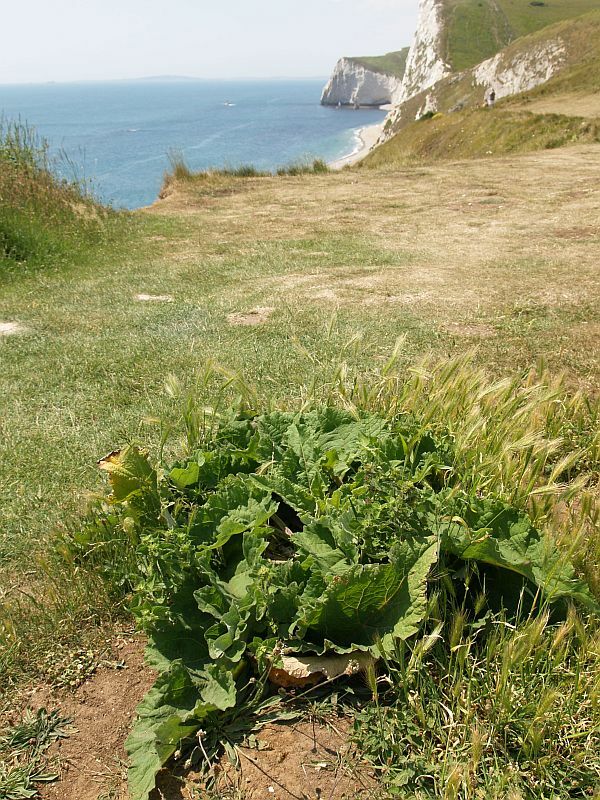 There follows links to various blog posts about burdock! 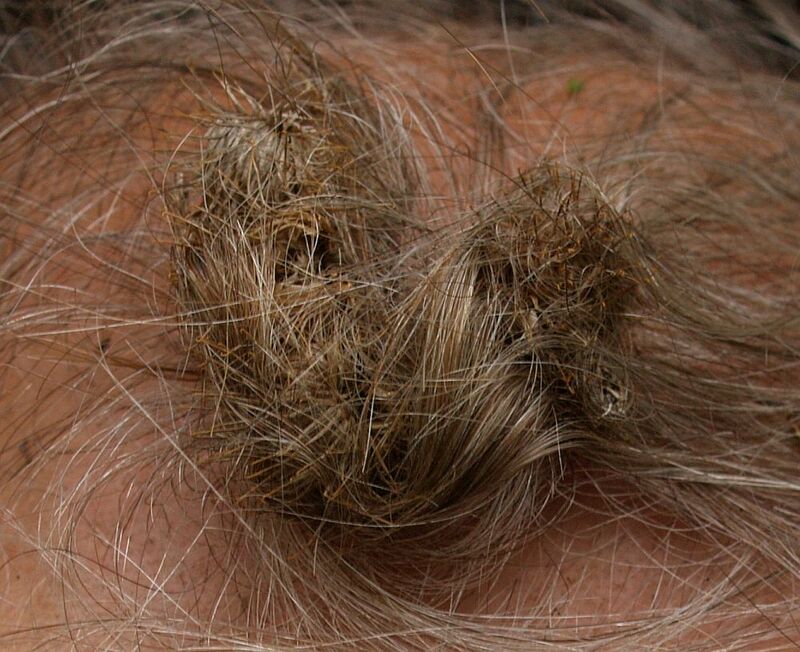 Not a good idea to get “burrs” in your hair! 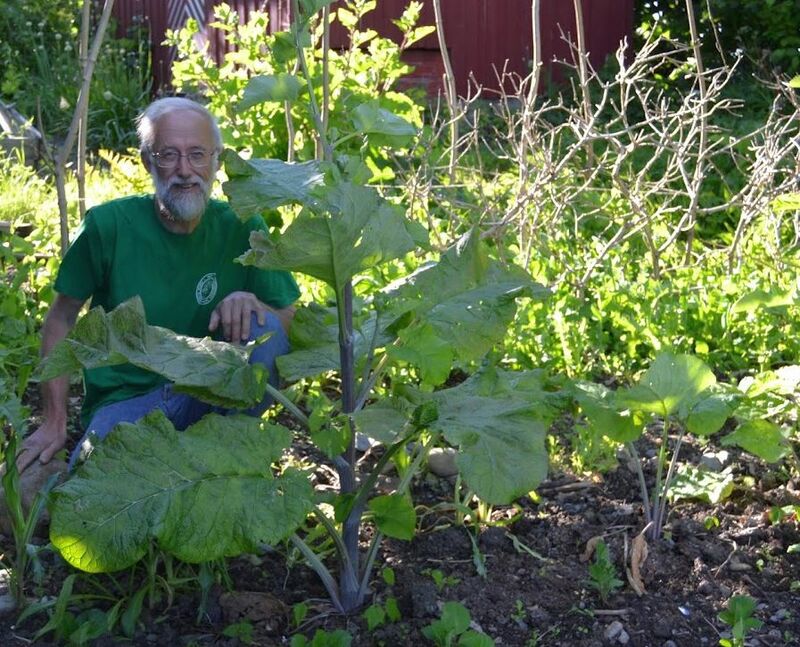 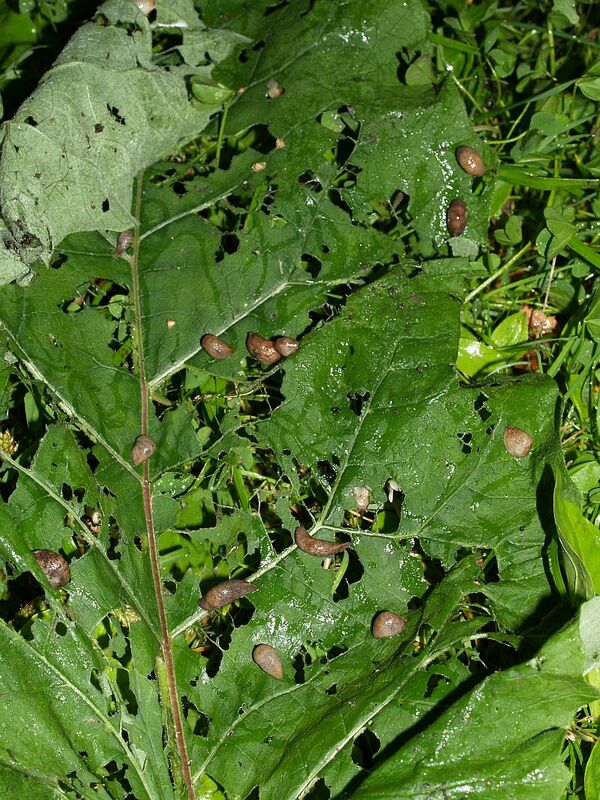 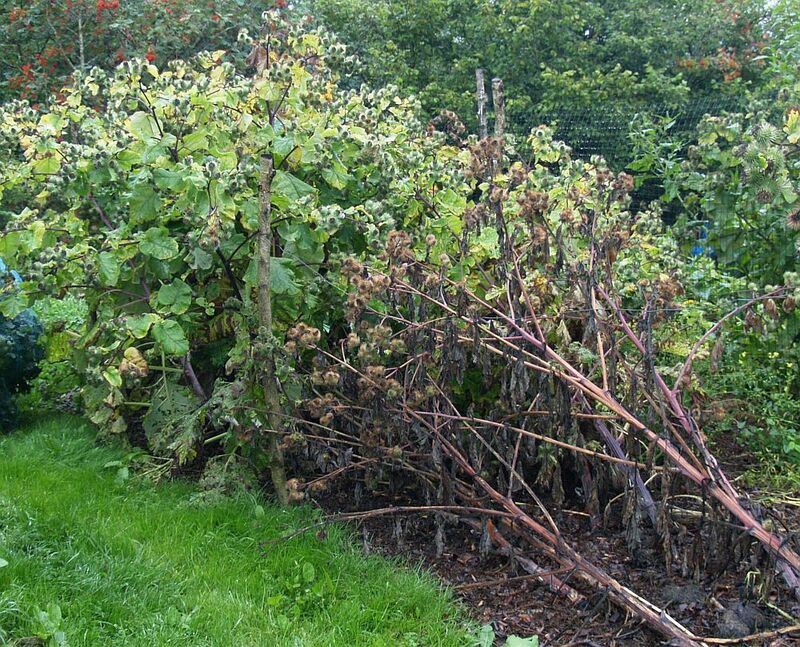 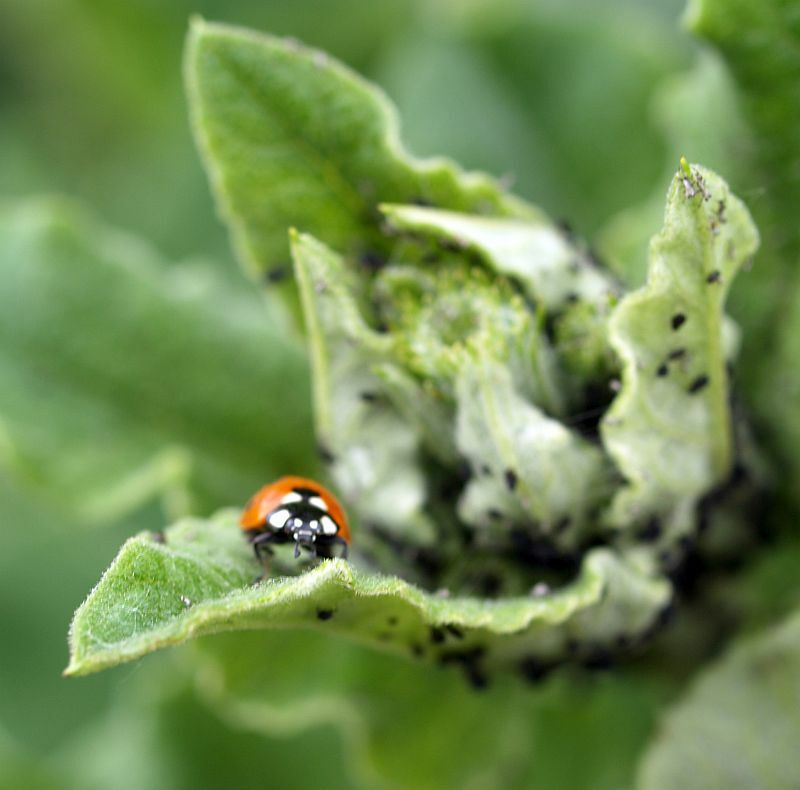 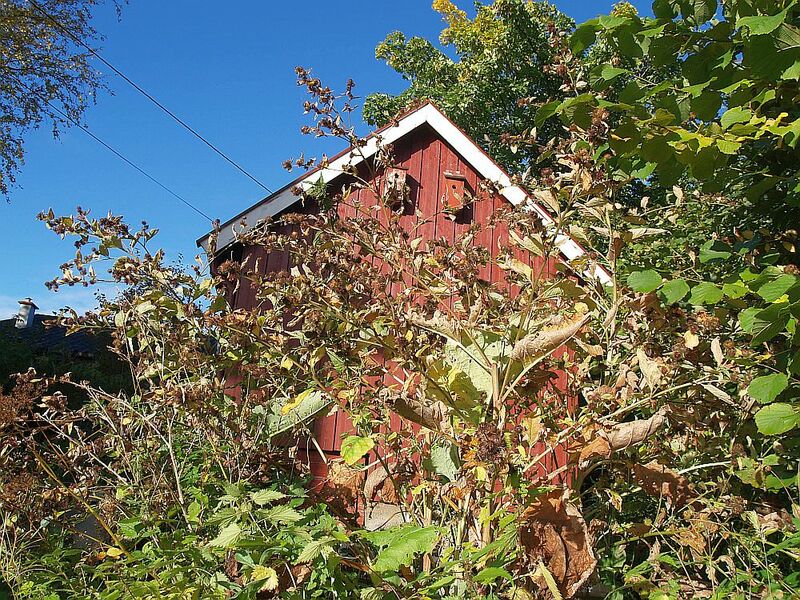 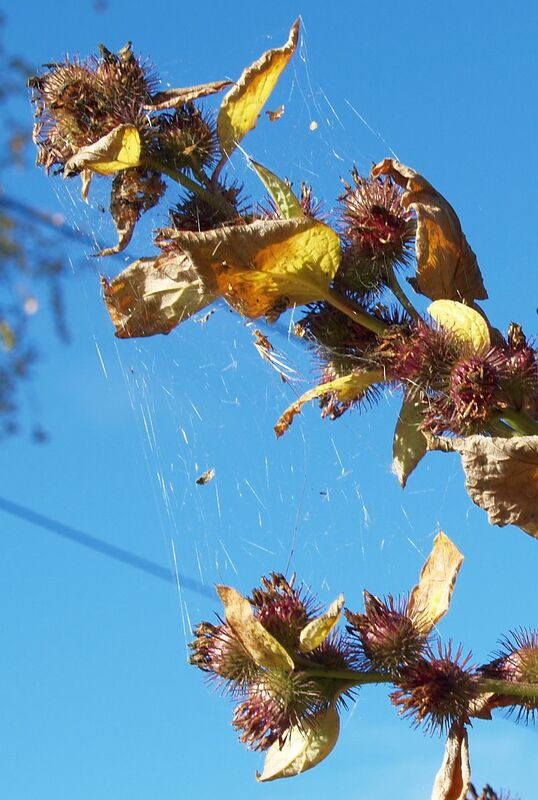 Burdock loves life under my apple tree, but the burrs get in the way of harvesting! 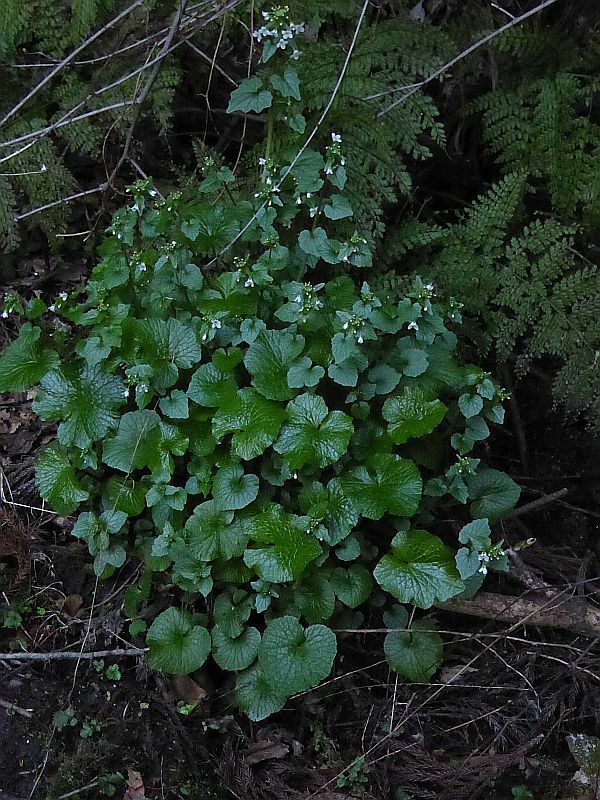 They often grow wild in open woodlands! 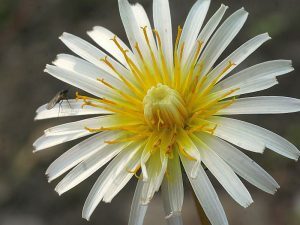 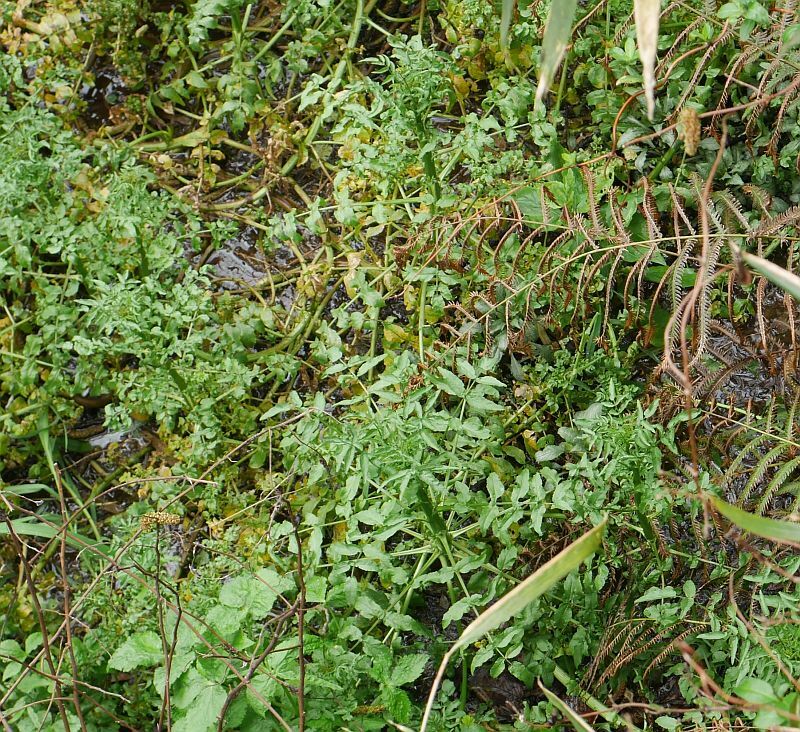 The article below, published in Grobladet in 2006 is the story (in Norwegian) of how one of the commonest spring flowers in the Mediterranean countries became one of the most important vegetables in Japan, yet was completely forgotten at home…this is the story of shungiku, the edible-leaved Chrysanthemum, Glebionis coronaria. 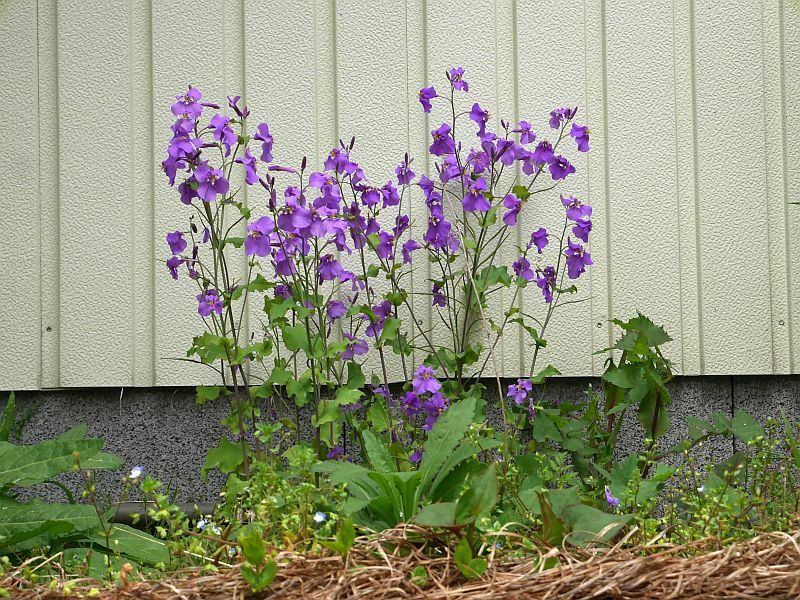 Grobladet was the magazine of Oikos, Norway’s biggest organic organisation.